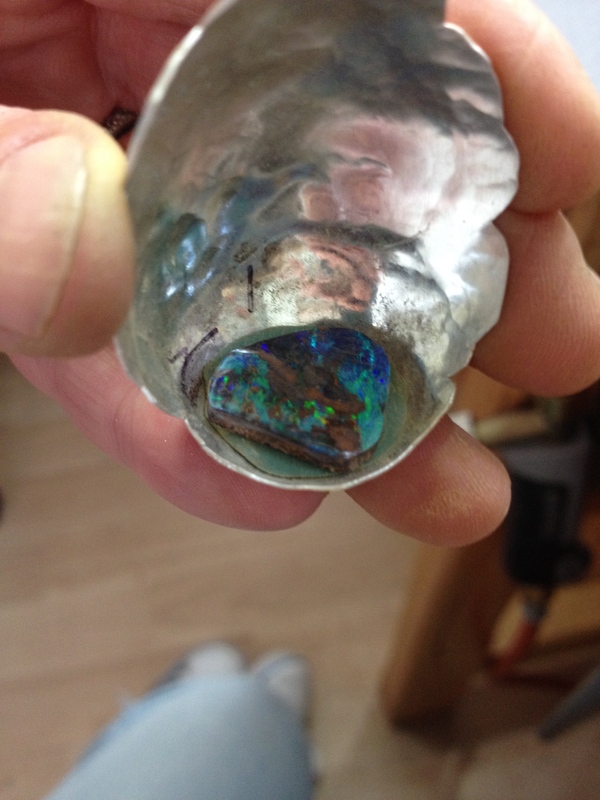 I have rather lovely Boulder Opal which was brought back from Australia for me. 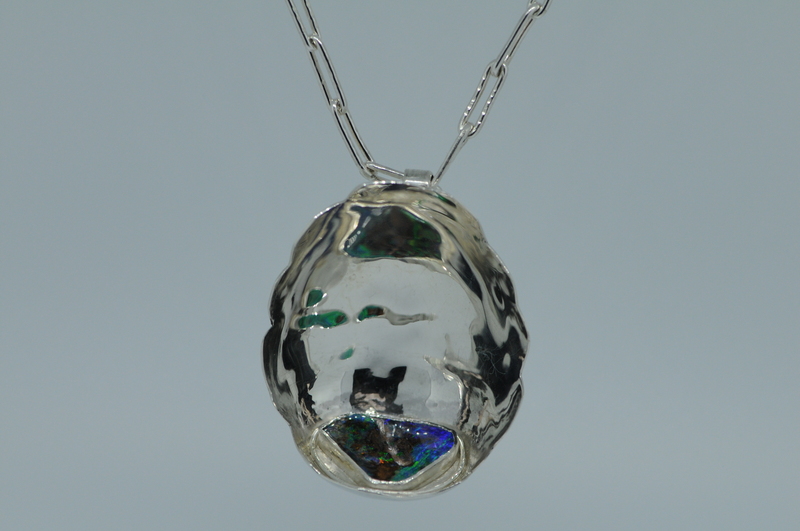 This isn’t the best picture of the Opal. It’s much more blue. It reminds me of a pool of water and I would like to capture the natural feel of the stone. 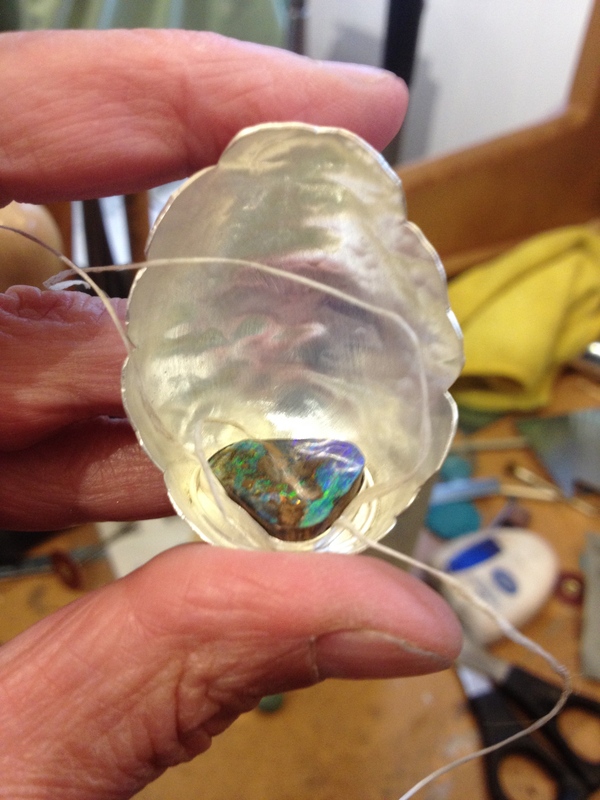 I want the piece to reflect the colours of the opal but at the same time cocoon it and keep it safe. 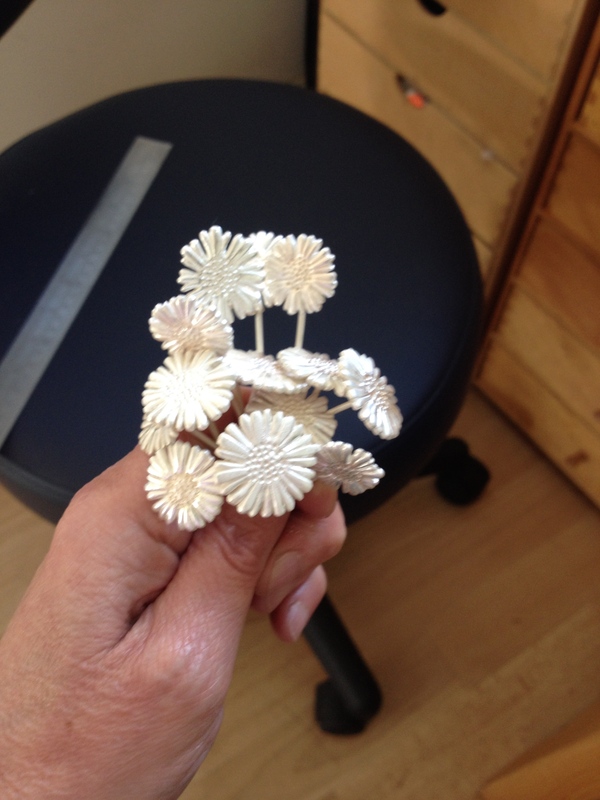 Those that know me will understand my reluctance to create an “organic’ piece of jewellery. I have seen too many pieces which are called ‘organic’ to cover up shoddy workmanship and poor finishing. I aim to have a finished piece that is neither of those things! 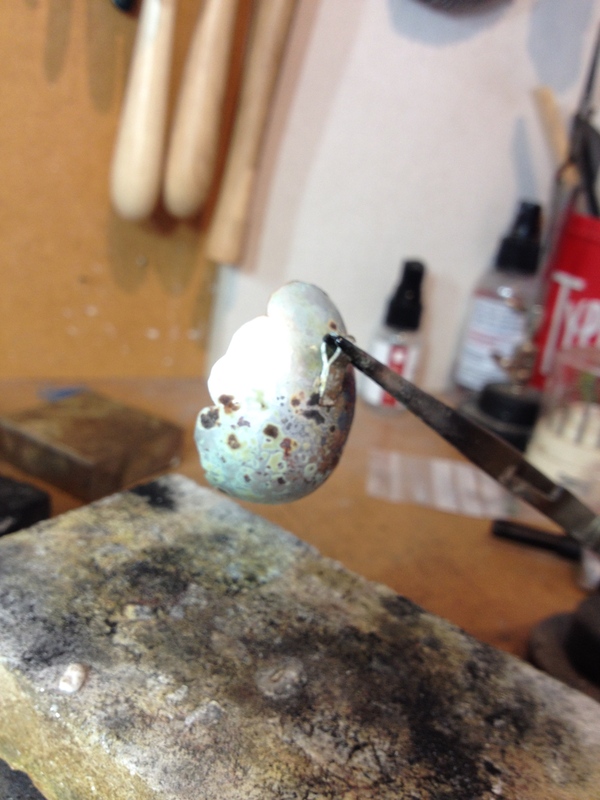 I decided I wanted to place the opal in an eggshell. 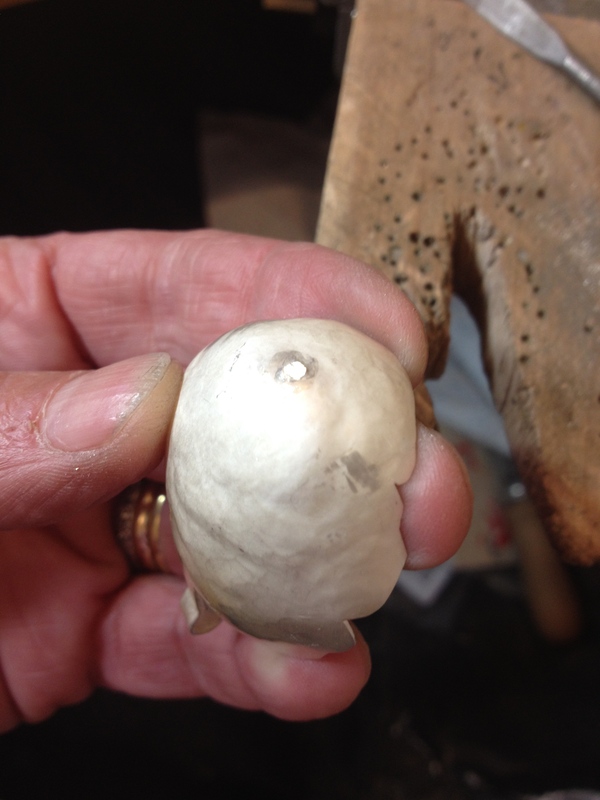 It would look like a little pool of water had gathered in the eggshell once the chick had flown. To start with I had to make the eggshell. 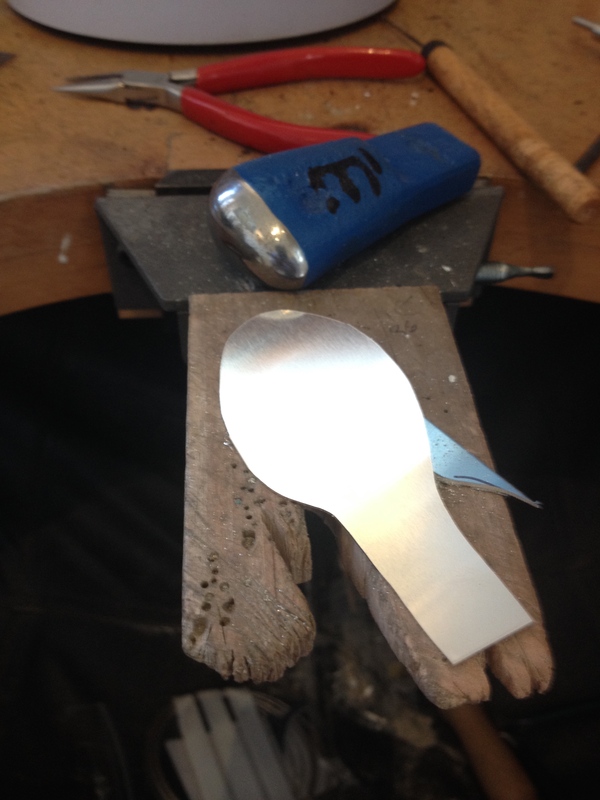 I took a sheet of 0.8mm silver and cut an egg shape with a handle out of it. I planned on using a ‘spoon stake’ to form the egg. 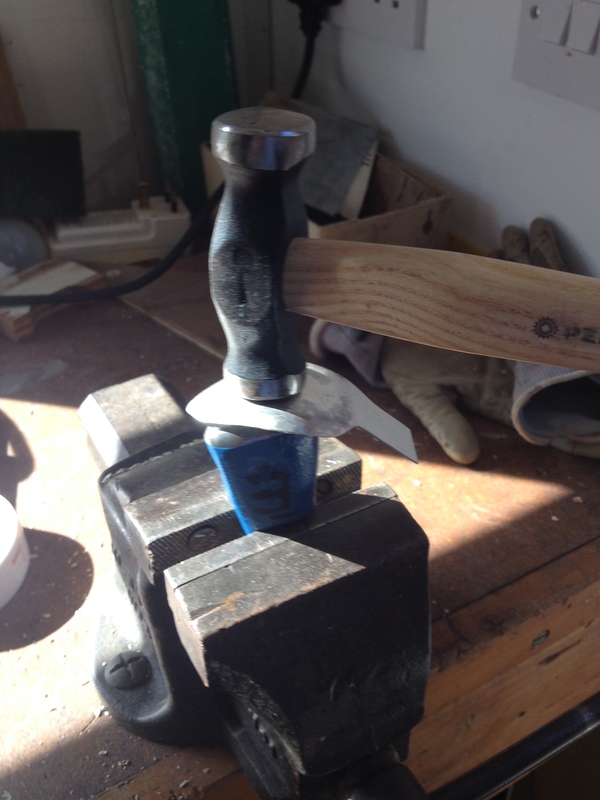 I secured the stake in the big vice, laid the silver over the top and started hammering it. I started around the edges and then moved into the centre. I pretty soon discovered that the ‘handle’ was not only unnecessary but a blinking nuisance! I cut it off! You can see the shape starting to form. 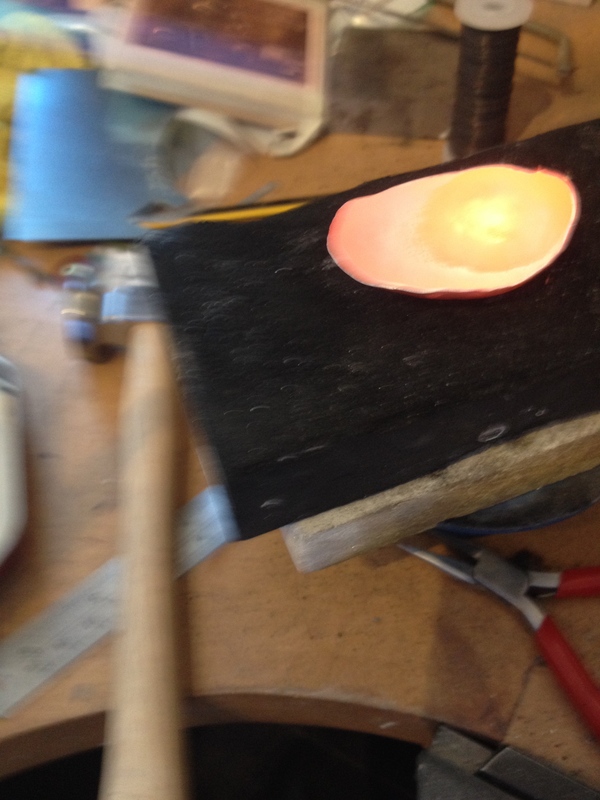 Then back to the shaping, more hammering, more annealing, more pickling. Oh, and cups of tea while pickling. Actually it’s too big.and still too shallow. I need to make it smaller and deeper. I didn’t really know how much the metal would stretch with forming so I erred on the side of caution. Drew a line using a black sharpie and the sawed off the spare. 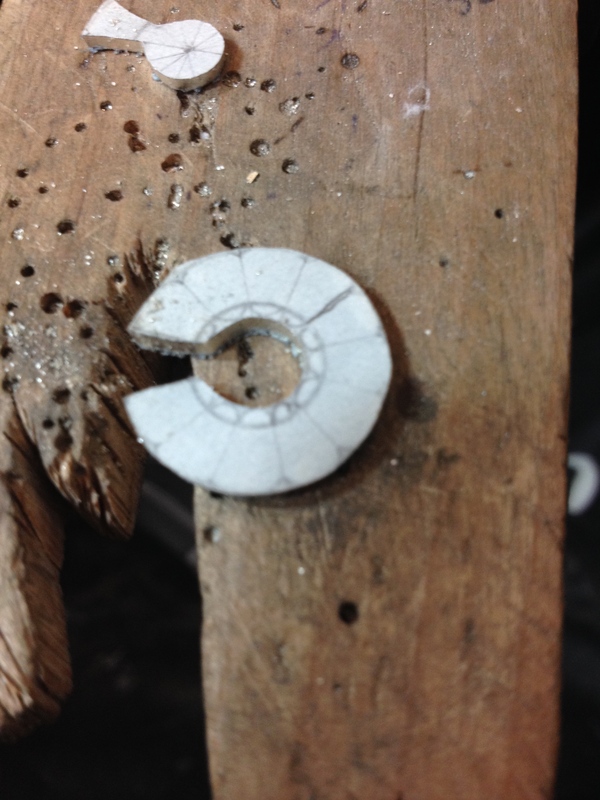 I used the doming block to deepen the bottom curve and then drew lines to resemble the cracked edges of the shell. I plan to engrave the ‘cracks’ in the back of the shell when it’s finished. I think the shaping’s done.. Time to make and add the bail. I cut a short strip of 1mm sheet and bent it then soldered it. 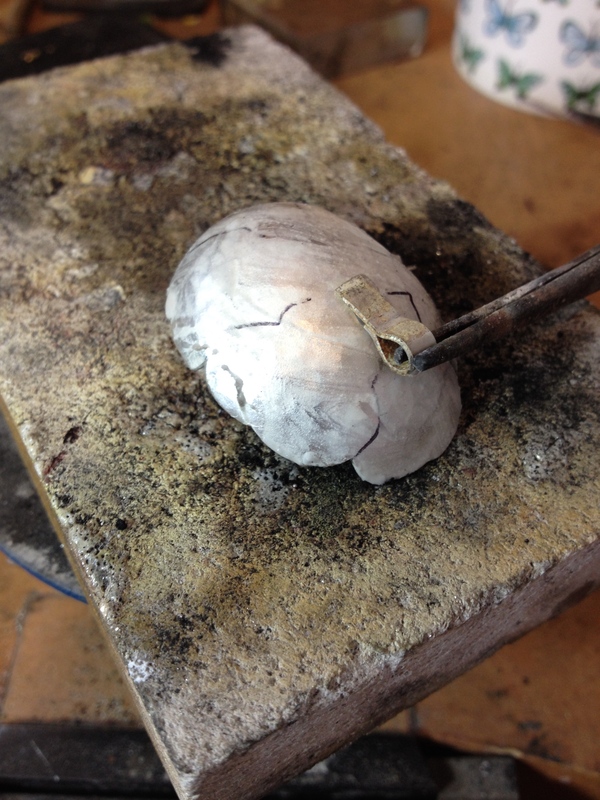 I positioned the bail on the egg and soldered it in place – the wrong place! It leans forward too much. I need to do it again! To remove the bail I held the bail itself in a the third hand. 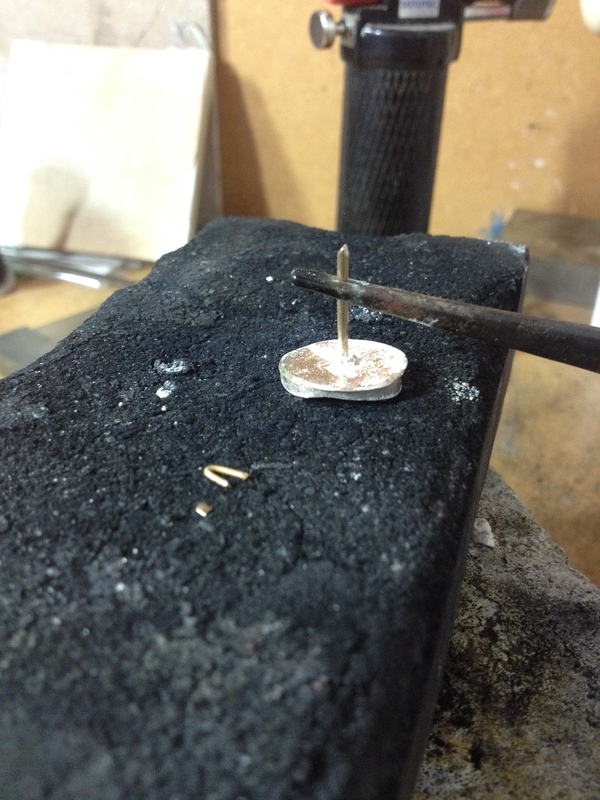 (Free standing tweezers) and heated it up. The solder ran and the egg dropped off. I repositioned it further up the egg. That’s better, it hangs nicely now. 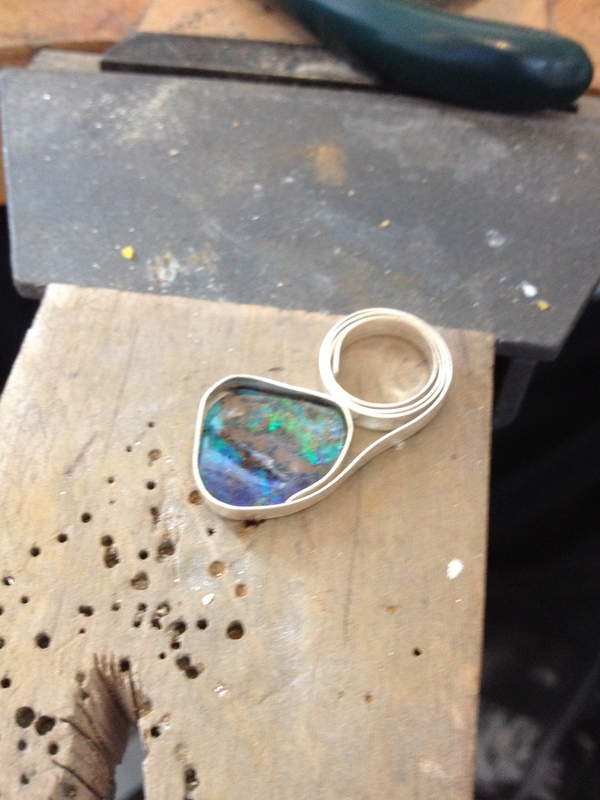 Just need to make the bezel to set the opal in. 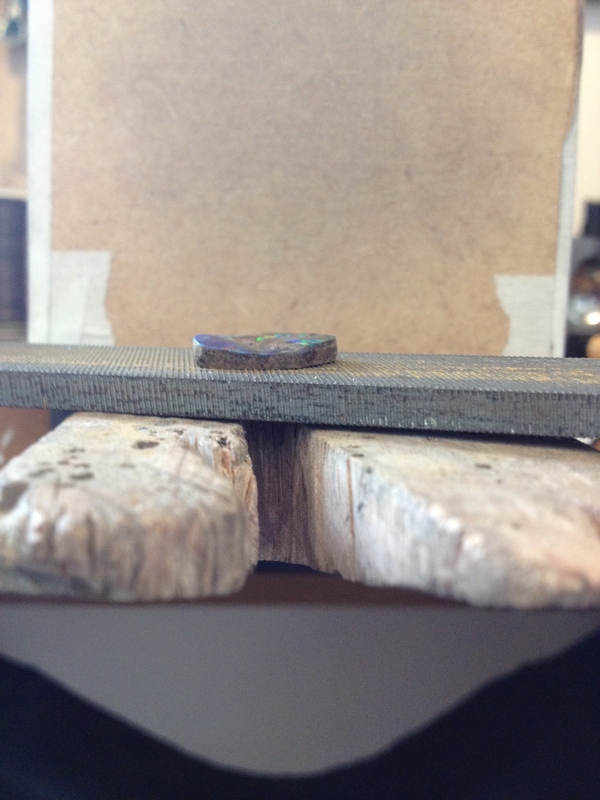 This was the point when i realised that the stone was really thick and didn’t lay flat. Should have spotted this before. 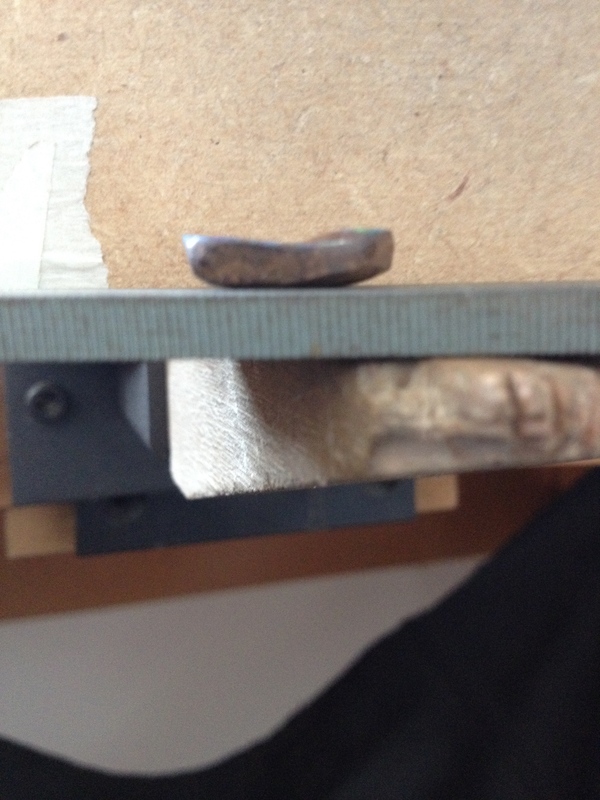 Here’s the stone, side view laying on a flat file. You can clearly see the curve on the lower surface and the thickness.Since the opal surface itself is actually quite thin I figured I could remove a lot of the brown rock at the back without harming the stone. I found, by trial and error, the best way was to rub it over coarse sandpaper. 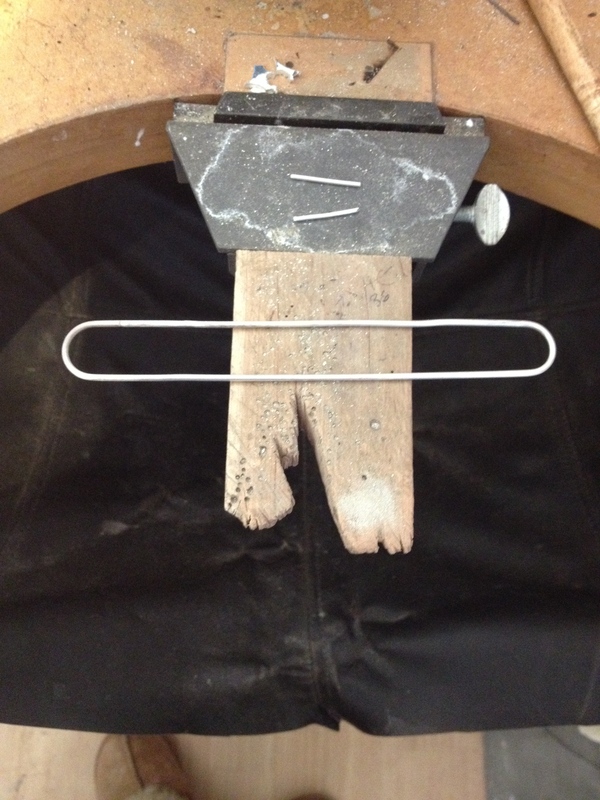 This had the effect of flattening the base and thinning the stone. 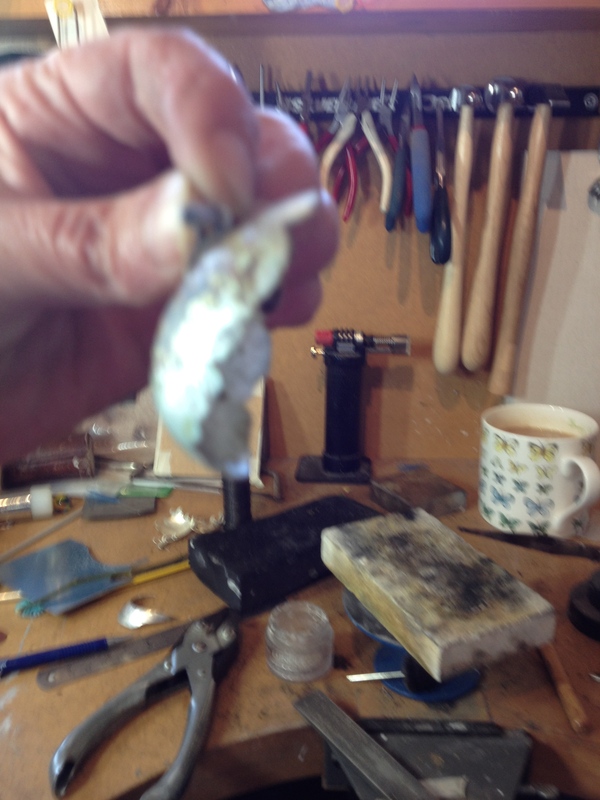 At this point I wrapped fine silver bezel strip round the stone, cut the strip, soldered it and formed it into the correct shape. 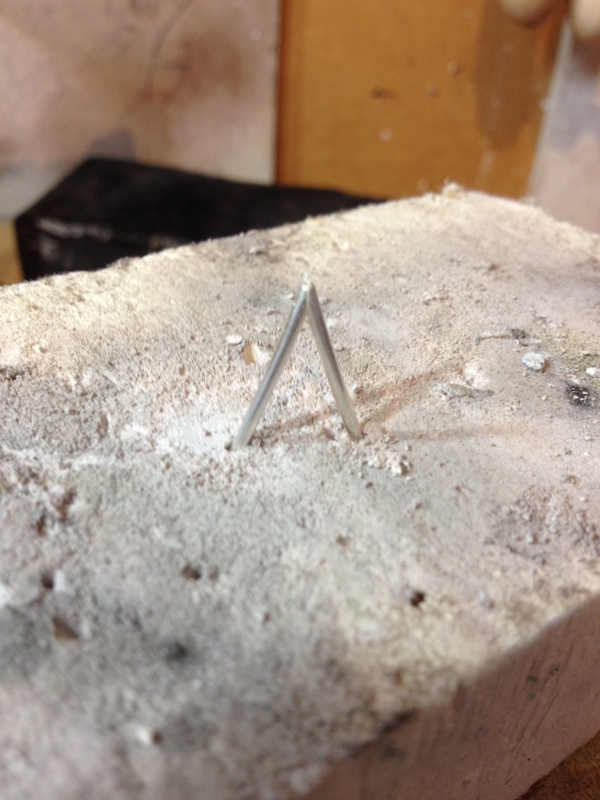 I needed to do some more thinning of the stone to get it to look right. 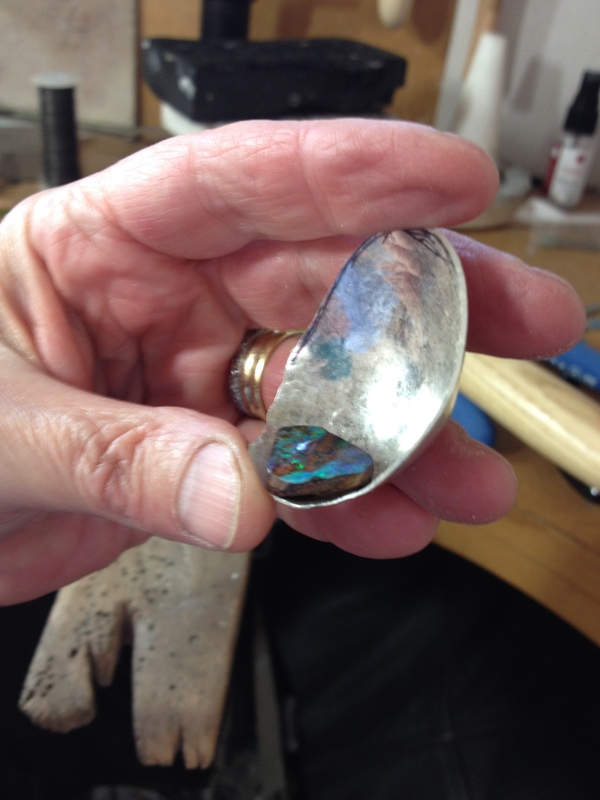 Ok, now I needed to figure out a way to get the opal to sit in the egg so it would reflect off the back and appear like a pool. The egg still wasn’t really deep enough at the bottom so I needed to do more shaping. 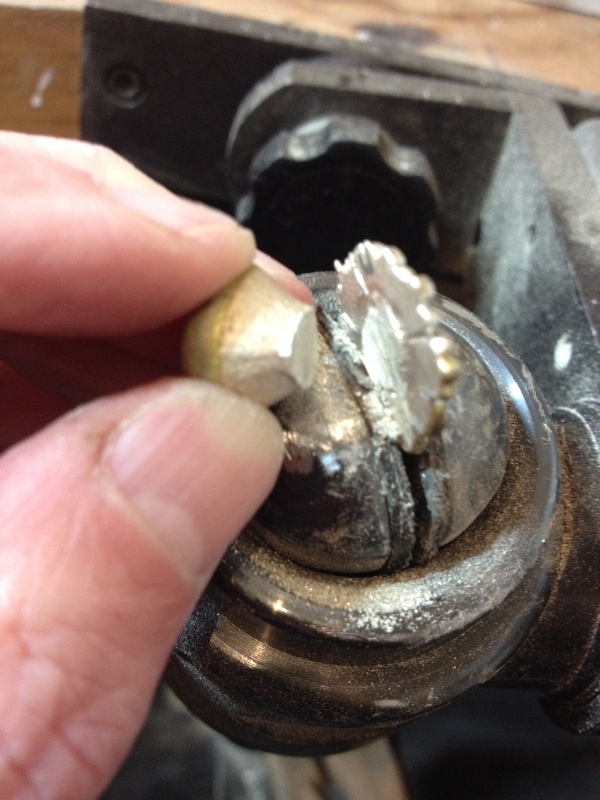 This time I used my lead block and a small hammer. I think this is called a chasing hammer. 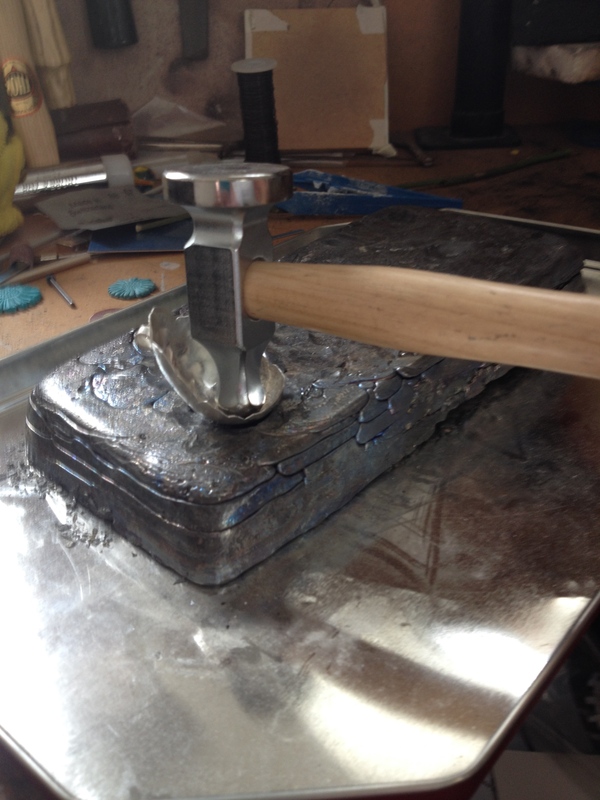 I made the lead block last summer by melting offcuts of lead flashing into an old loaf tin. I can assure you the loaf tin is no longer used for loaves! Lead is softer than silver, when the silver is struck it deforms down into the lead. 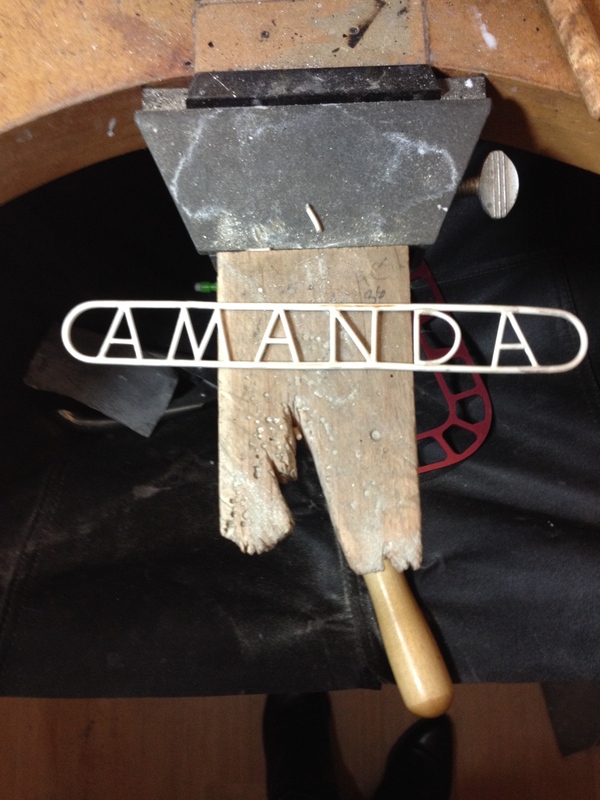 This is the reverse of the shaping I did over the stake. 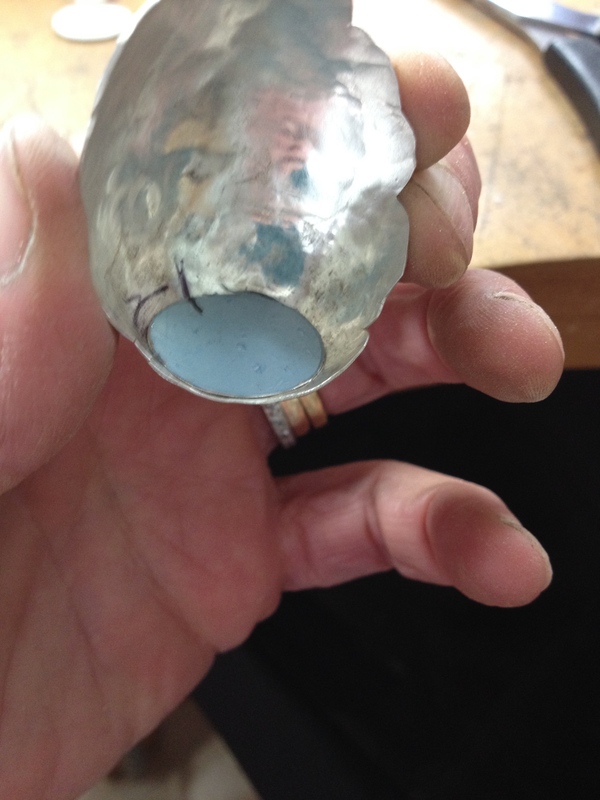 I was able to deepen the base of the egg sufficiently to hold the opal in the bottom. It’s really important to do lots of hand and tool and egg washing throughout the entire process. I wouldn’t want to accidentally munch a biscuit laced with lead. Finally got it to the right shape. 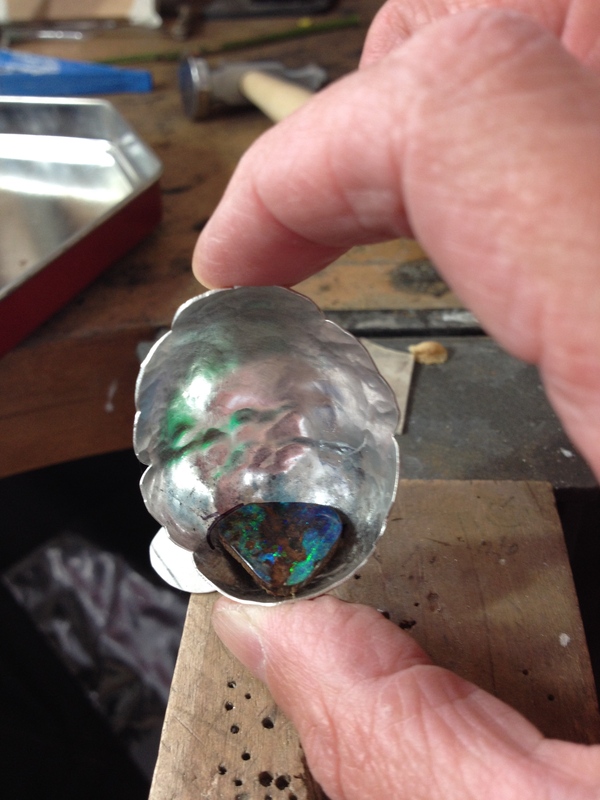 I did a lot of admiring at this stage, just resting the opal in the egg and taking photos! 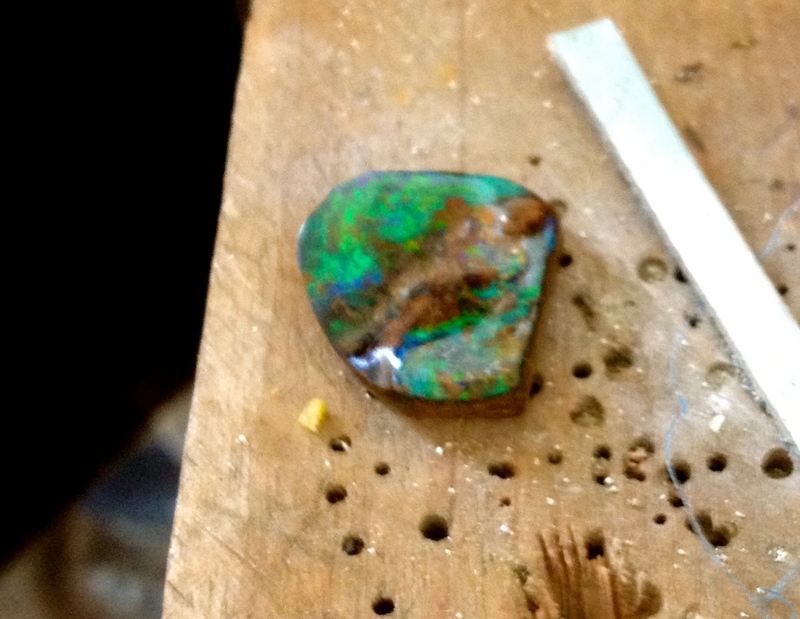 All this was well and good but I still hadn’t come up with a way to set the opal that wouldn’t leave a gap around the edge. I decided to make a tight fitting little shelf that the bezel would sit on. Again, more head scratching. The inside of the egg wasn’t regular – because of this darned ‘organic’ concept and I was really stumped. Finally – inspiration! 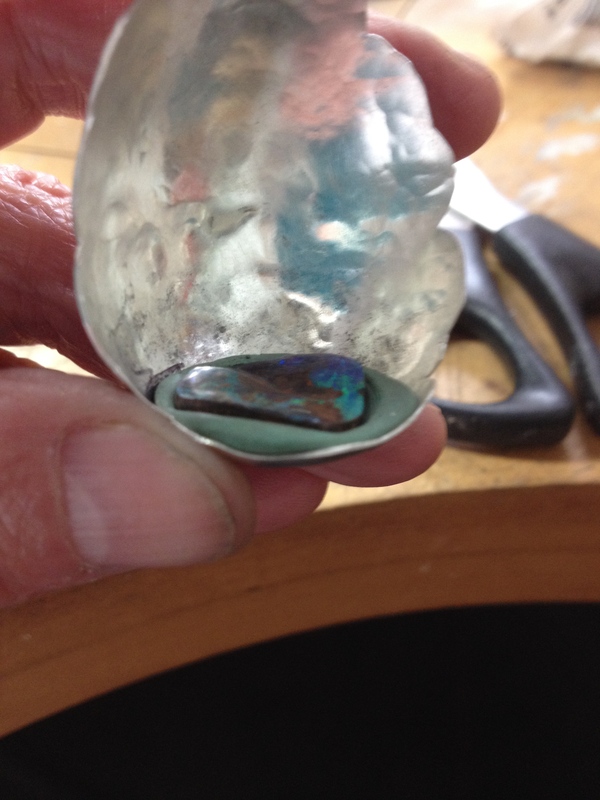 I would put some Fimo modelling clay in the base, press the opal into it, remove the stone and then bake it. 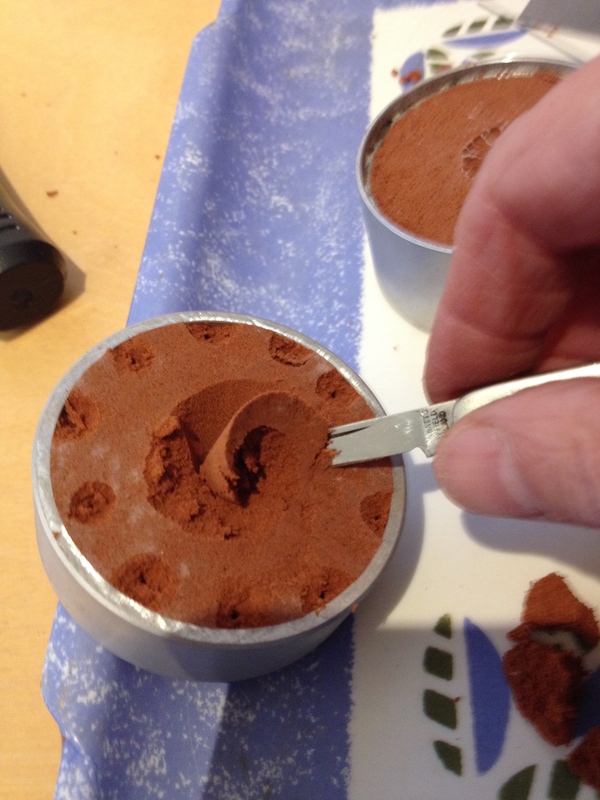 My theory was that the clay would form to the egg and I could then use it as a template to cut out a little shelf of silver. Here it is after baking. I need to trim off the excess and then I should have my template. 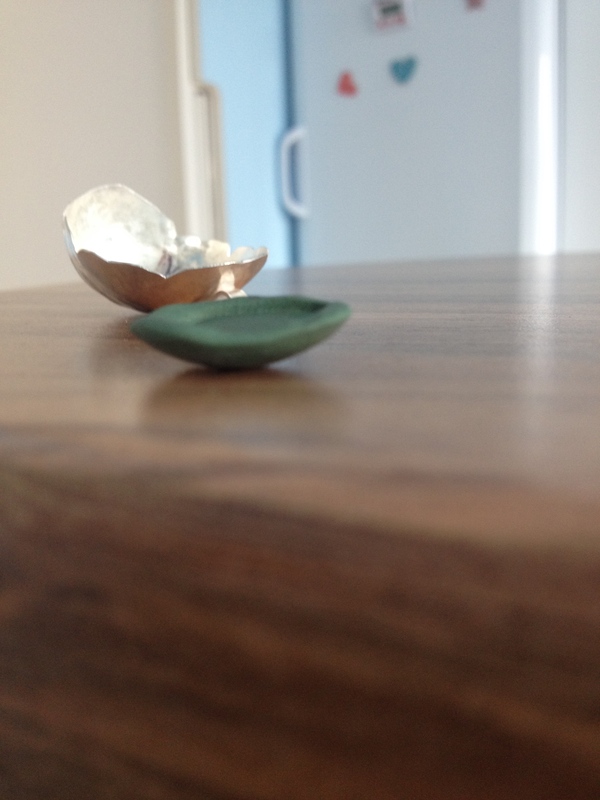 After sanding down the Fimo clay I positioned it in the egg. It seemed to fit quite well. Only little gap. I sat the opal on the shelf to see if it looked ok. Not bad. 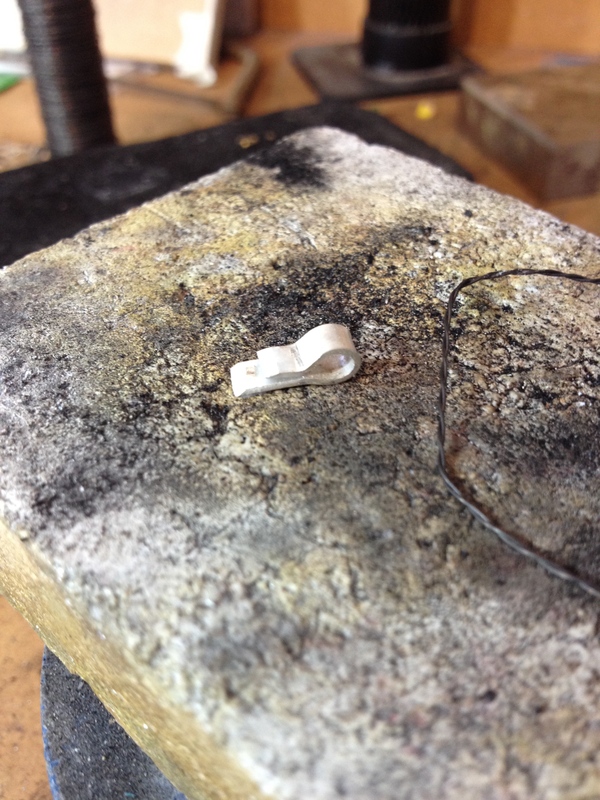 Now I needed to cut out a little sheet of silver to replace the Fimo. I put the Fimo shape on a sheet and drew round it. I made sure I marked which side was which otherwise I would be fiddling around for ages trying to work out which way up it went. It fitted reasonably well but wobbled around a lot sliding up and down and left and right. I just couldn’t seem to get it so there wasn’t a gap around the edge. 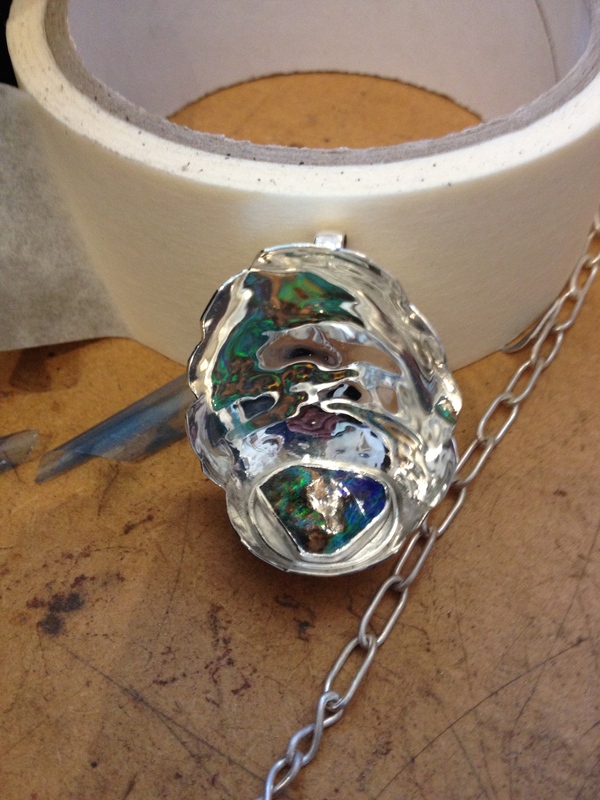 Time to make the bezel that will secure the opal. 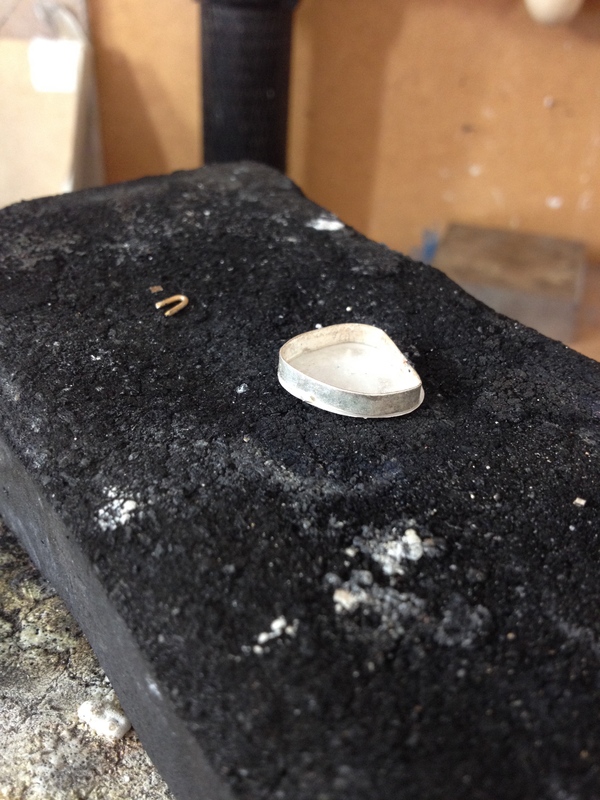 I wrapped fine silver snugly around the stone to hold it in place. I wanted to get the bezel fitted to stabilise the little shelf. I felt it was flexing as I tried to position it. I put the bezel in place on the shelf and soldered it. That went ok! 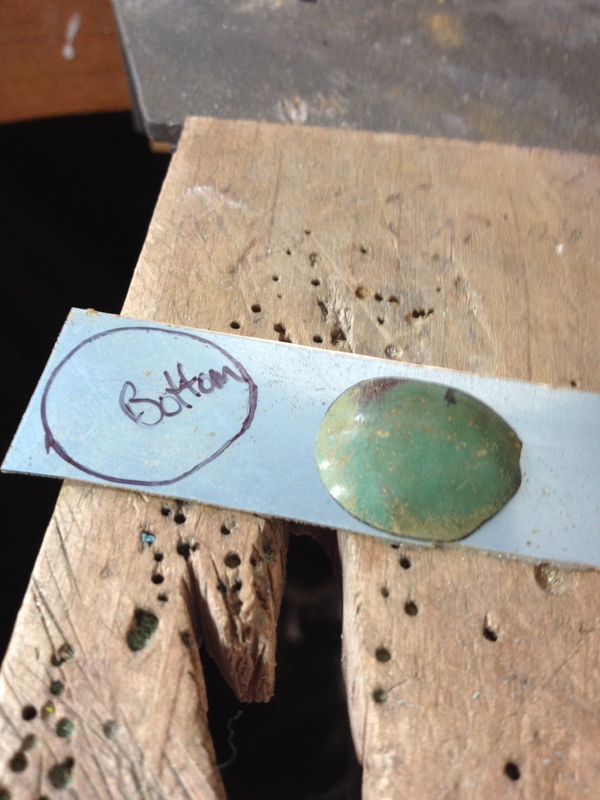 Test the fit by putting the stone in the setting. I used dental floss to enable me to get it out again. I really did need the floss, it fitted VERY snugly and needed quite a yank to get it out. 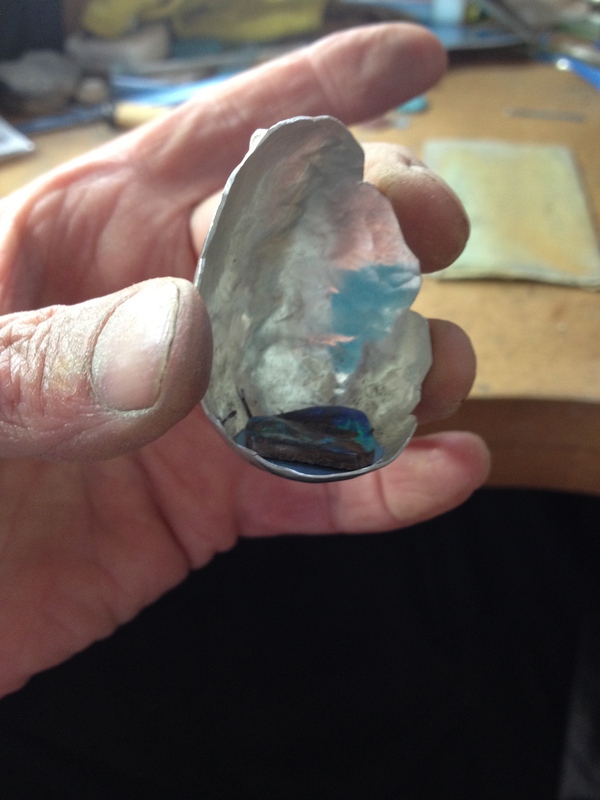 So much of a yank in fact that the opal shot out and vanished somewhere in the workshop. That would be a hands and knees search. I finally found it underneath the recycling bags! To solder the shelf in place I knew I would need a lot of heat to get the egg up to temperature I was worried that the bezel seams would run so I painted them with tippex. 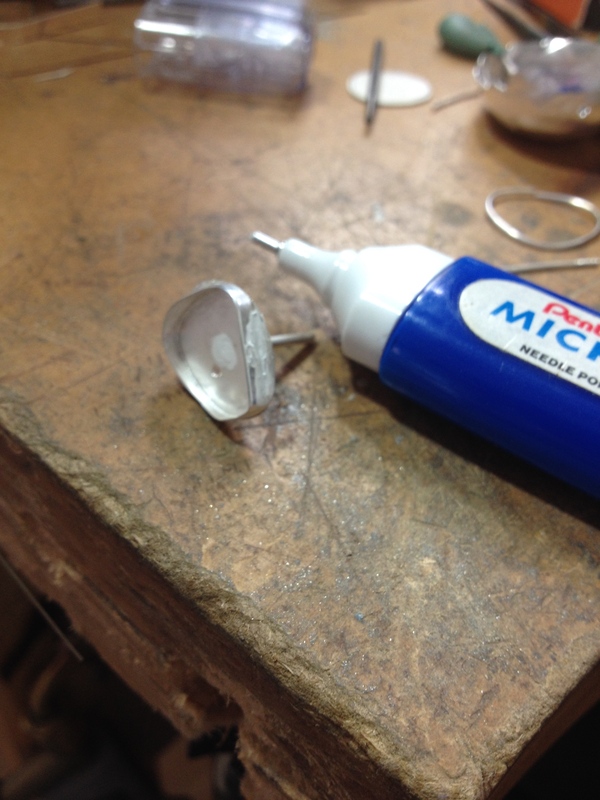 Tippex stops solder flowing and will have the effect of protecting the seams on the bezel. 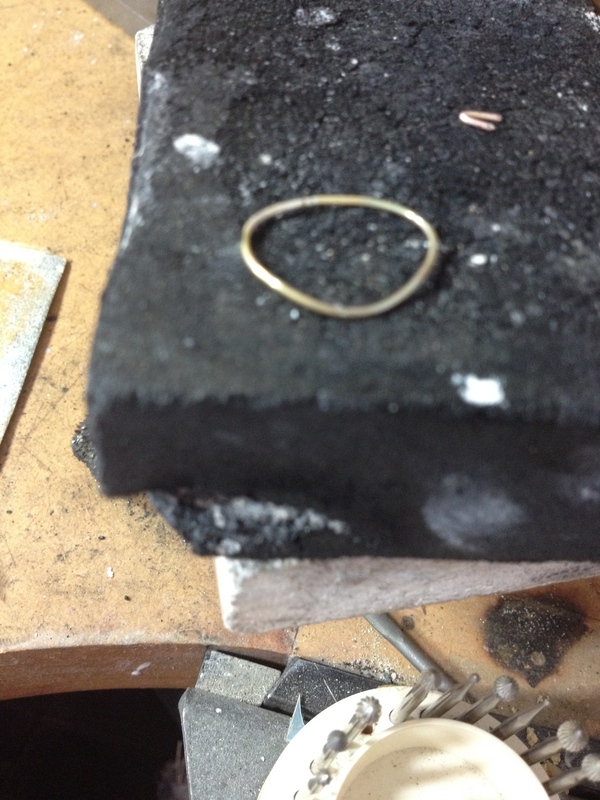 I made a little ring of wire which I think will anchor the shelf into the egg. Here it is after soldering. 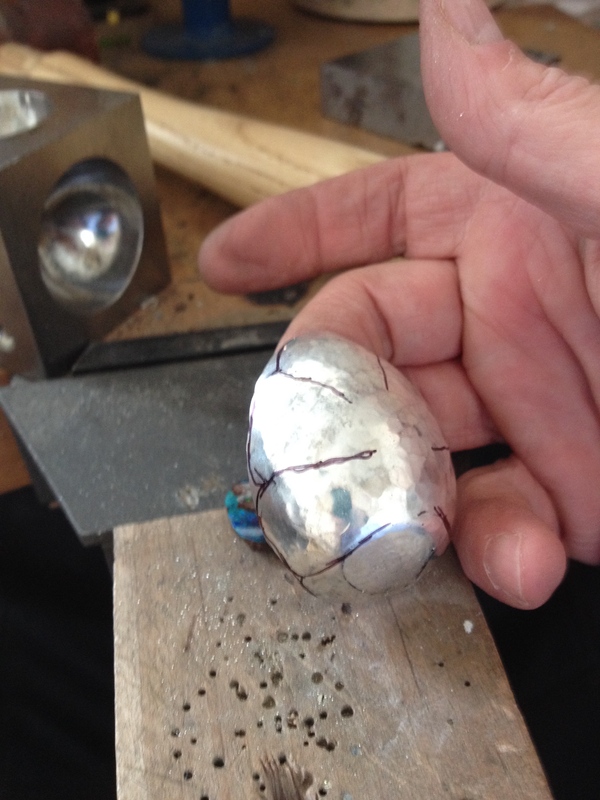 After soldering I pickled the whole structure and then cut off the peg that was protruding from the bottom of the egg. Just need to file off the excess solder from around the join. 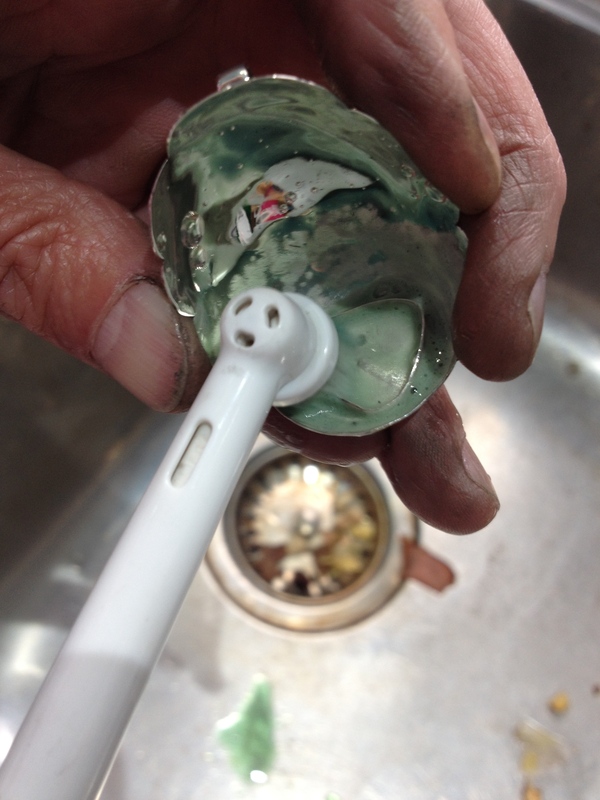 The I trial fitted the opal – using the old dental floss trick again. Ok. the stone fitted. Now to polish it. Oh my days! the amount of fireplace was horrific. I polished and polished and polished! Then washed off the polish using an electric toothbrush and washing up liquid. OK. Still covered in firescale, it needed MORE polishing. The big bench polisher was fine for the outside but I needed to use the pendant motor fitted with a mop for the inside. 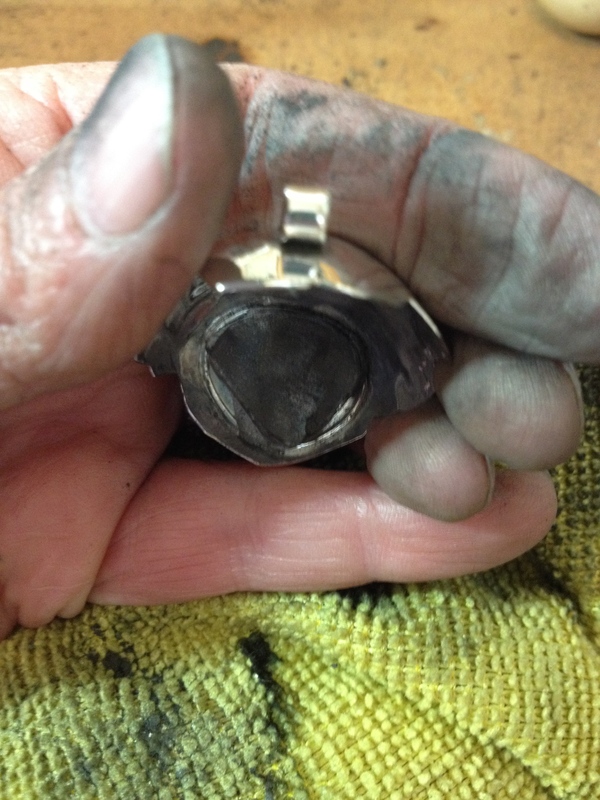 At this stage I was worrying that the action of polishing would damage the delicate bezel. 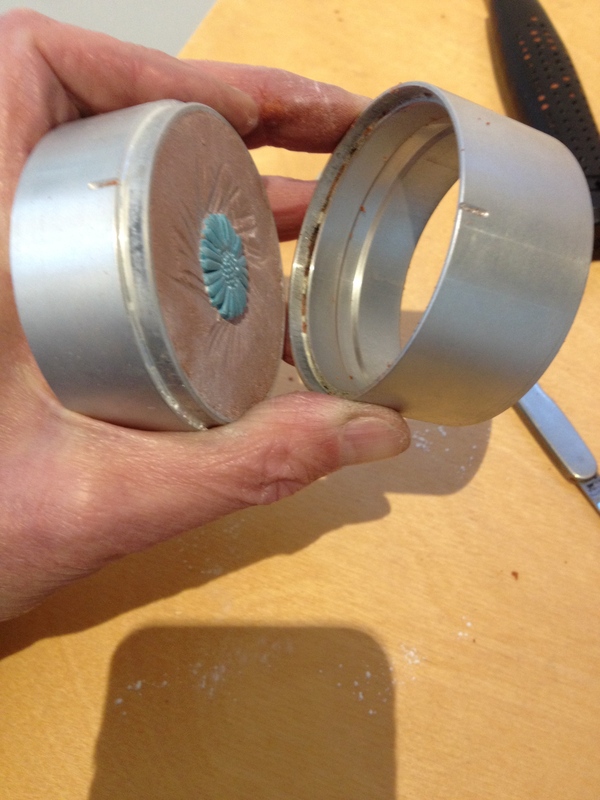 I fitted the stone into the bezel to support it and covered it with a bit of masking tape to protect the surface. It took forever and I got a very dirty face from all the polish flying around. I think you can tell from the look of triumph that I finally got it all done! I needed to support the egg while engraving so I used Polymorph. 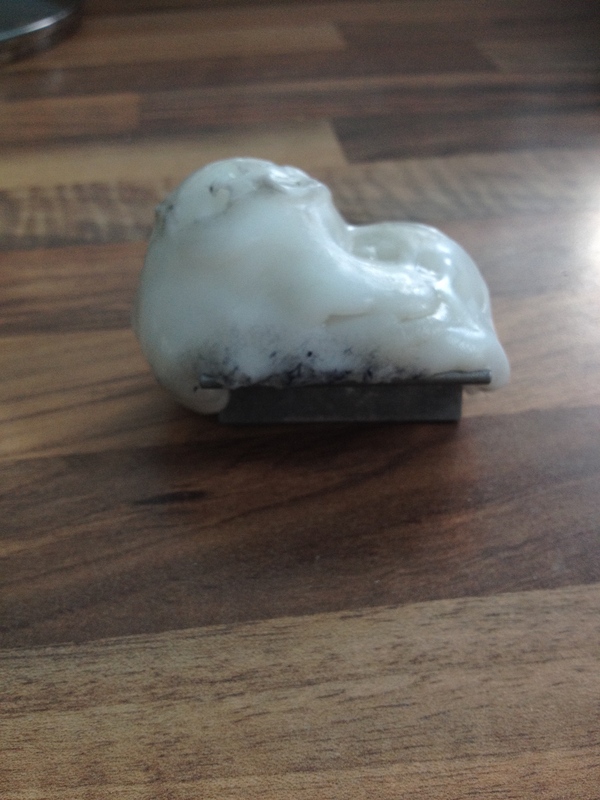 Polymorph is an amazing plastic which deforms with heat and the goes rock hard when cool. I fitted a warm lump onto the bench mate and pressed the egg into it. I could then use a graver to cut lines on the back that looked like cracks. Its not clear in the photos – sorry. Finally I made a chain and a clasp and there we are. 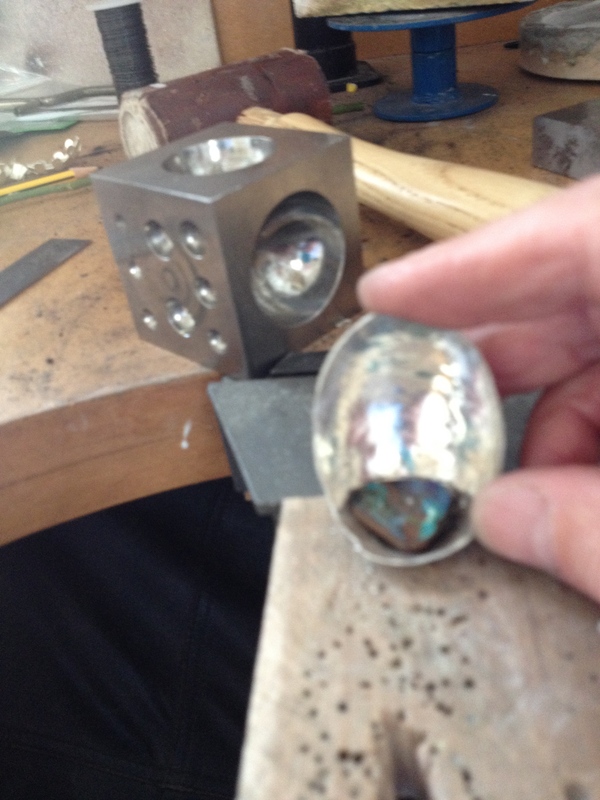 A little egg to hold an opal safe. 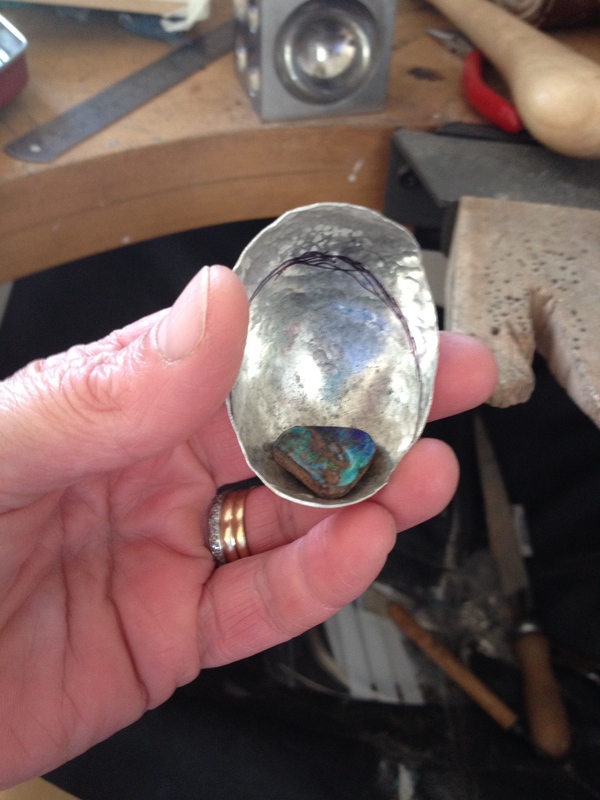 This entry was posted in necklaces, Silver, work in progress and tagged boulder opal, dark blue, egg, hammering, hand made, jewellery, making, necklace, pendant, piercing saw, polishing, pool water, silver, soldering, spoon stake on May 22, 2015 by deecraven. Now the time has come to make up the Daisy chain itself. 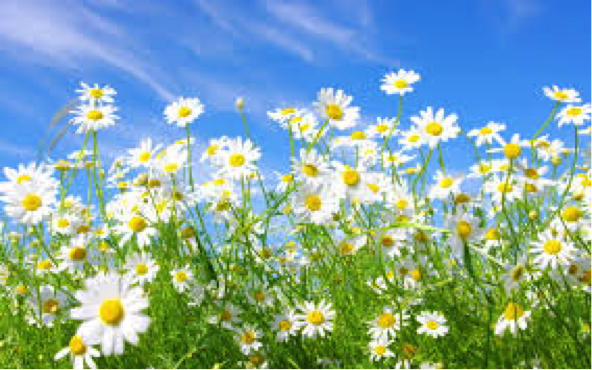 The Daisies are all made, so assembly should be straightforward. I really wanted to split the stalks like you do when you make a real daisy chain. After some experimenting I found this wasn’t going to work because it allowed the necklace to flex in only one direction and it needs to be able to lie flat around my neck. Taking one daisy at a time I used round nose pliers to bend the stalk over. Then I moved the pliers round and bent the stalk again. This created a sort of ‘hump’ in the stalk at the back of the Daisy. 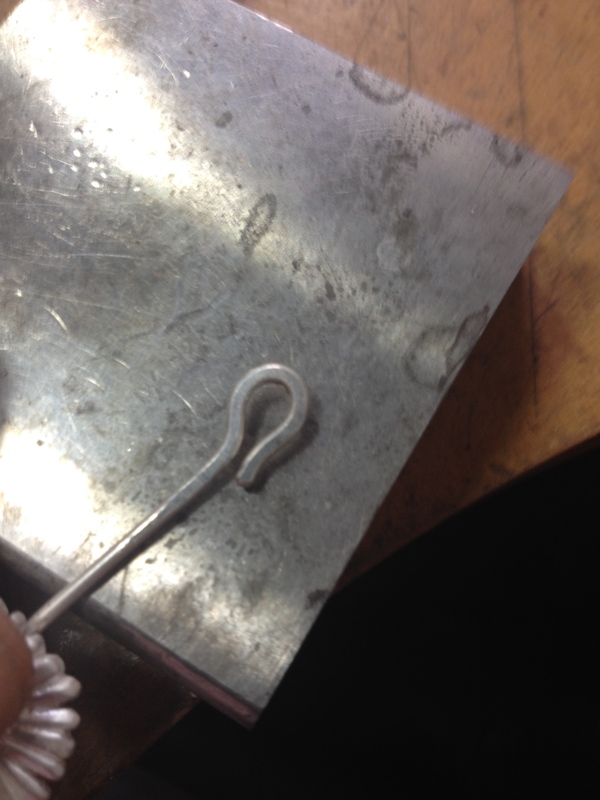 I then used the round nose pliers again to make a closed loop on the end of the stalk. I soldered this shut for security. I then made the ‘hump’ in the next daisy and threaded the stalk of this second daisy through the closed loop of the first one. Slowly, slowly I built up the necklace. Soldering the closed loops meant that I had annealed the stalks and they were very bendy. I needed to work harden them to make the necklace more stable. I took each end of a single stalk in a pair of pliers and twisted the pliers in opposite directions so that the stalks would harden up as the wire twisted. I bent the stalks slightly to make it look more natural. One one stalk I drew a straight.line along the length with a black sharpie before I twisted it. If you look carefully you can see the black line twisting round the stalk once I’d finished twisting. Finally I needed to create a catch. I had made one very big Daisy and I decided that this one would have the catch attached. Taking the last little Daisy I formed the end or the stalk into an open loop instead of the closed one. 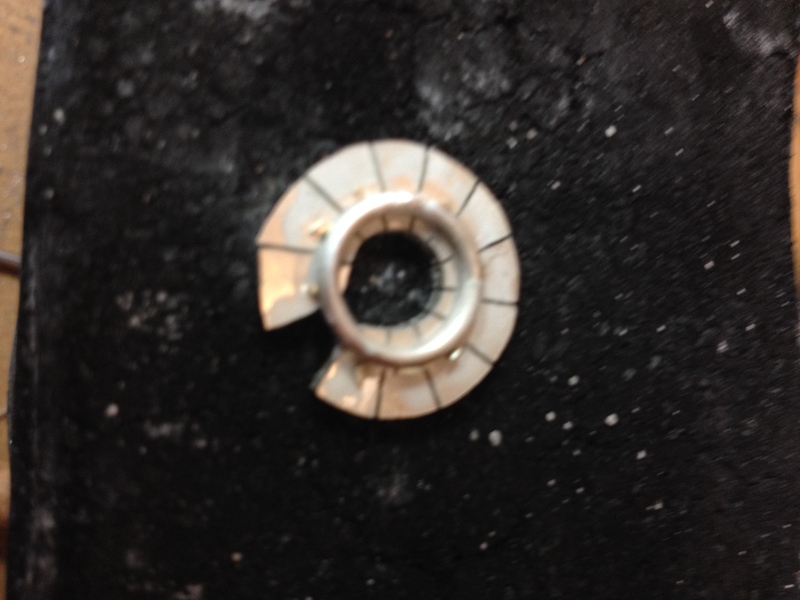 I cut the loop off and then hammered it flat to make sure it was hard and springy. This will clip into the ‘hump’ on the first daisy and close the chain. One final finishing polish with the radial wheels and it’s good to go. This is the necklace finished. 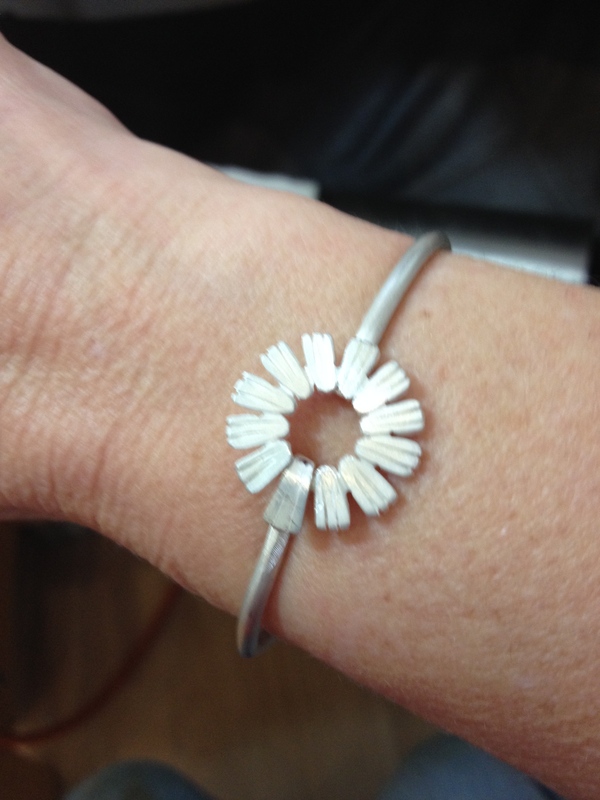 By hooking the clasp onto a different Daisy I can also wear it with the end dangling down. 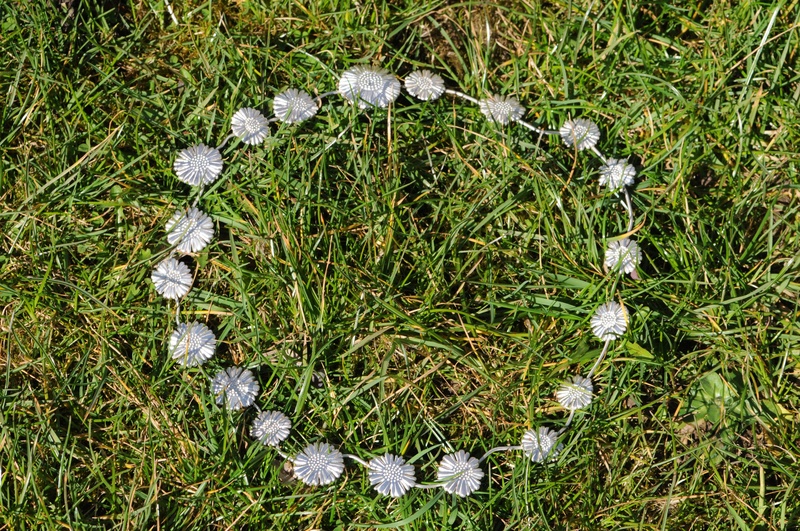 Here it is in the grass pretending to be a real Daisy Chain. 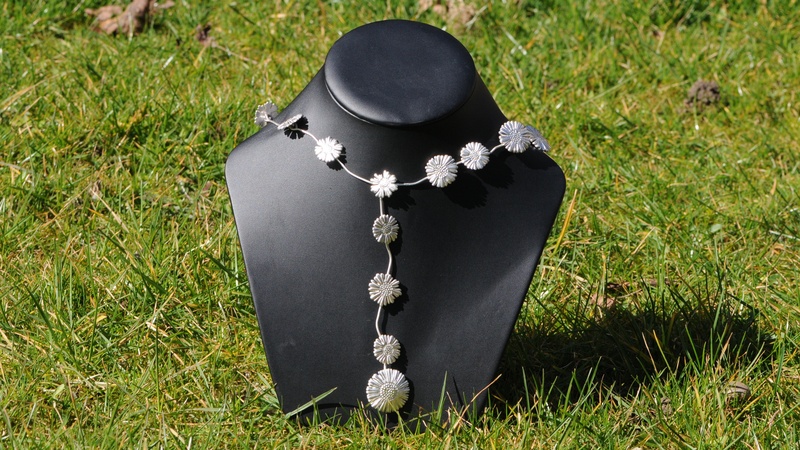 The best thing about this necklace (apart from being pretty) is that all the Daisies are made from scrap silver and I learnt a new technique as I made it. I hope you like it too. This entry was posted in Uncategorized and tagged 2mm wire. 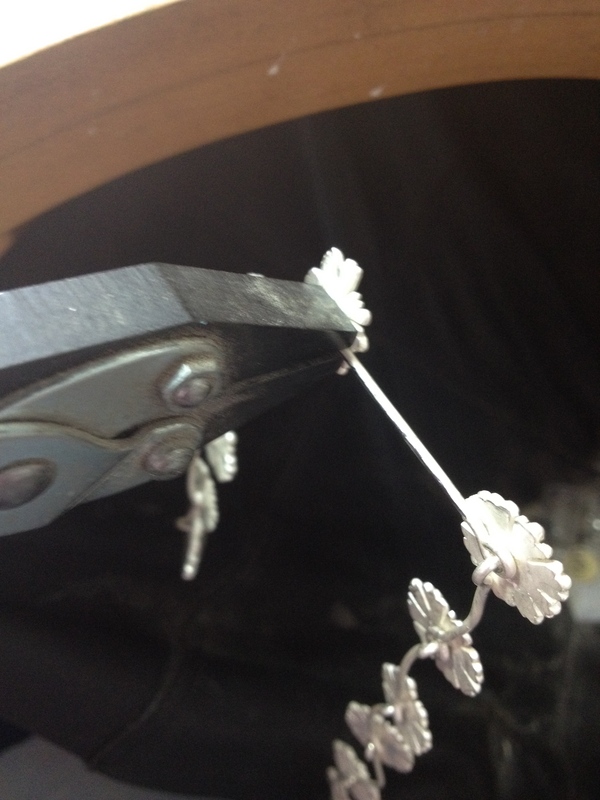 1.5mm wire., casting, daisies, Daisy, Flowers, hand made, jewellery, making, necklace, pendant, Pliers, silver, soldering, work hardening on May 2, 2015 by deecraven. Still working on the Daisy chain. Having cast the daisy heads I needed to finish them and then add the stalks. Castings always need cleaning up. They have rough edges, sticky-out bits and generally the finish is nowhere near perfect. 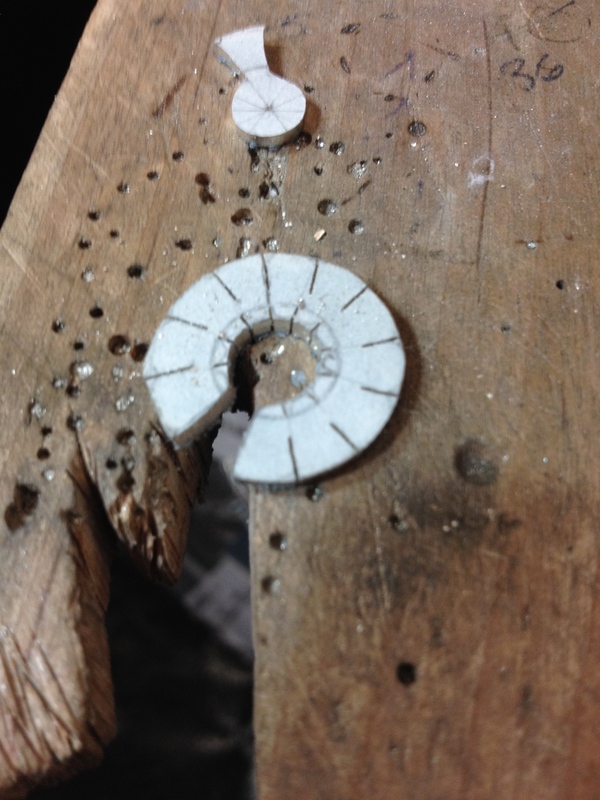 Finishing castings would appear to be very time consuming. 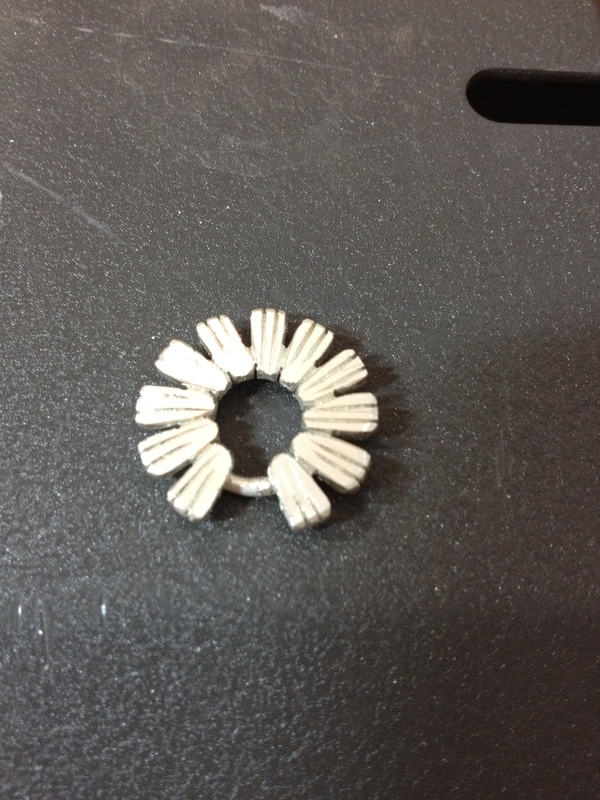 Here’s one of the Daisy heads after I have filed, sanded and cleaned up the rough edges from the casting. Once they were all cleaned up I polished them. Its easier to polish them at this stage rather than when they have the stalks attached. 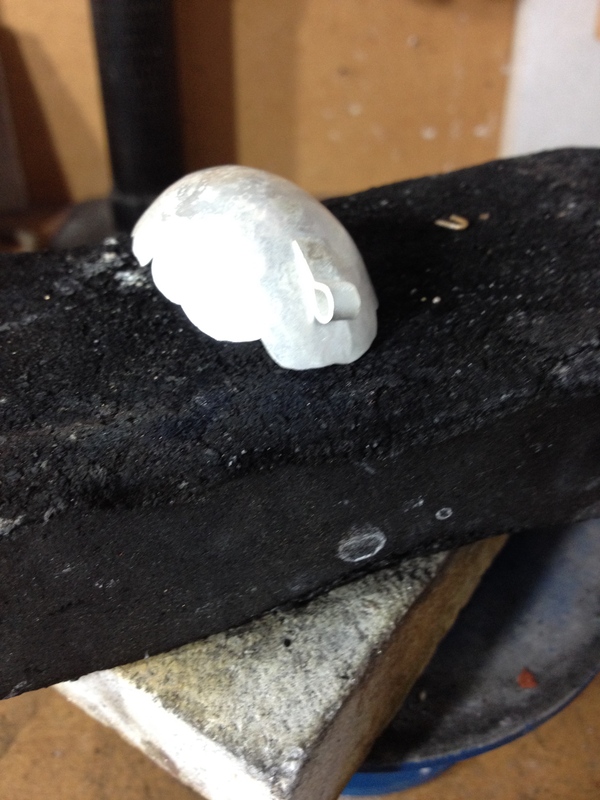 I’ve put a picture of an unfinished casting next to the clean one so you can see the difference. Next step is to add the stalks. 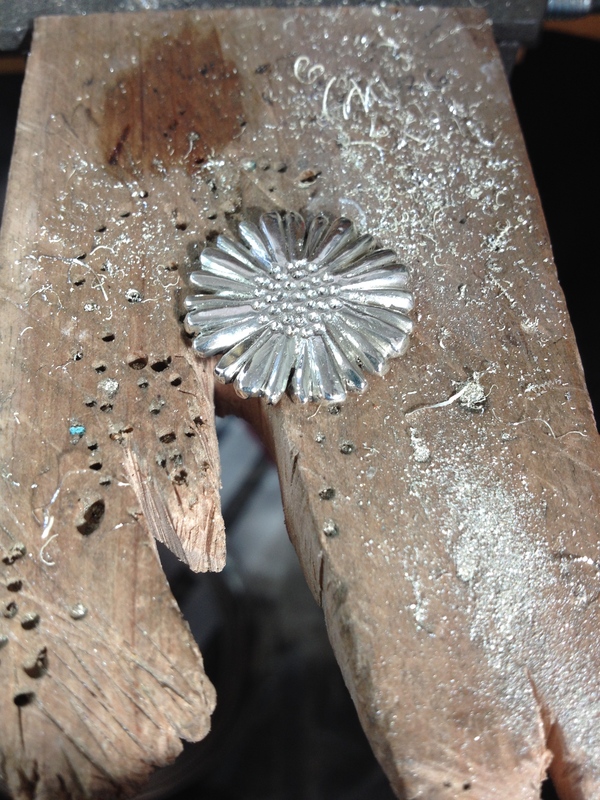 I drilled a shallow hole in the back of the daisy. 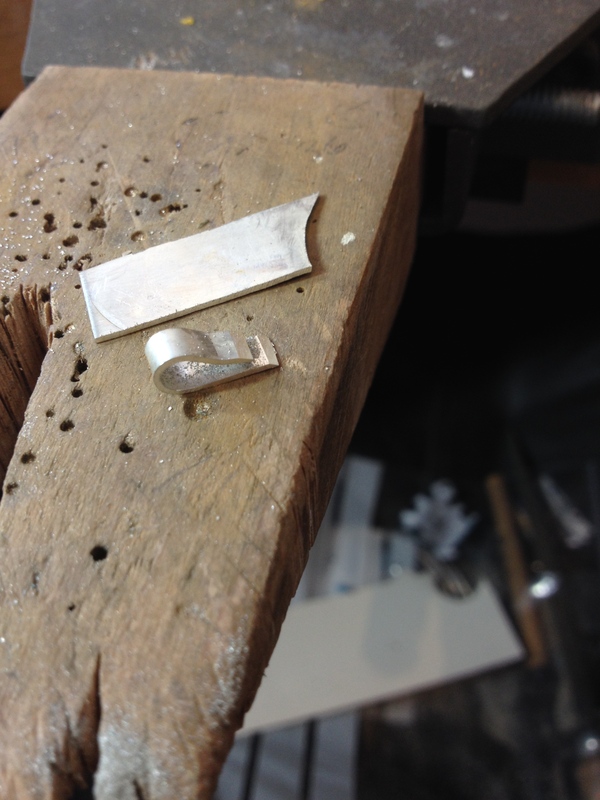 This was to ensure the stalk went where I wanted it to go and to give a larger area for the solder to flow and create a join. The soldered the stalk in place. I want a good firm joint here as these will be taking the weight of the necklace. 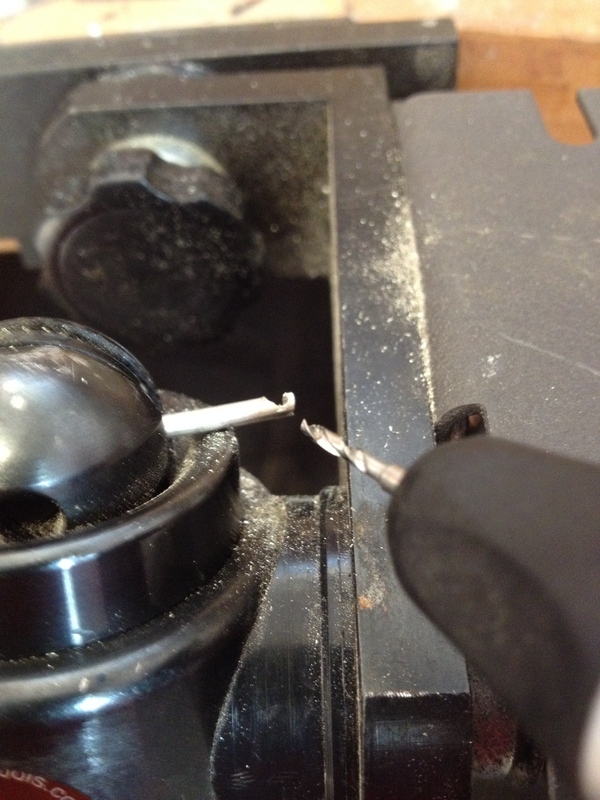 I held the stalk in place using a ‘third hand’ tweezer, fluxed the area well and added some hard solder. 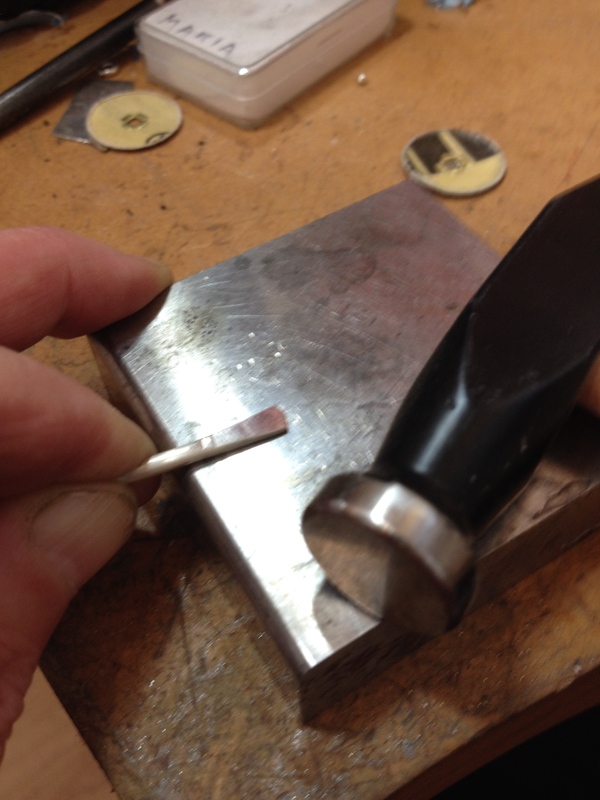 The ‘third hand’ is a really simple tool which is a pair of tweezers attached to a heavy base. 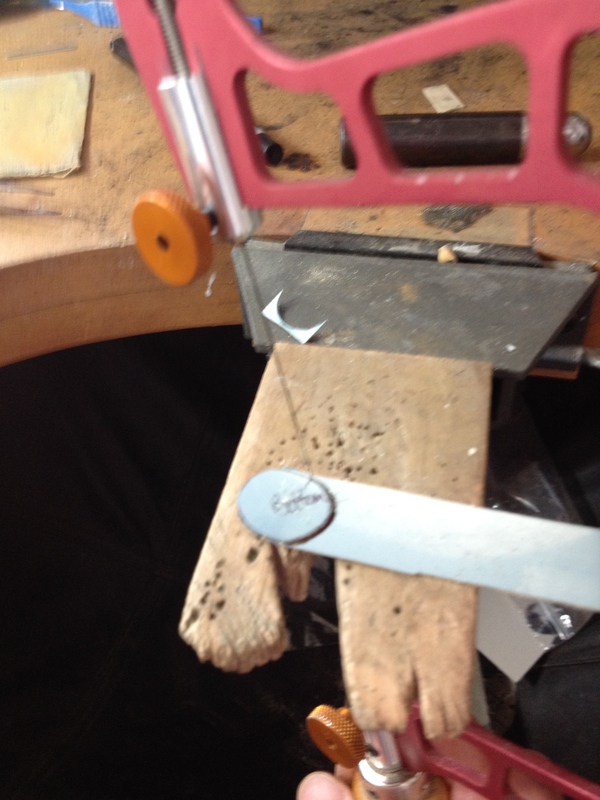 The tool has two ‘ball’ joints which allow freedom to position the tweezers where you want them. Look!! I got a bunch of Daisies!! Now I need to bend the stalks to get them to link together. 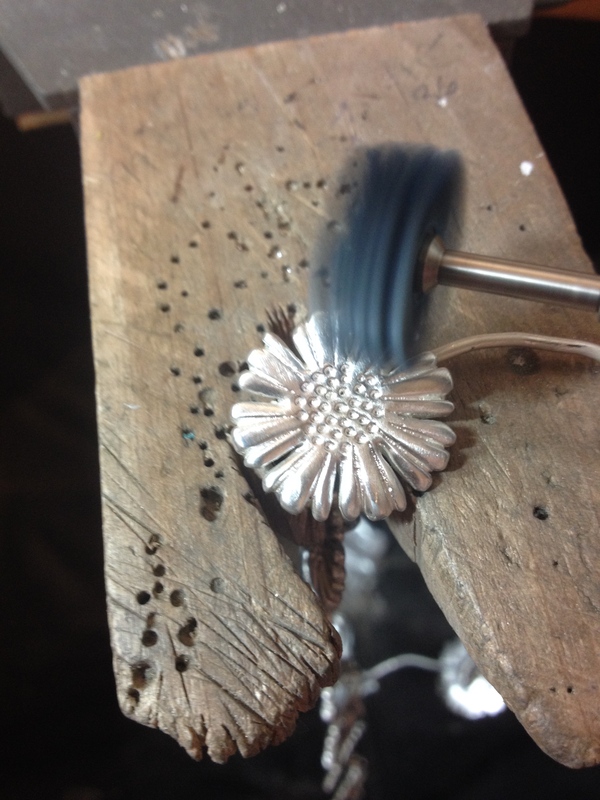 This entry was posted in necklaces and tagged daisies, Daisy, filing, Flowers, hand made, jewellery, making, necklace, polishing, silver, soldering on April 17, 2015 by deecraven. 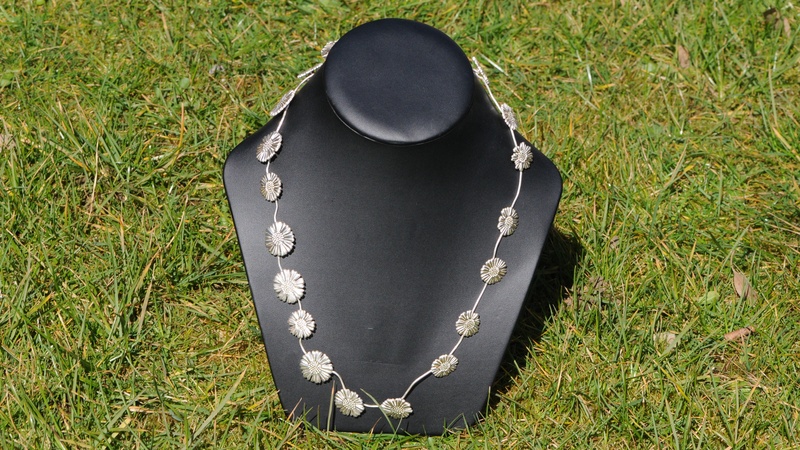 I will admit to being slightly fixated with Daisies recently and in the absence of summer, I wanted to make a proper Daisy Chain necklace. 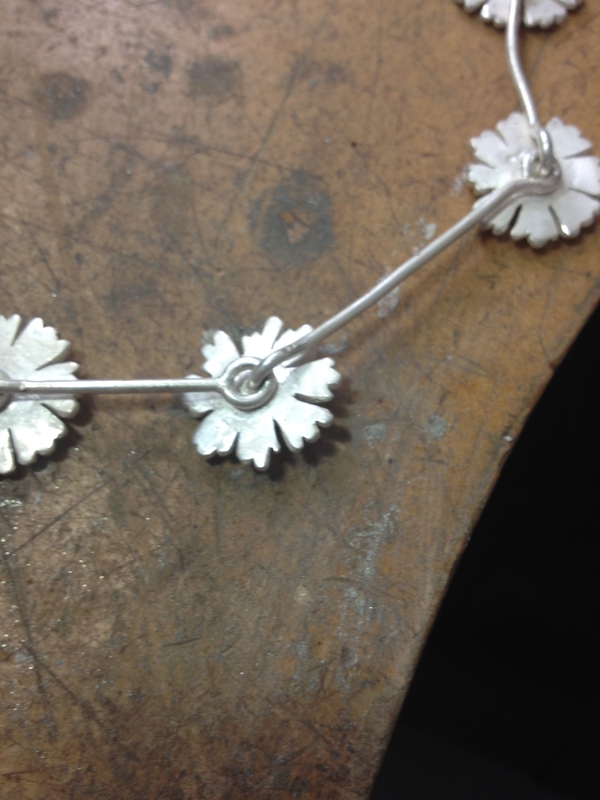 Since I am greedy I wanted to make a long Daisy chain. Remember the days spent sitting in the grass seeing how long you could make them? I reckon about 20 Daisies would do it. This presented a problem. Not only would the cost of new sheet silver be prohibitive but it would take ages to saw and file them all out. So, brilliant idea number one. Cast them using up my scrap pot. But how to do it? My knowledge of casting was limited to being vaguely sniffy about the mass produced cast items that proliferate in the shops. There are essentially two types of casting. 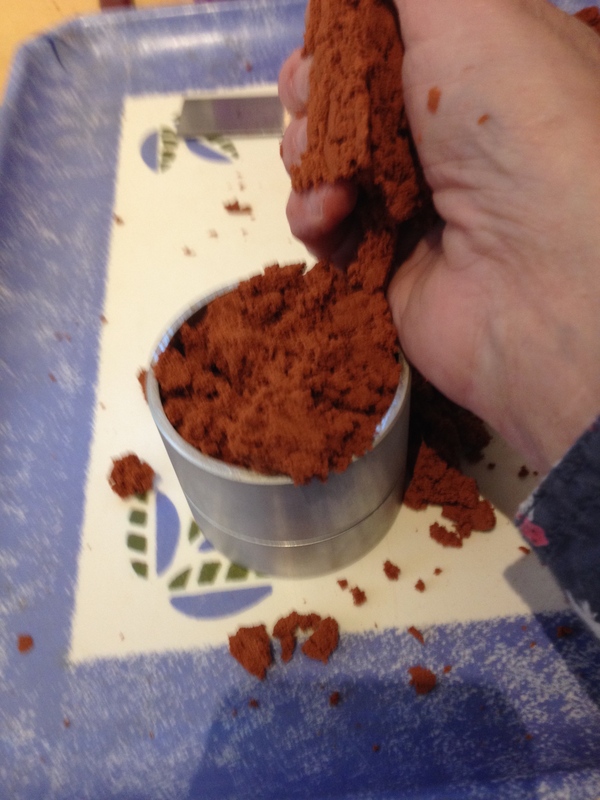 The ‘Lost Wax’ method and Delft Clay. 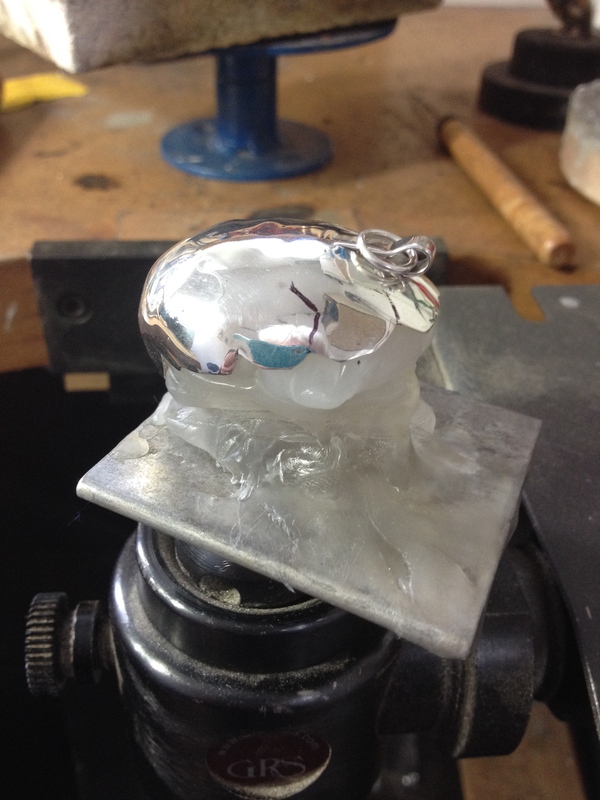 Lost wax was out of the question as it requires sacrificial wax models to be made which then melt as hot silver is forced into them using a centrifuge. It would mean making 20 models, not to mention the cost of some pretty high tech machinery. 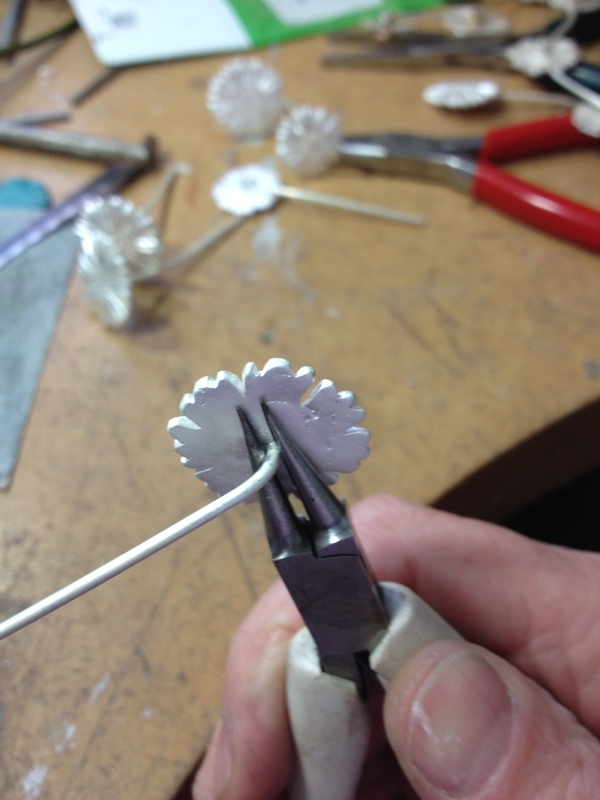 This is the commercial method used for such things as Pandora charms. Delft Clay it would have to be, even that would mean buying the clay and the casting rings. I managed to persuade myself that since I was using up scrap it would be worth it. 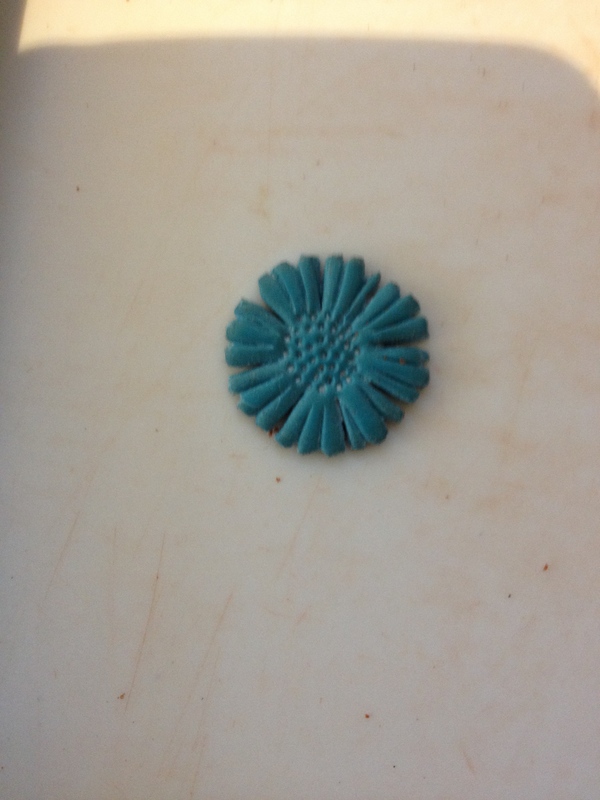 First I made a model of a Daisy using Fimo modelling clay. I made three different sizes. This is the little one. 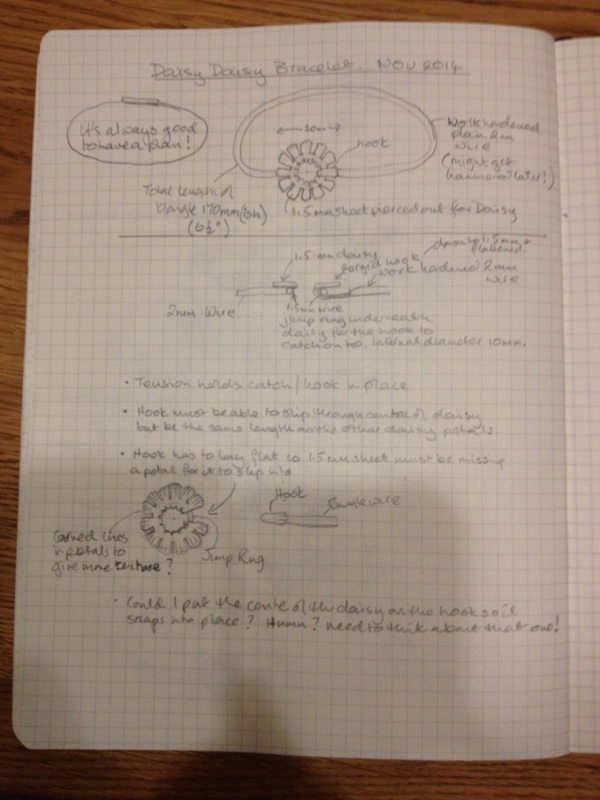 It has a flat back and shaped petals and centre on the front. 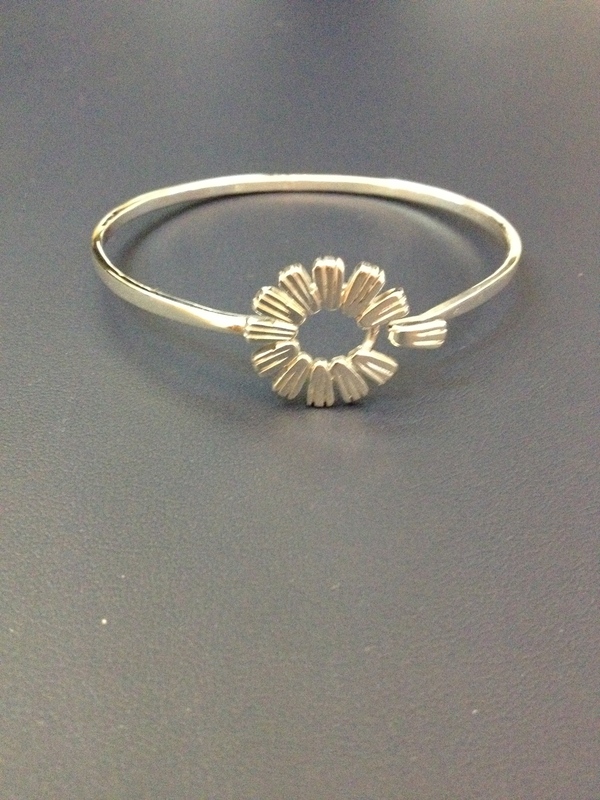 I wanted it to look as much as possible like the Daisies on the Daisy bracelet. 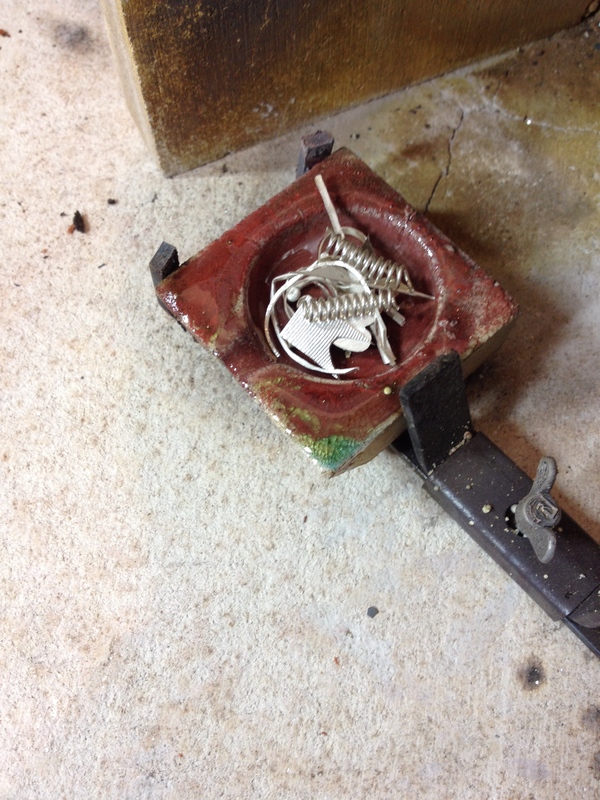 The principle of Delft Clay casting is simple. 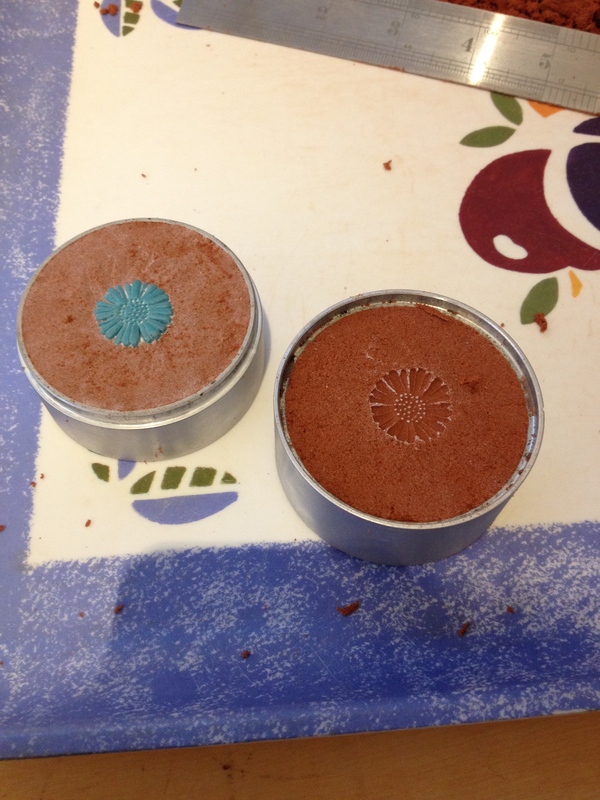 Using the fine sandy clay you make a two part mould which you then pour molten silver into. 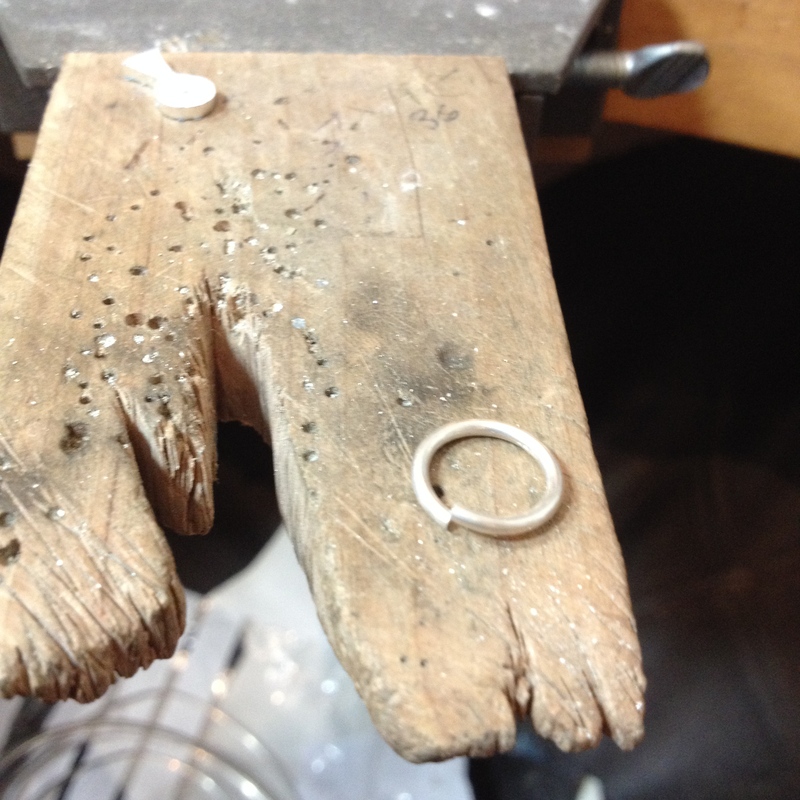 I filled the first half of the rings with the clay. You need to over fill it to start with. 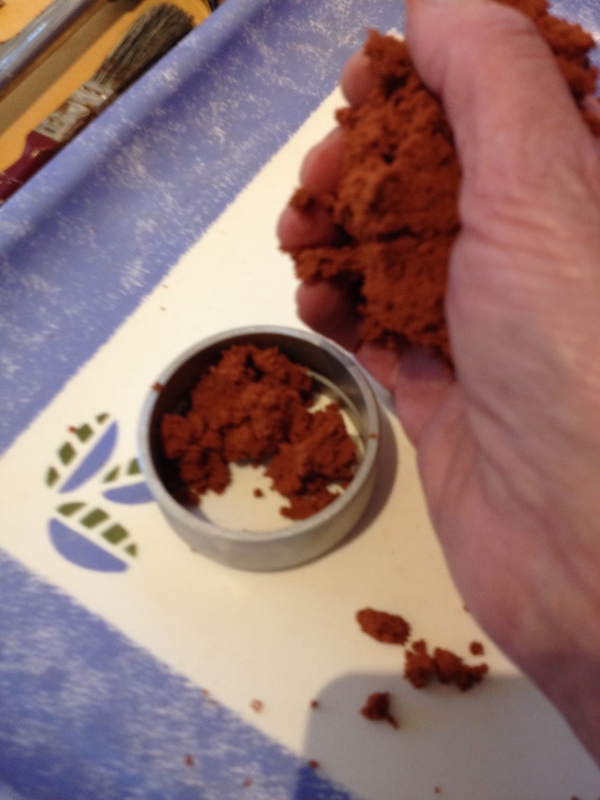 As you can see the clay packs together into quite a solid lump. It also gets everywhere! 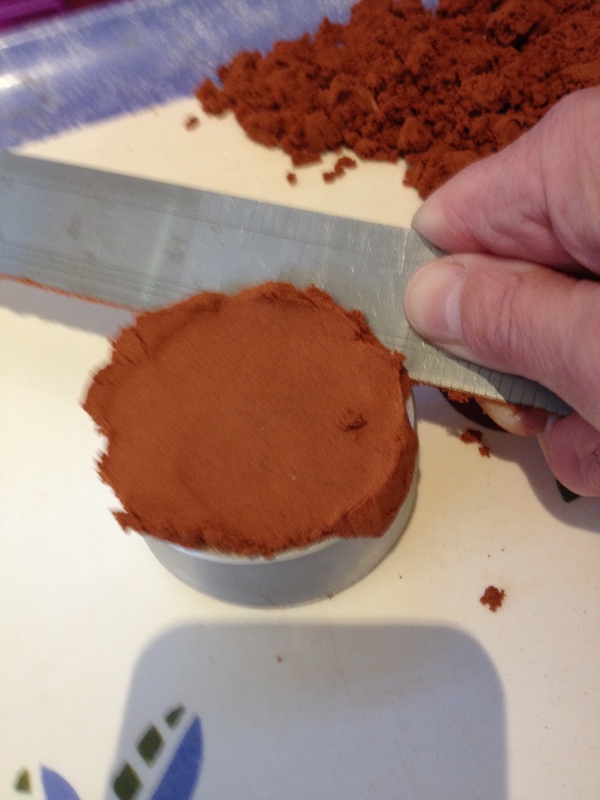 Then hammer the clay down into the ring to compact it and then scrape off the excess with a steel ruler. You are left with a fairly firm block of clay inside the ring. 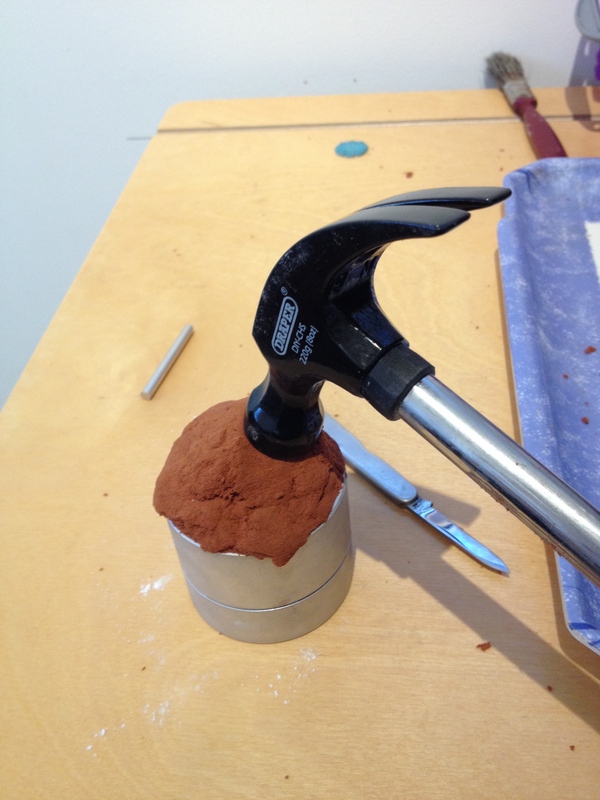 This created a smooth surface to embed the Fimo model in, flat side down. 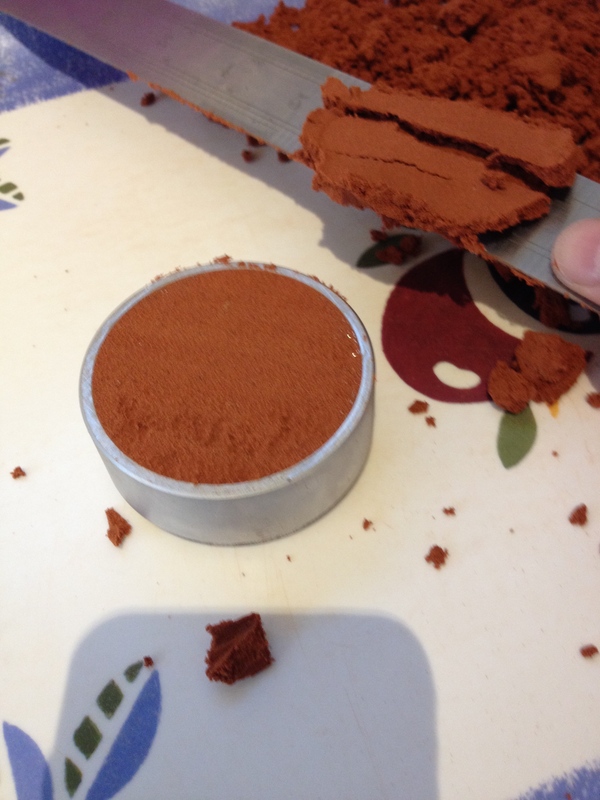 Push it so it is about 1/2 way into the clay. 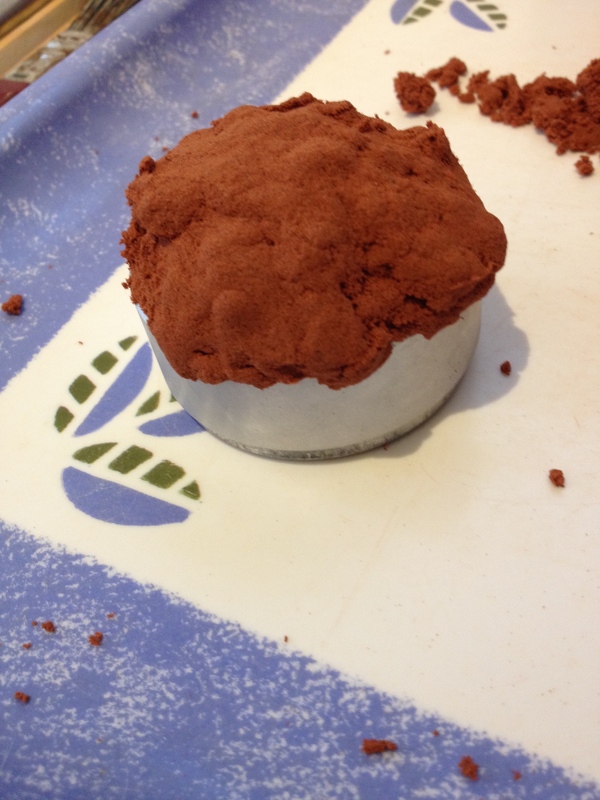 Then cover the surface with a small amount of talc and brush off the excess. 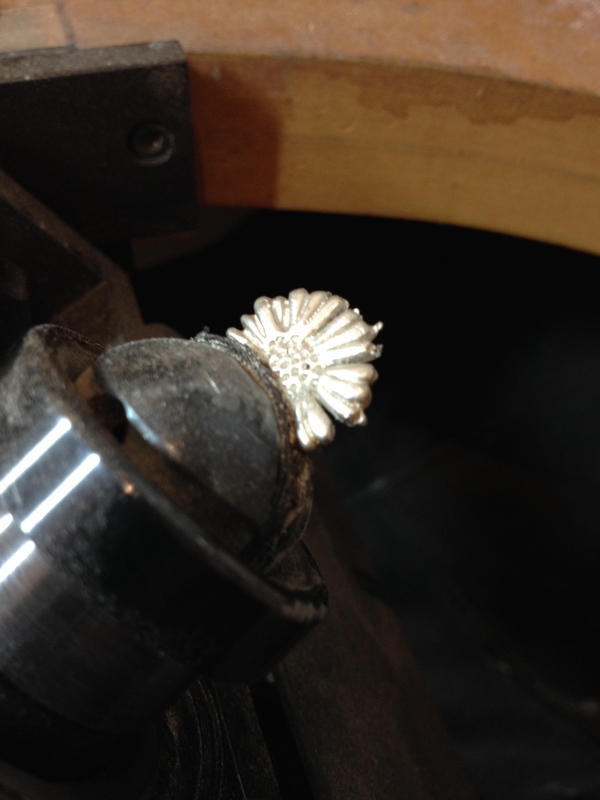 The next step is to put the second ring onto to the first one being careful to line up the index marks. 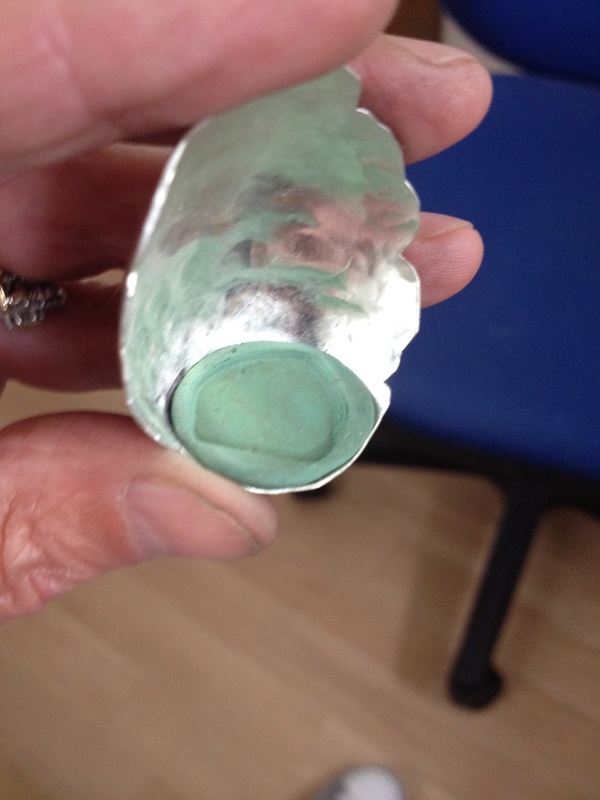 This ring is now filled with clay, hammered down and the top scraped off. Right in the middle of all this clay is the little Fimo Daisy. 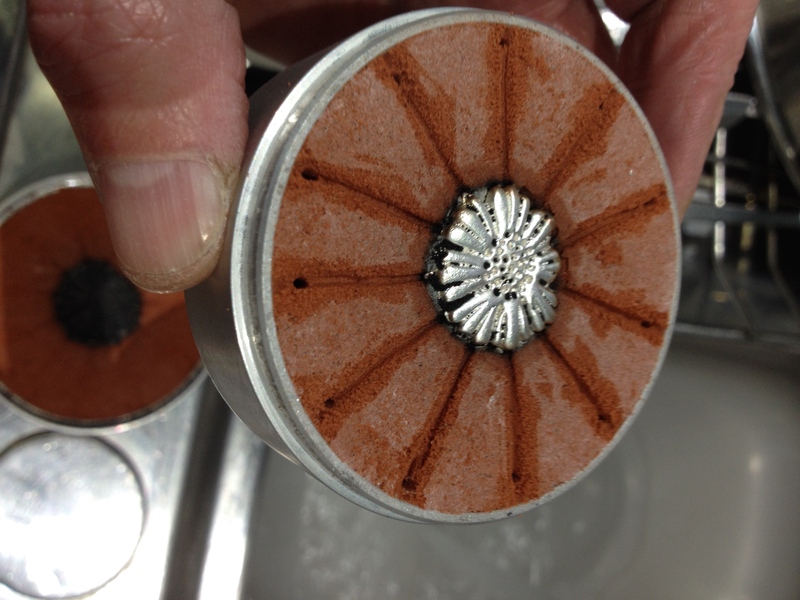 By very gently easing the halves apart again the clay splits at the layer of talc and the daisy is revealed. 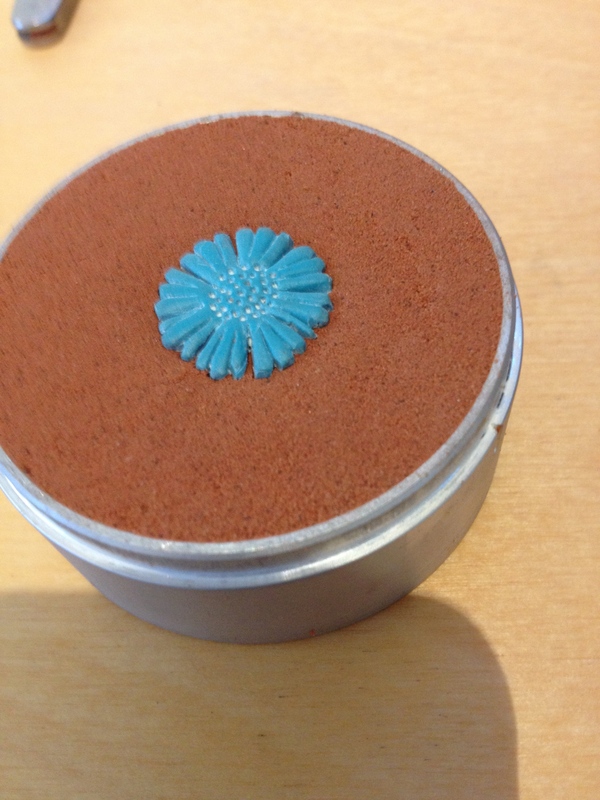 The indentation of the flower can be seen in one half half of the mould. Delft Clay gives a relatively fine impression. After taking the daisy out, if I were to put the mould back together again I would have a void where the Daisy had been. 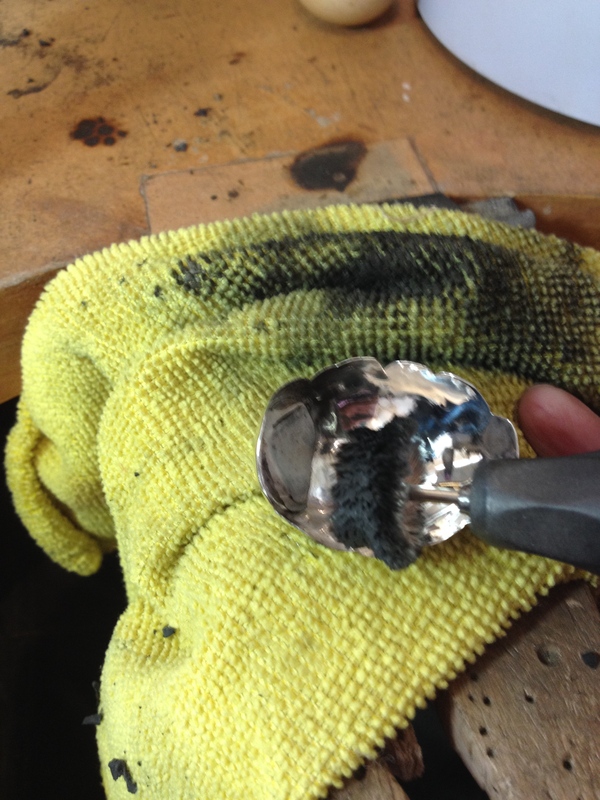 It’s this void that the molten silver fills to create the cast. I need to make an access to this void to allow the silver in and the air out. If the air can’t get out, the silver won’t flow in. You start by making the air holes. I carved channels from the flat side of the daisy to the edge of the mould and then pushed a piece of wire through each channel to create a vent for the air to get out. Good. 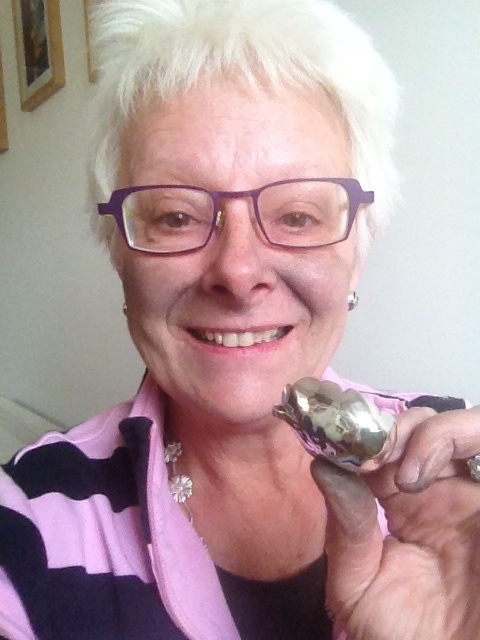 The air can get out but i now need to create a funnel to get the silver in! 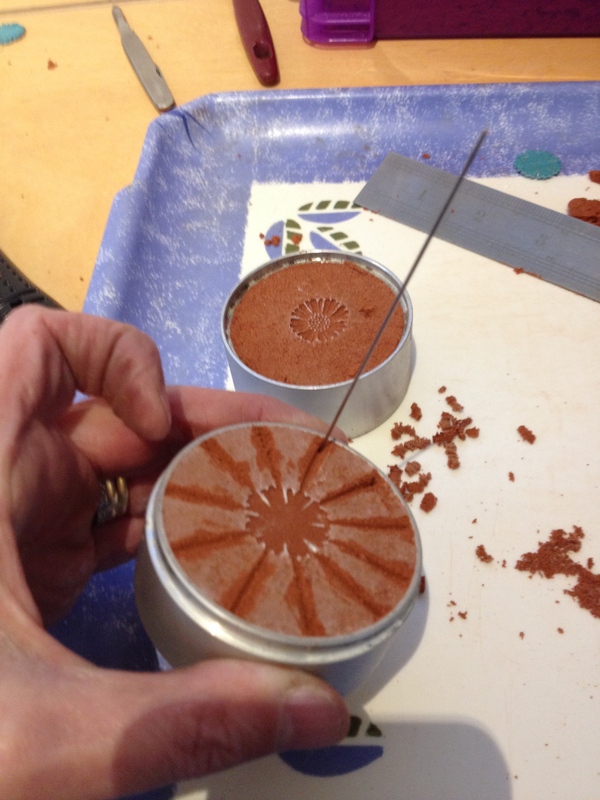 I very carefully pushed a rod from the centre of the daisy to the other side of the clay to make a hole. You can see the air holes all the way round the edge. 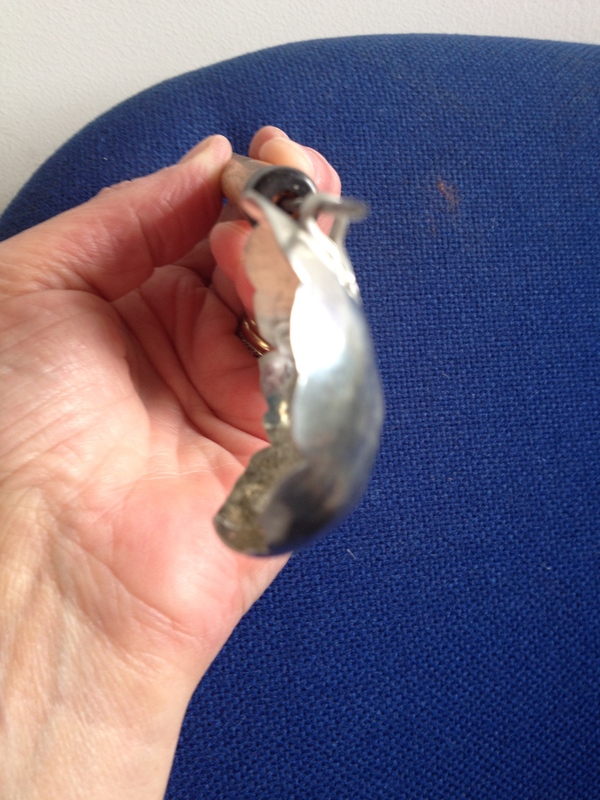 Silver won’t pour through such a long narrow gap so I widened the space into a funnel shape using a penknife. 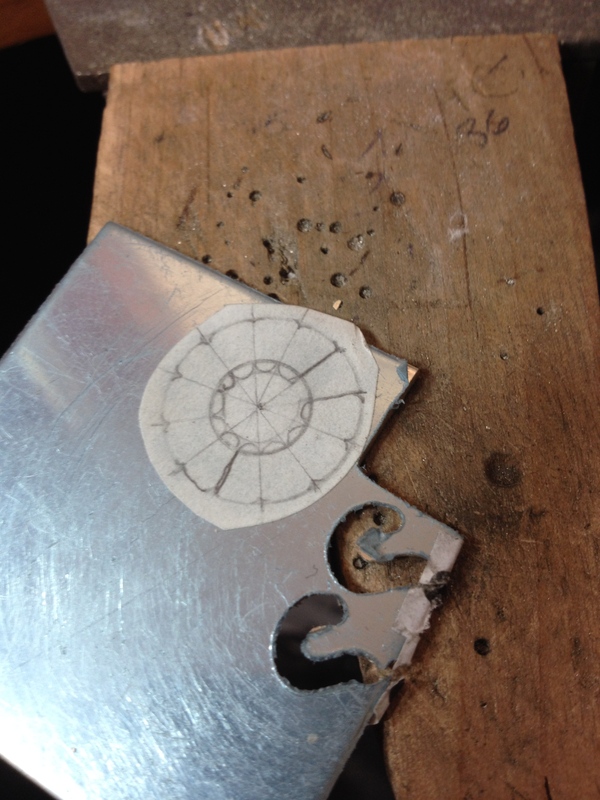 I then put the two halves back together matching up the index marks. You can just see the top of the daisy through the funnel vent. At this stage it must be said that all this is much trickier than it looks and I have only shown you one that looks good! One slip with the penknife and it time to start again. 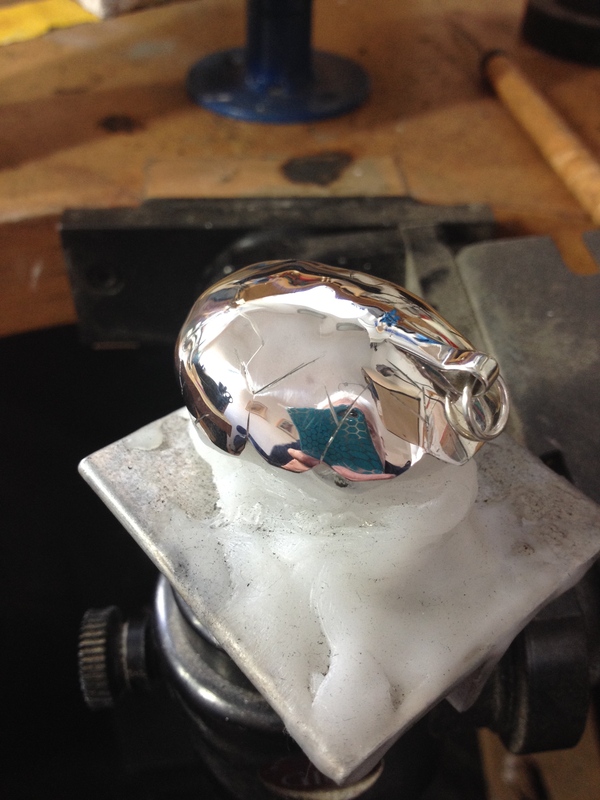 Now the mould is complete the next step is getting the silver ready. 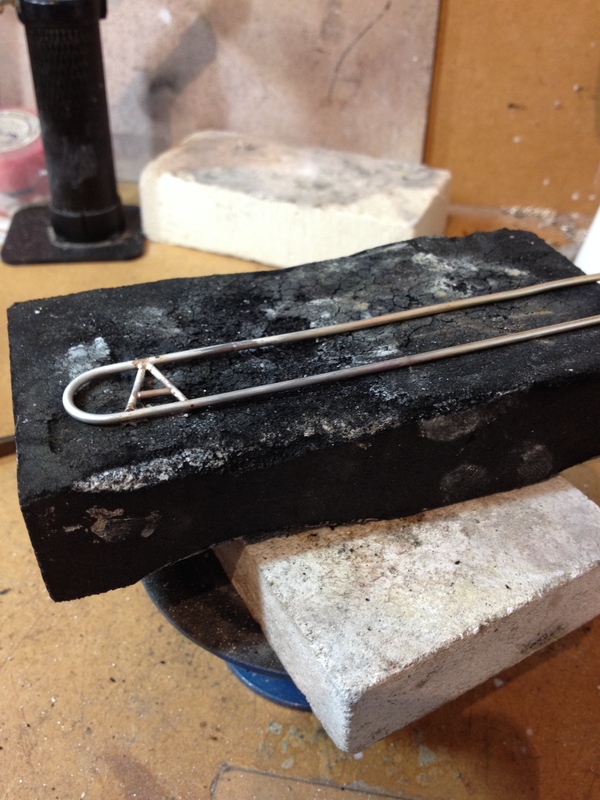 I put scrap silver bits into a scorifier (what a wonderful word!) and then heated them up using my big blowtorch. I created a little ‘kiln’ using fire blocks to keep the heat in and stop me setting fire to my whole bench. 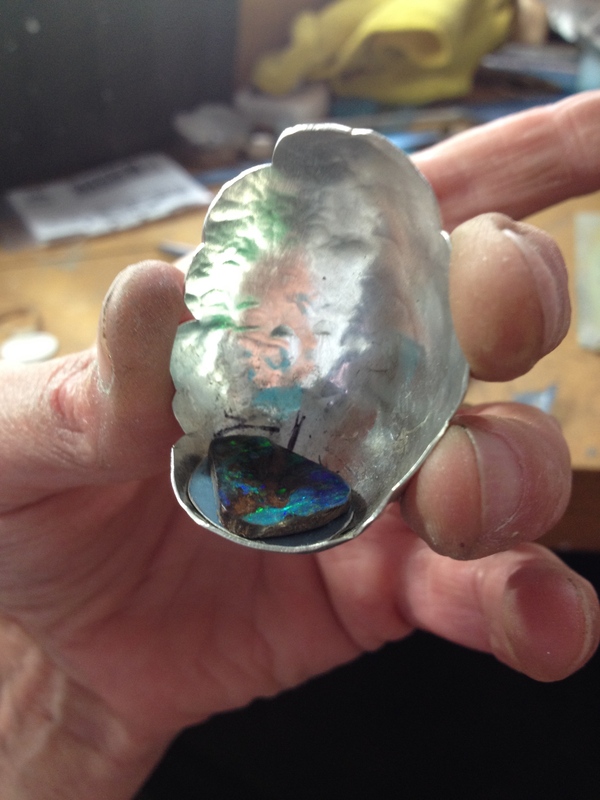 When the silver is truly liquid and very hot it is simply poured into the mould. OH NO! SIMPLE IS NOT THE DESCRIPTION TO USE! I lost count of the number of castings that didn’t work. 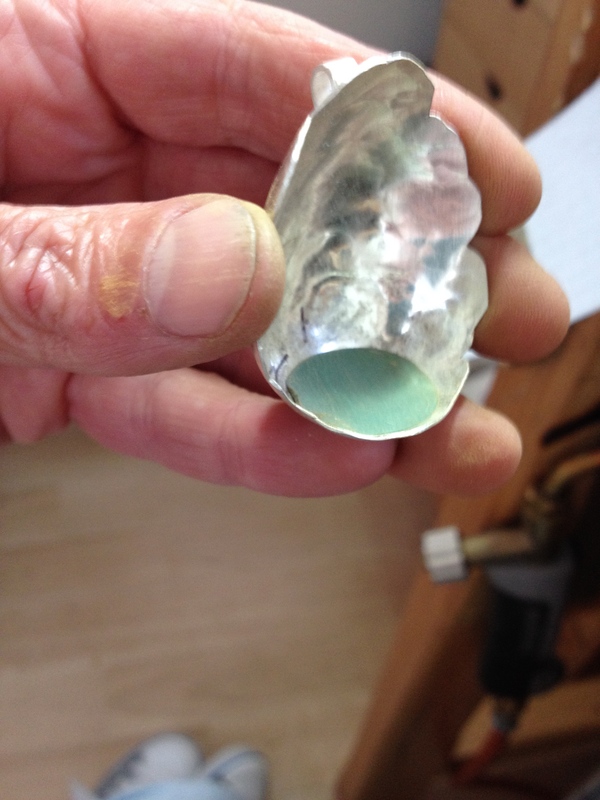 It would appear that the funnel has to be shallow enough, the hole into the void has to be big enough, the silver has to be hot enough and, most importantly, you don’t ‘pour’ it, you ‘dump’ it in! 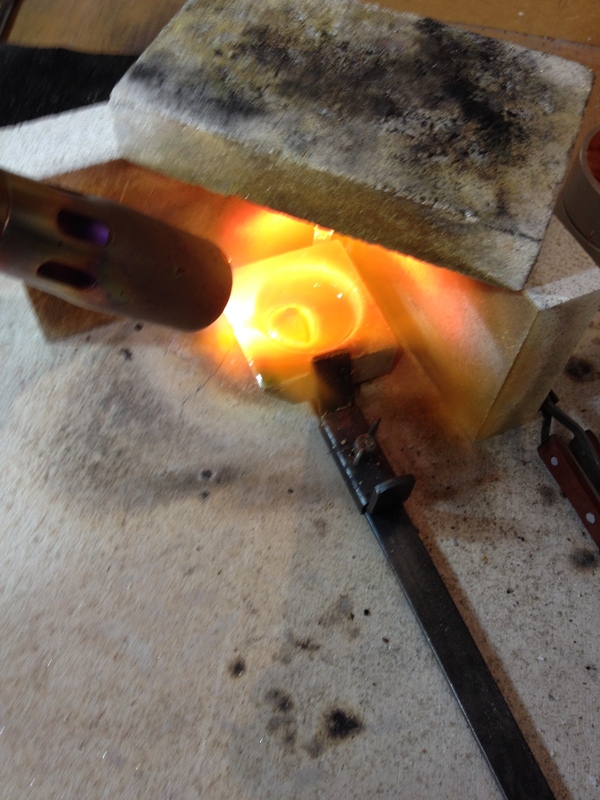 You have to pour and heat at the same time – no photo of this process as I needed both hands. This picture shows the mould just after pouring. You can see the smoke coming out of the air holes. The flames are the oils in the clay burning off. You can see the red hot scorifier in the background. Then, the moment of truth. 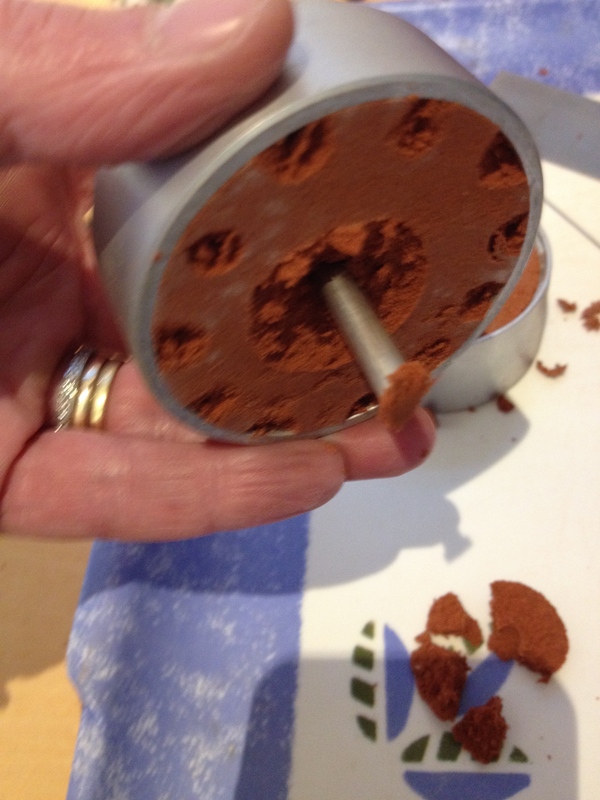 Open the mould and see what has happened. Phew, this one worked well enough although a couple of the petals appear not to have filled completely. Knock the daisy out of the mould and give it a wash. 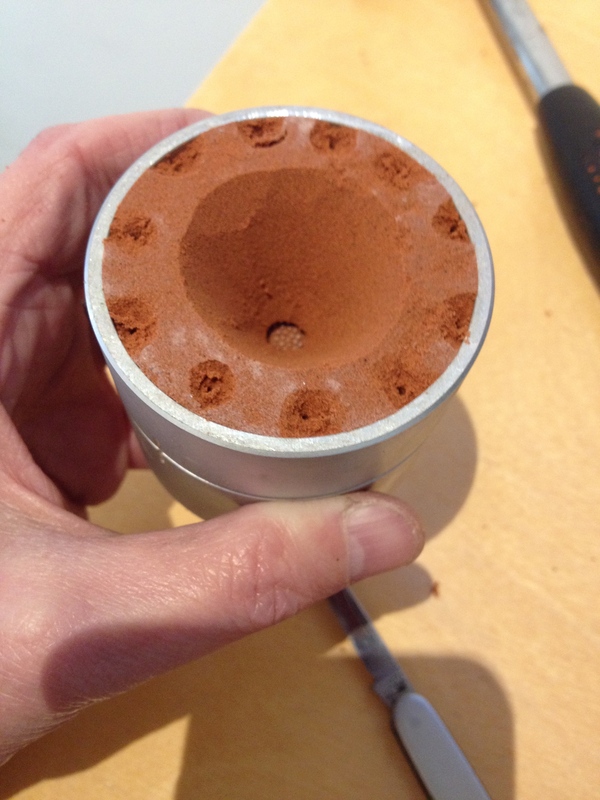 The clay can be reused. You can see the silver that remained in the funnel protruding out the back as a big wedge shape, the ‘sprue’, that will need to be sawn off. 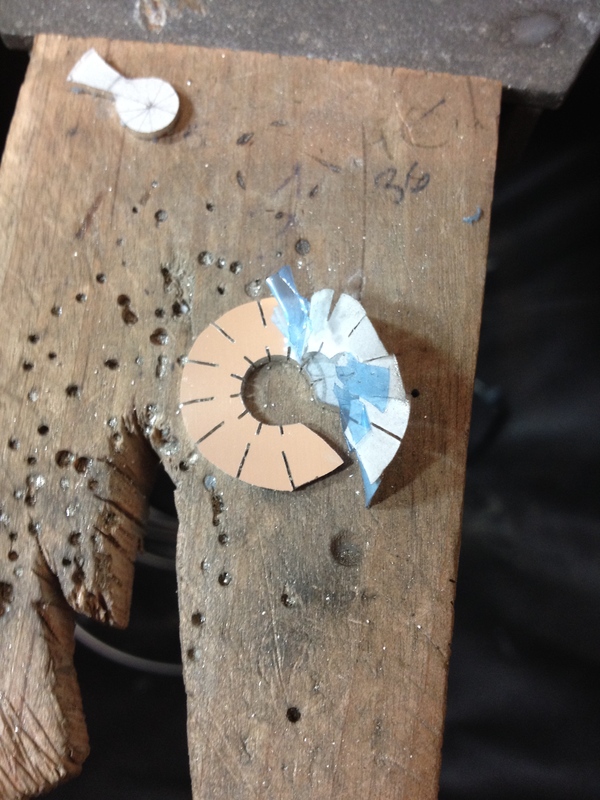 It was a bit of a mission to saw off the sprue at it was at least 4mm thick. 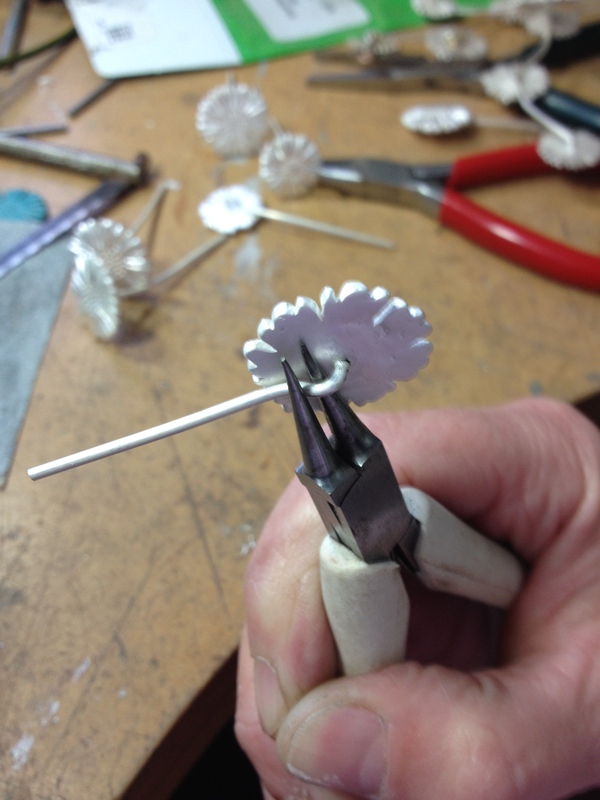 The Daisy then needed cleaning up with saw and file before it was ready to have the stalk added. 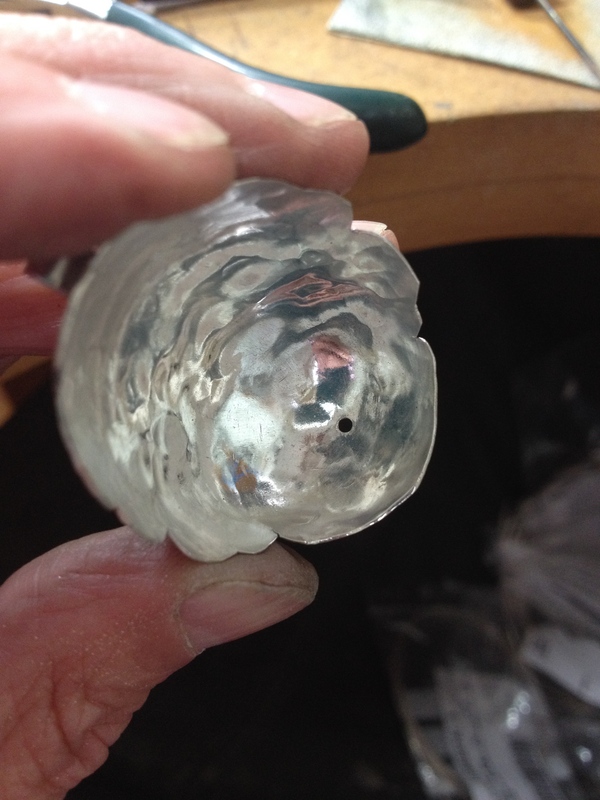 You can see where the molten silver has pushed into the air channels I made. They’ve made little knobbly bits that need filing off. And on to the next, and the next, and the next! 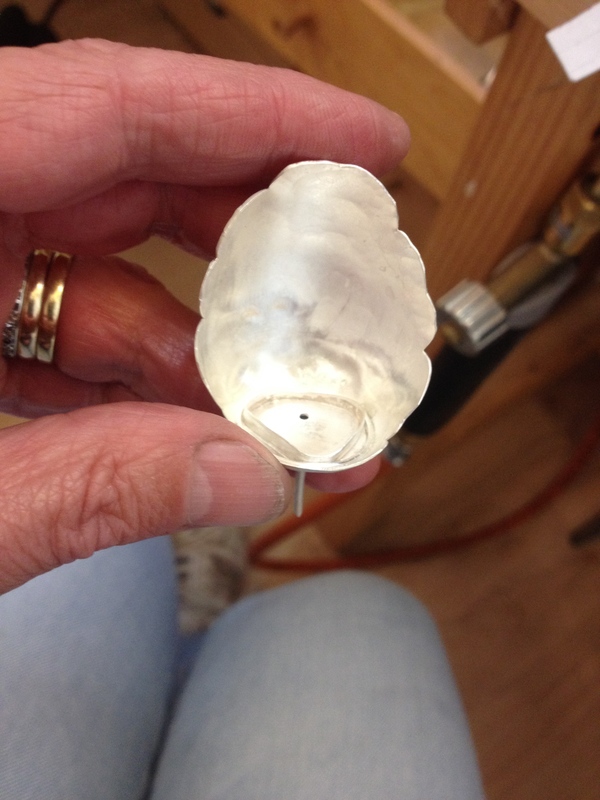 This entry was posted in necklaces, Uncategorized and tagged casting, Delft clay, Flowers, hand made, making, model, molten silver, mould, necklace, scorifier, silver, sprue on March 18, 2015 by deecraven. This is a bracelet for a niece. For a change I’ve included the sketches I made when I was working it out. All is subject to change however once I get the metal in my hands! 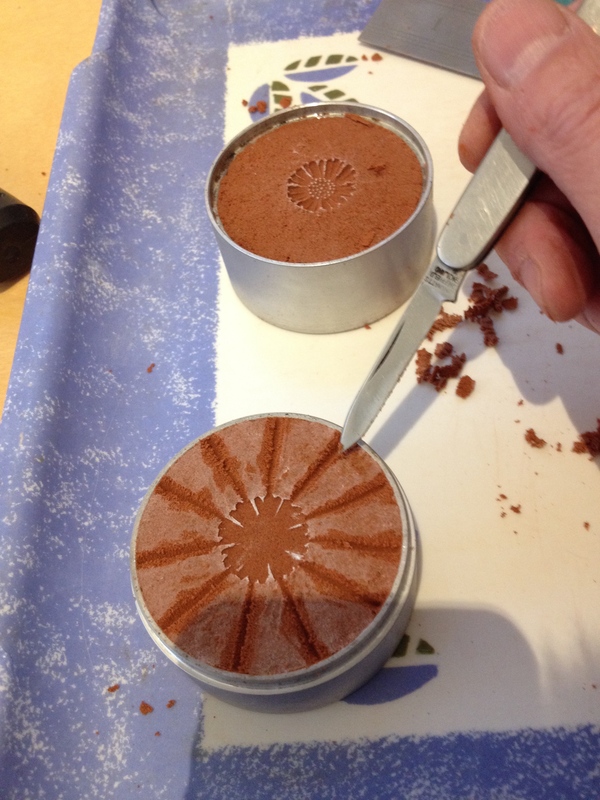 Start by drawing the Daisy shape on a label then stick it to a 1.5mm sheet. 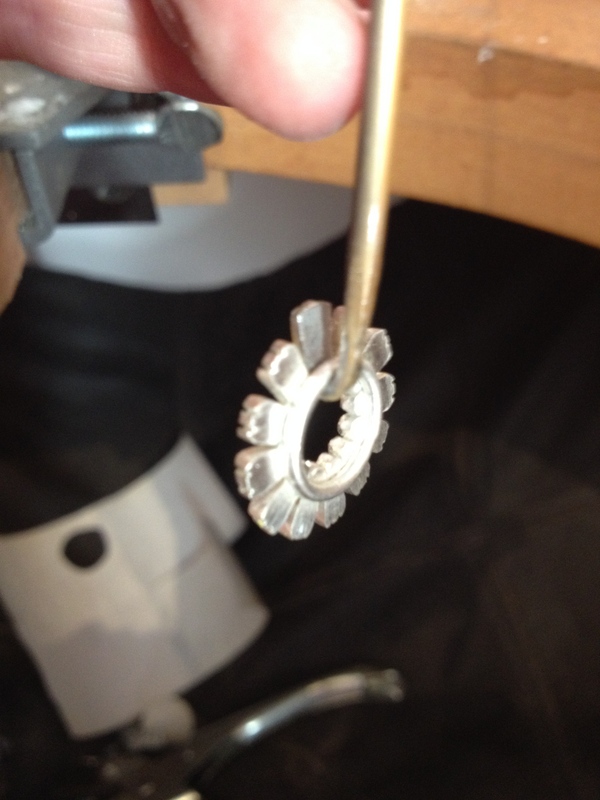 Using the piercing saw I cut round the outside of the shape and then removed the centre and one petal. 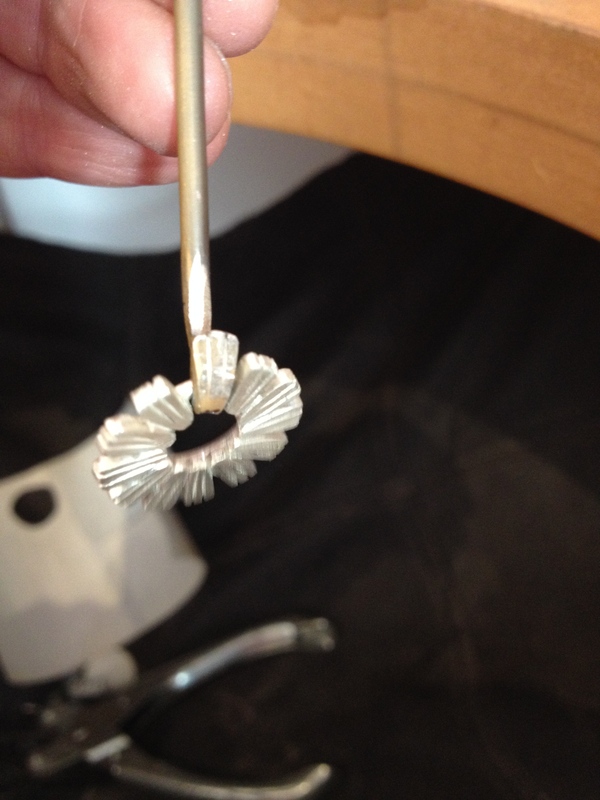 The clasp will form the missing petal when it hooks over the ring. I made a start on separating the individual petals, more as a guide than anything else. 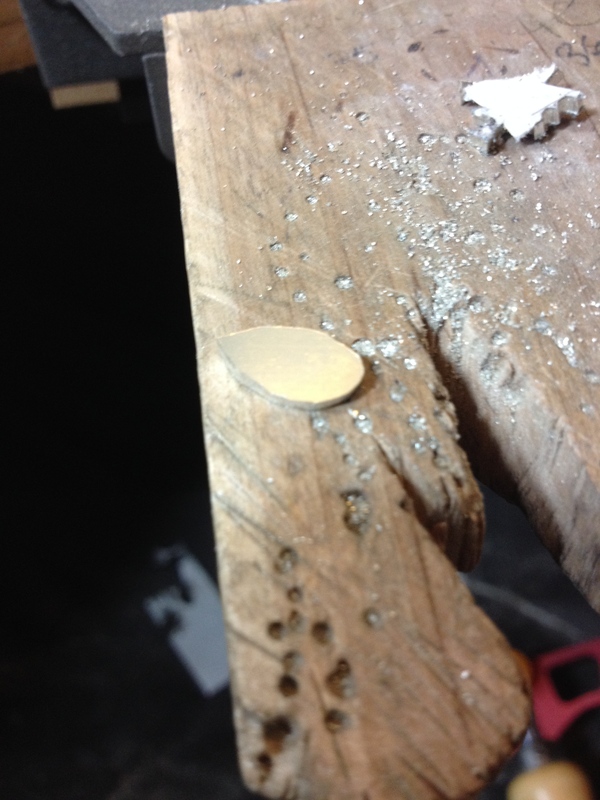 I can’t solder it with the label attached and I need guidelines when I do start work on the petals properly. I didn’t cut all the way through as the whole thing would fall apart! 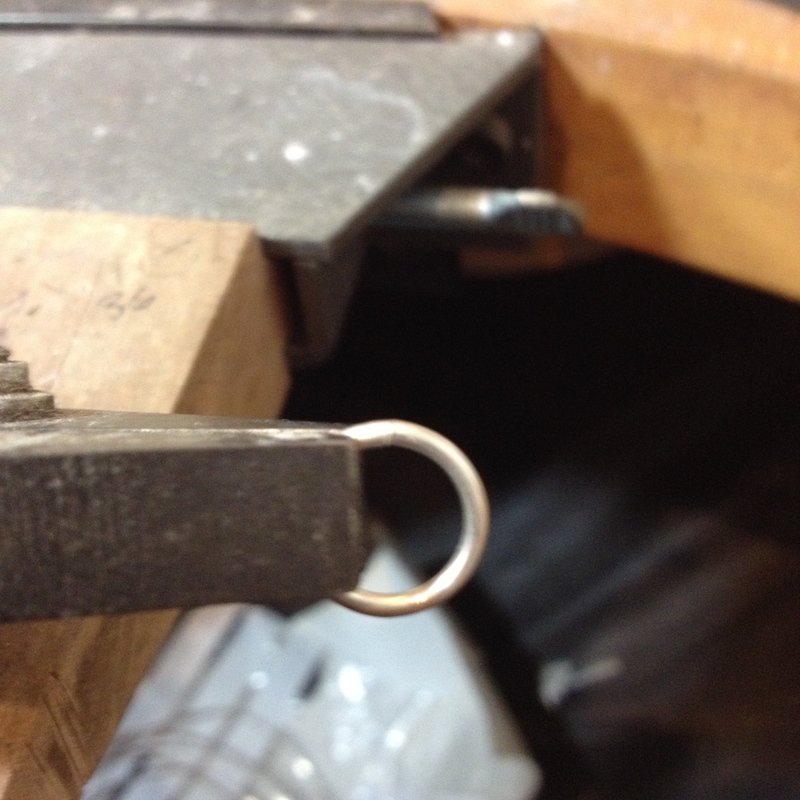 Then make the jump ring using jump ring pliers. 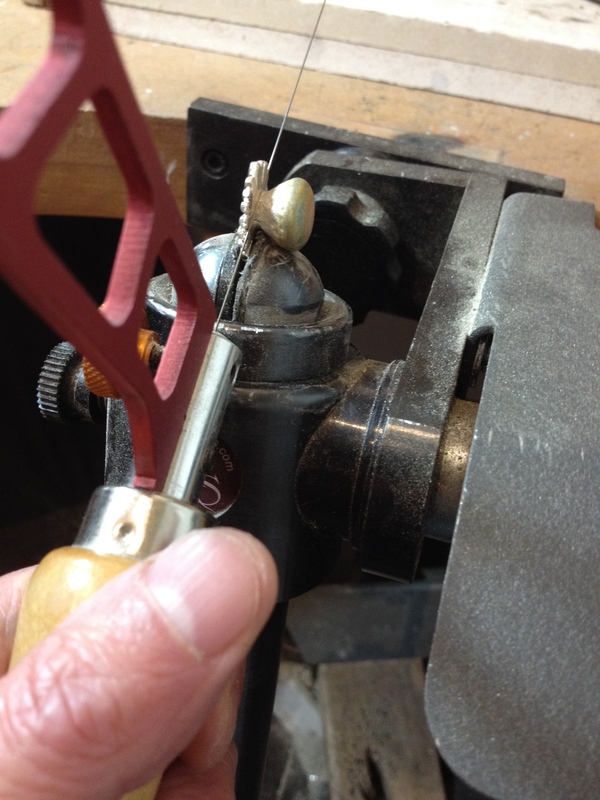 Wind the 1.5mm wire round the pliers, slide it off and then push the shaped wire onto the end of the bench peg and saw through to make 1 ring. 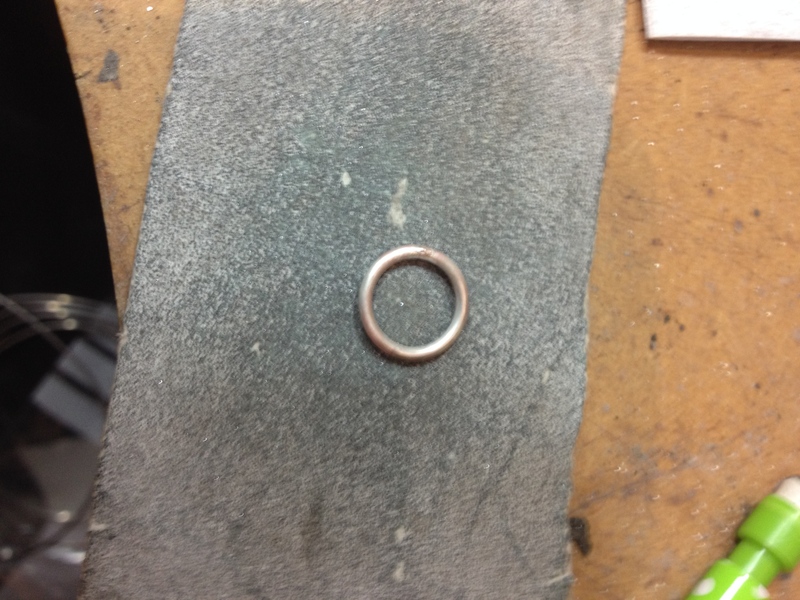 The ring then needs bending with pliers to close the gap between the ends. 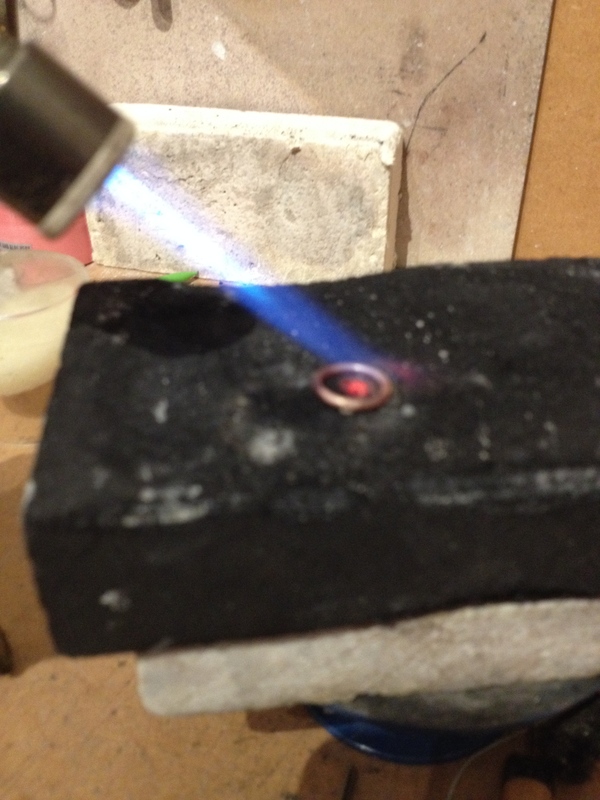 It’s a simple matter then to solder the ring closed. 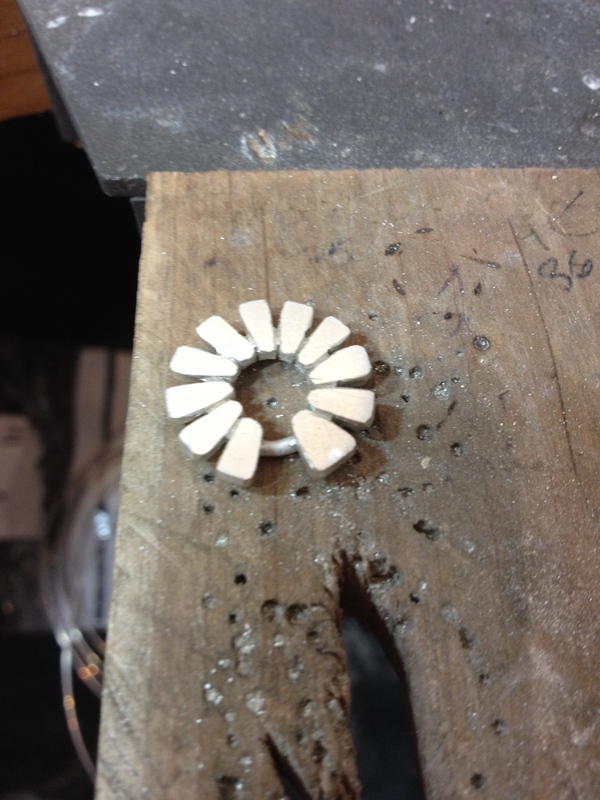 Now I need to prepare the Daisy shape so that the jump ring can be soldered onto it. First peel off the protective film, then thoroughly clean it. 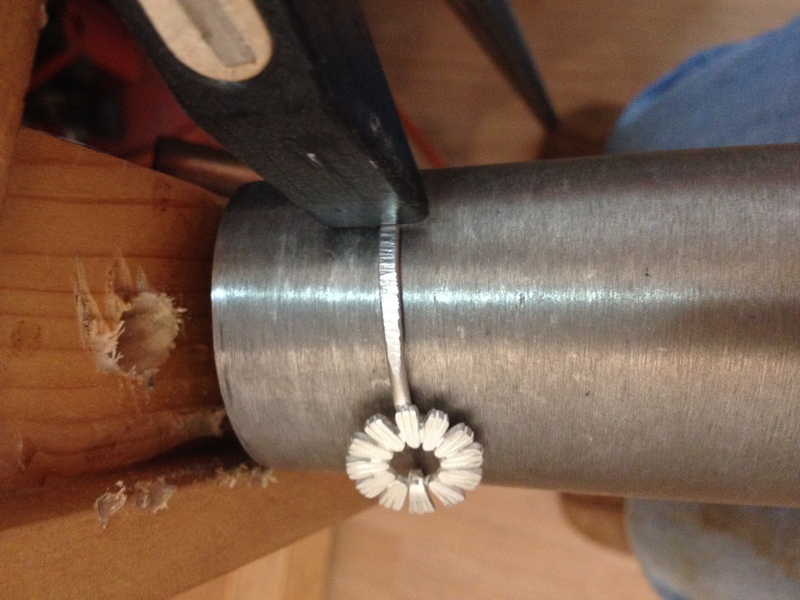 The jump ring is prepared by sanding a flat edge so it will sit cleanly on the Daisy. The flux the whole lot and add tiny pallions of solder. I’m glad I partially sawed the petal shapes. It made locating the ring much easier. 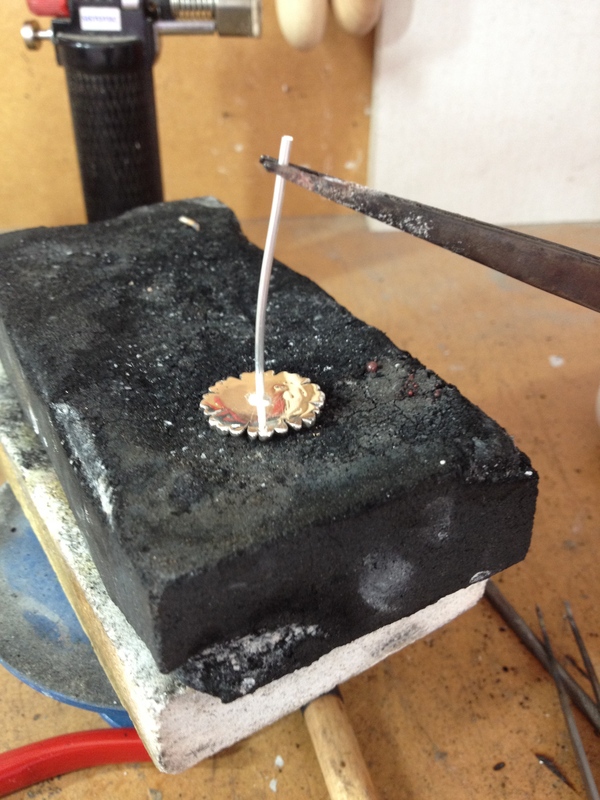 Bring it all up to temperature and watch the solder flow! 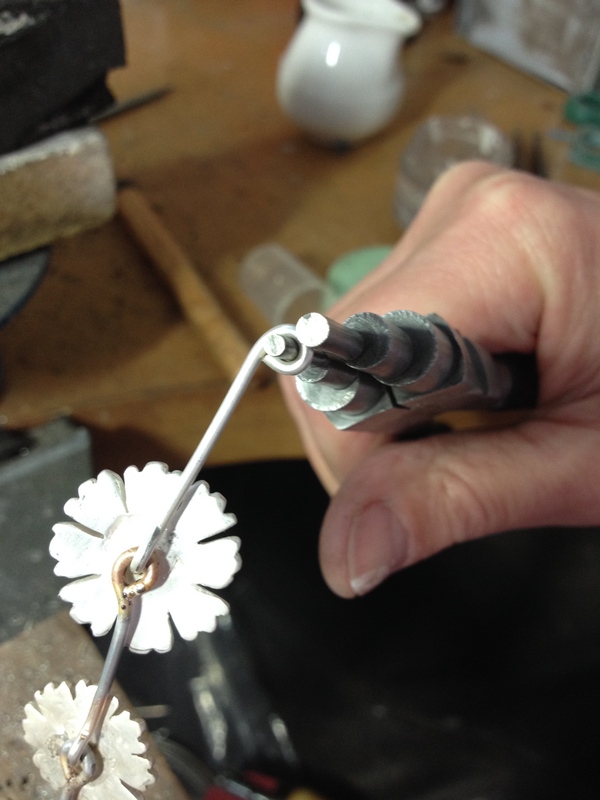 Once pickled I shaped the petals to separate them, they need filling and detailing now. 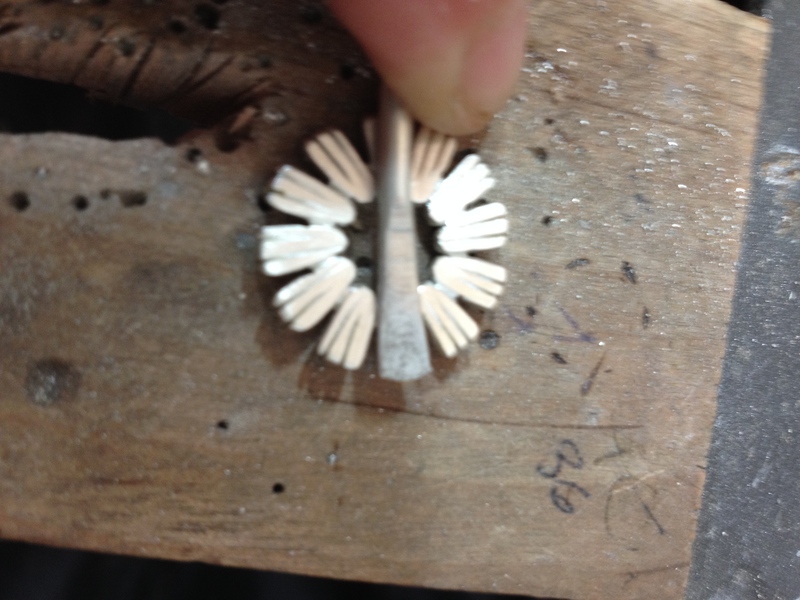 I held them in the bench mate and used the saw to cut grooves down the length of each petal. 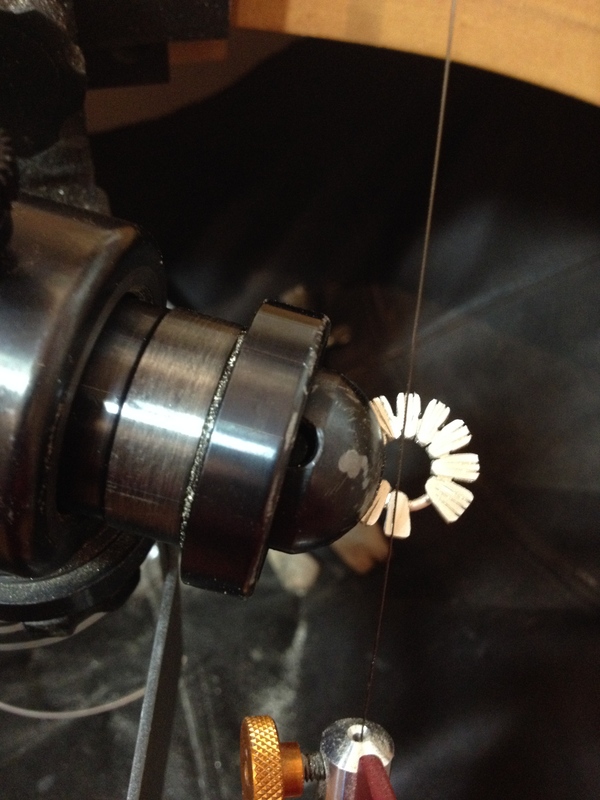 The ends were filed and a groove filed between each petal to give the illusion that they are all separate. Looks pretty. (I have no nails left!) You can see the gap where the hook will go. Now to make the bracelet part. 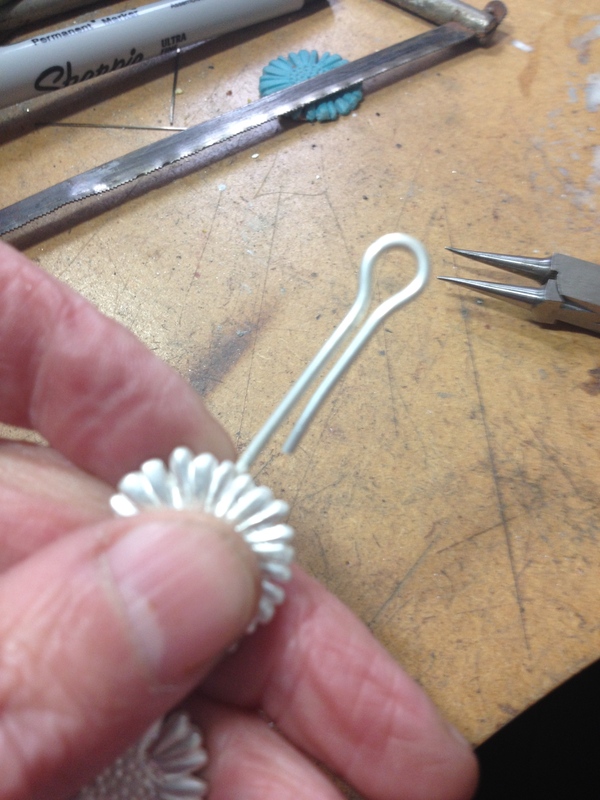 I flattened and shaped one end of 2mm round wire to make a petal shape that matches the petals on the daisy. I hammered it onto a steel block. You can see how the end of the wire flares out as the metal is thinned. It needed more shaping and filing before it was close enough. I used the same technique with the saw to cut the grooves that give the detail to the petals. 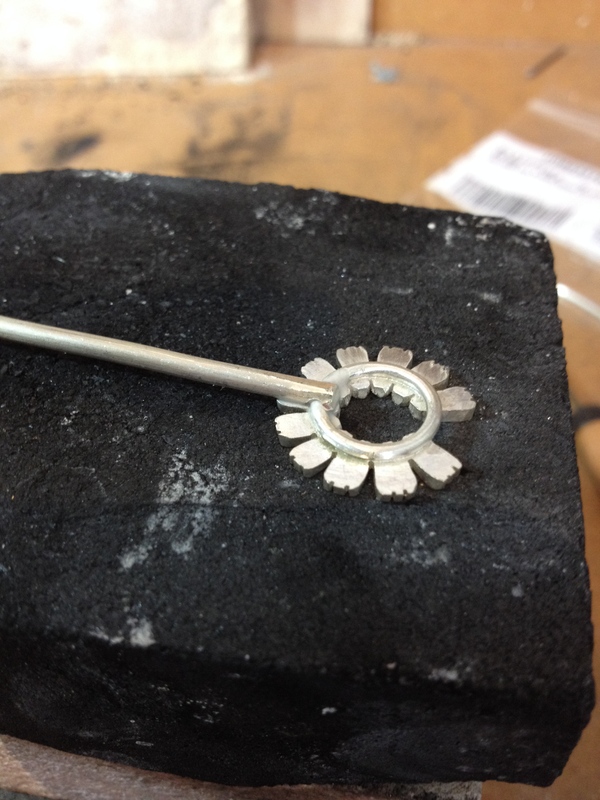 I filed down the base of the petal to the same profile as the existing petals, then bent it over some wire so the petal would fit over the inner ring of the daisy. The other end of the wire will be permanently fixed to the opposite side of the daisy. Having got the end that will form the catch I need to make the part that’s fixed. 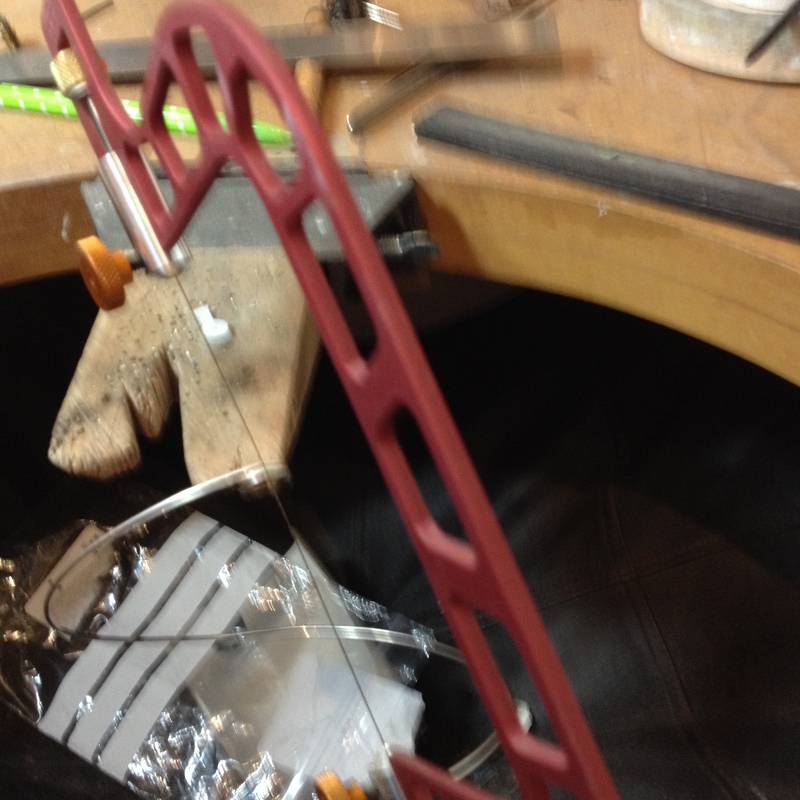 I measured about 6 1/2″ and cut the wire off. That should be long enough for the bracelet. 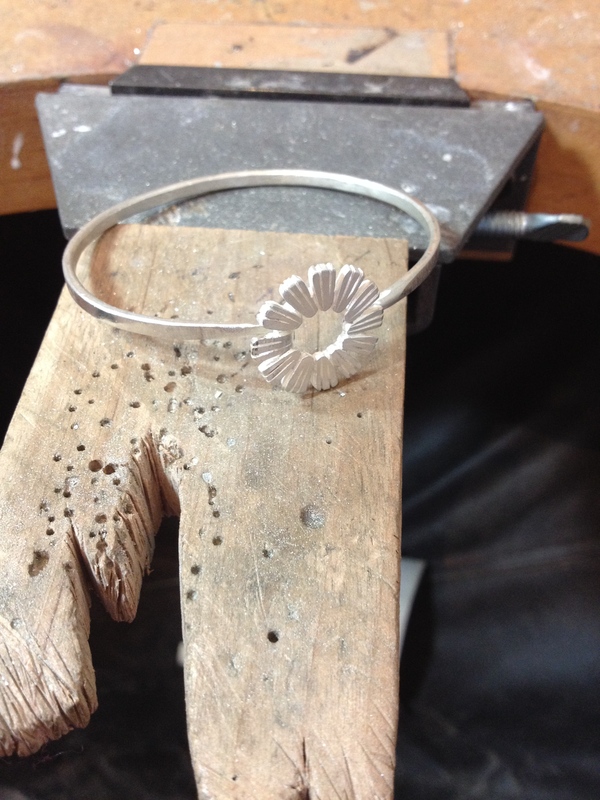 I notched the end of the wire so it would fit snugly underneath the inner ring of the daisy opposite the ‘missing petal’. This was trickier than I thought it would be and took a long time. My first attempt didn’t work do I sawed off the end and started again. 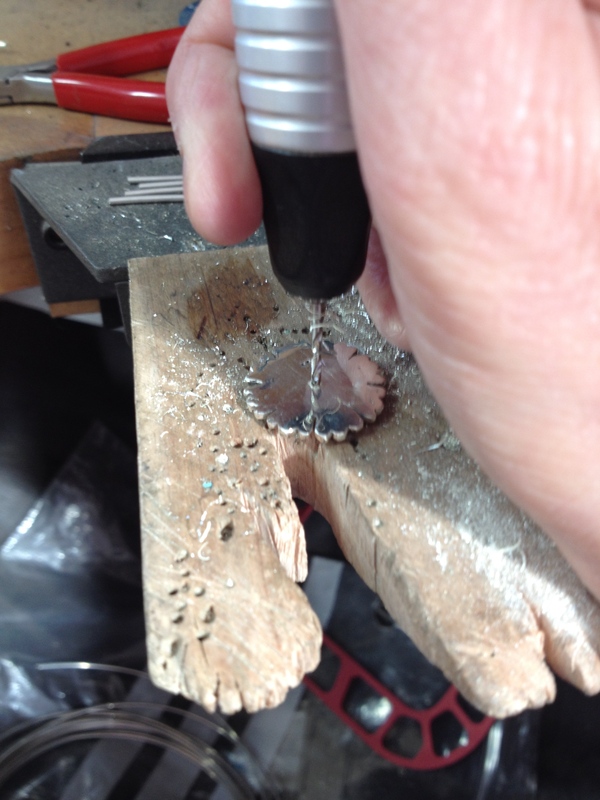 I used a drill bit in the pendant motor to file out the groove. I needed to keep offering the wire up to the daisy to check the fit. I soldered ithe end of the wire in place. 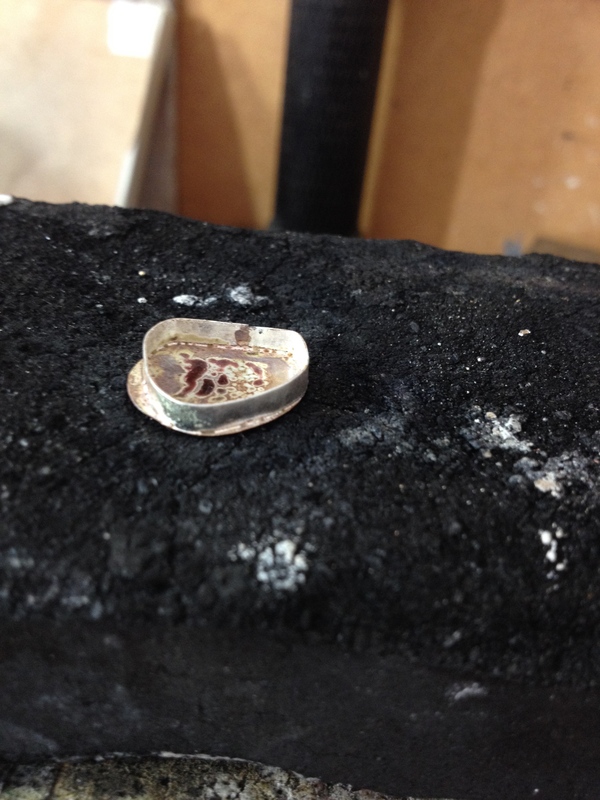 I use hard solder throughout if I can as it gives a stronger joint and flows better than either medium or easy solder. 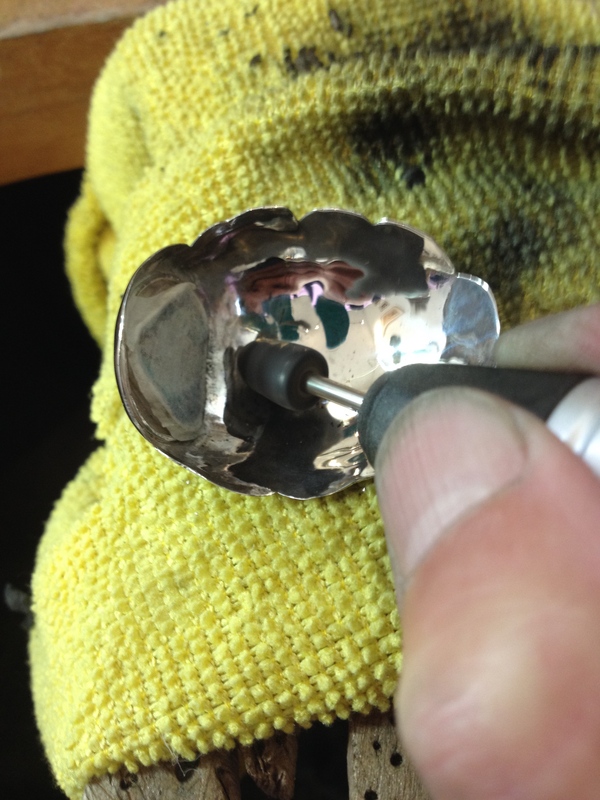 There is a risk that previous solder joints will melt when reheated but fresh solder seems to run before the older, previously heated joints do. 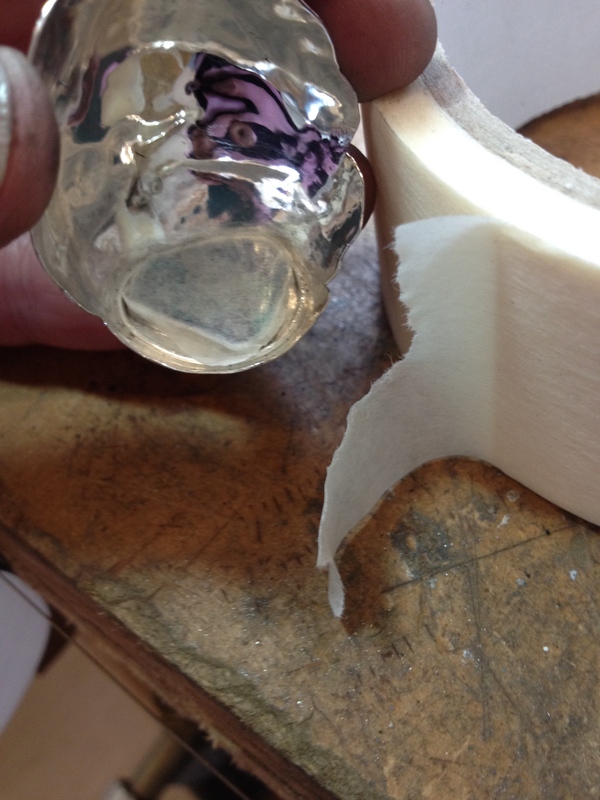 This is actually quite tricky and you have to watch very carefully and remove the heat before the older joints run. 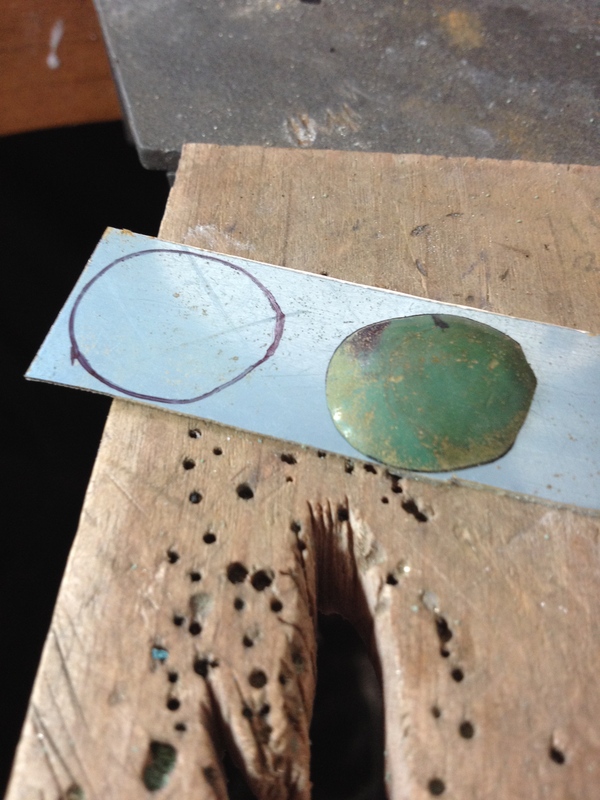 The recommended method is to use progressively easier solders as they don’t require the metal to be as hot but, if you are careful, you can use just hard all the way through. 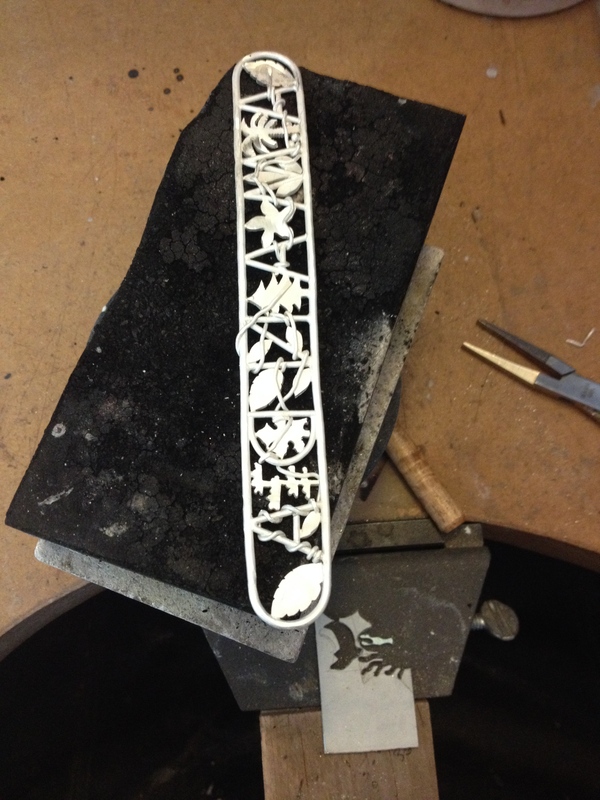 Now to bend the bracelet round and see if it all comes together. I want the petal hook to look like the other petals and to slip easily in and out. I slipped it on to see how easy it would be take on and off. It was way too tight and while it did up easily enough it would NOT come off! Himself was curiously absent just then and I must have spent about 30 minutes struggling to undo it. It’s clear the end I cut off when I was trying to fit the end of the wire onto to the daisy made all the difference between a snug and a downright impossible fit. 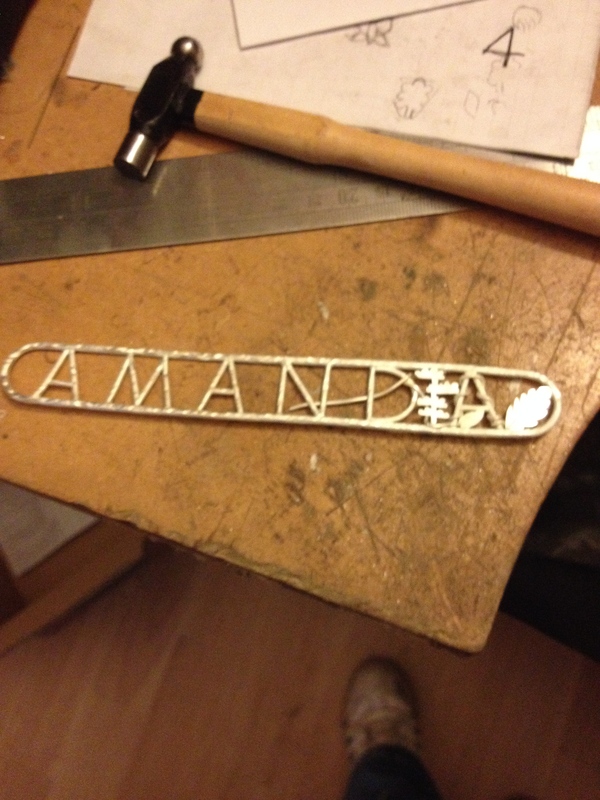 However I have now stress tested the solder join! 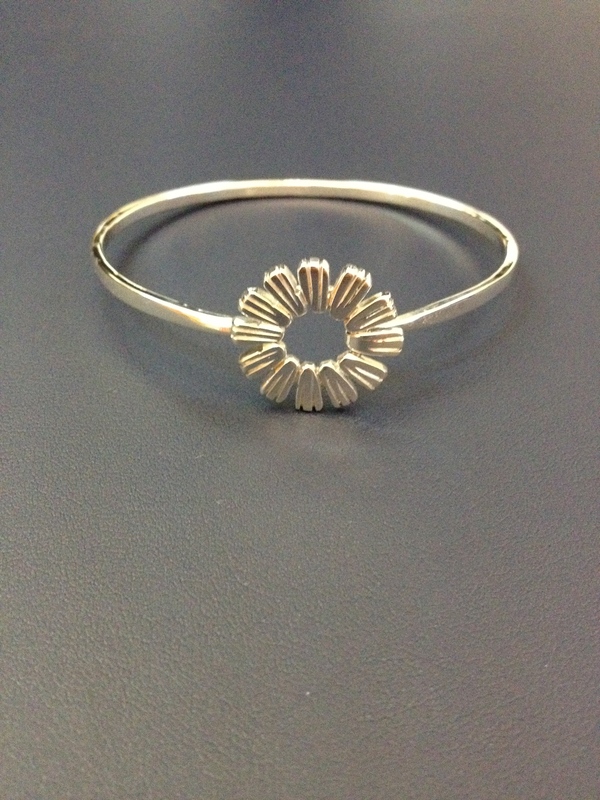 The bracelet is simply too small and will need stretching. Time to get out the hammers! 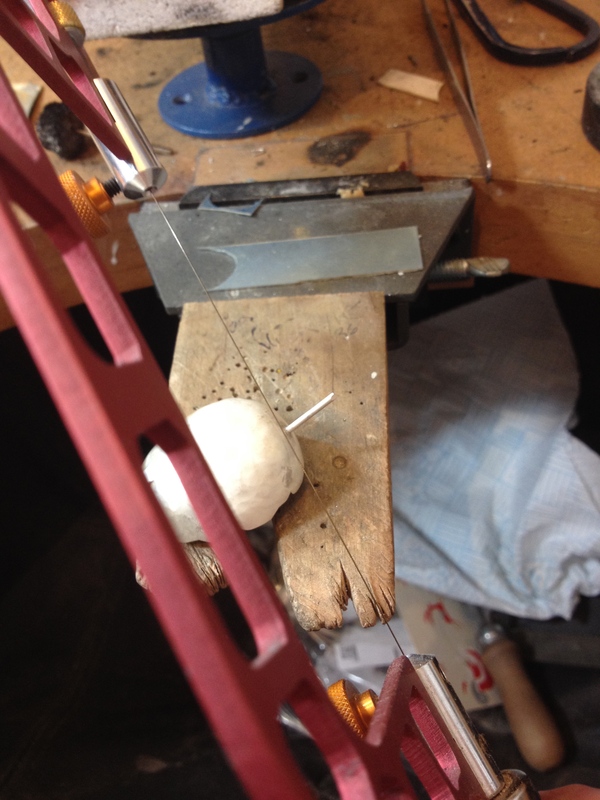 I used the goldsmiths hammer to work across the width of the wire. This will have the effect of slightly lengthening the wire at the same time. It leaves little dents all along the length though. To smooth it I used a planishing hammer to flatten all the dents out. 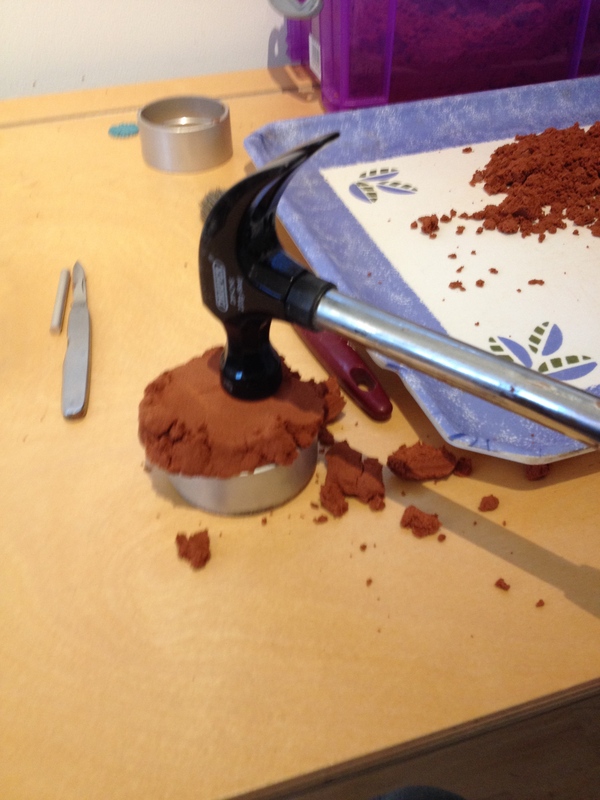 The flat face of the hammer works really well. In the shot below you can see the transition from ridged to smooth. 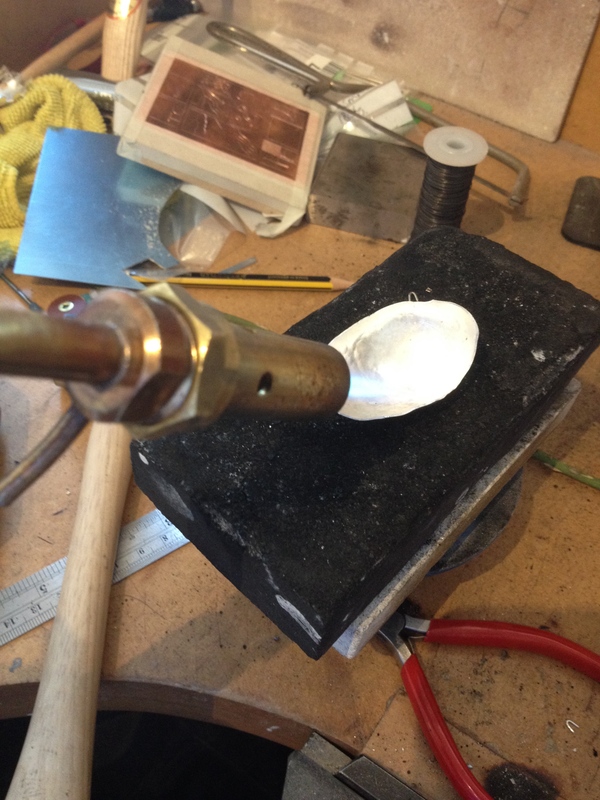 I’m hammering it on a bangle mandrel which is really heavy! More finishing up work needed and then polishing. I don’t know why I am always surprised by how dirty I get when polishing. There we are, all done. I think it’s pretty and I really hope she likes it. 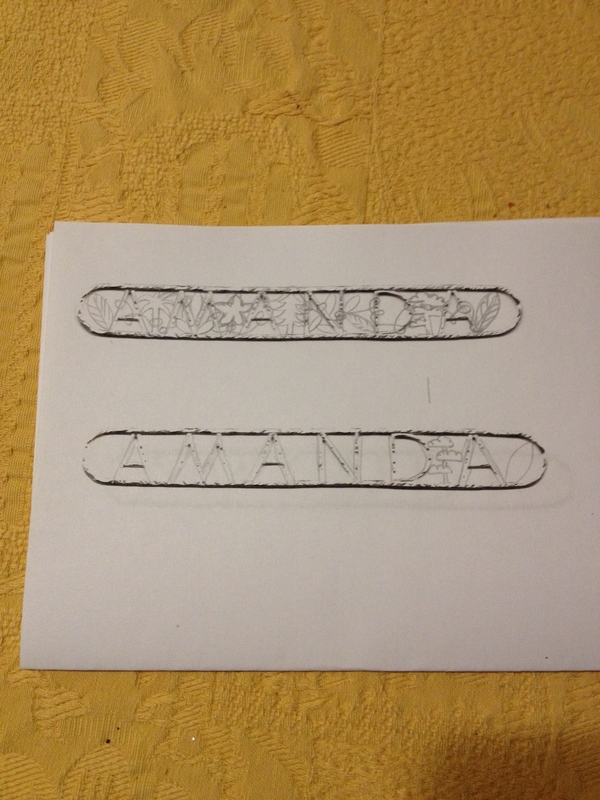 This entry was posted in bracelets and tagged 2mm wire. 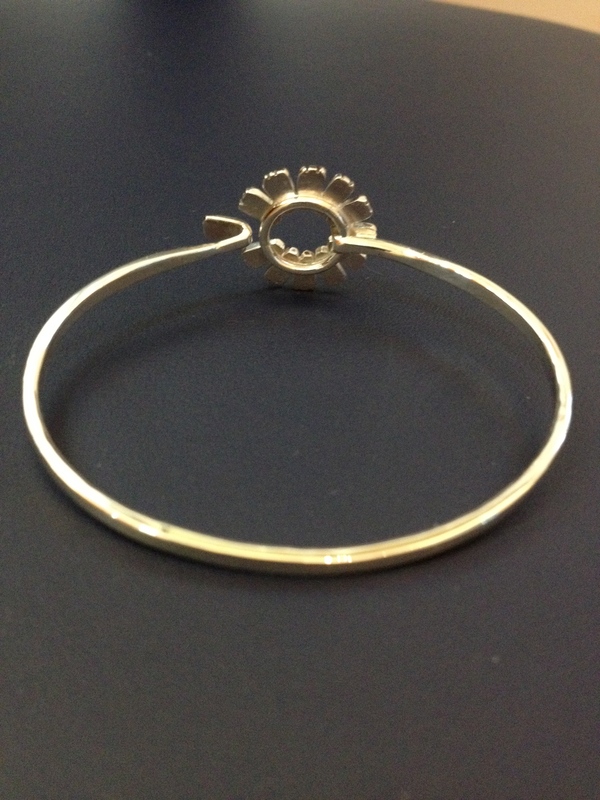 1.5mm wire., Bangle, bangle mandrel, bracelet, Daisy, filing, Flowers, forming, goldsmiths hammer, hand made, hard solder, jewellery, jump rings, planishing hammer, silver, silver bangle on November 28, 2014 by deecraven. My friend Amanda liked the Tallulah cuff so I’m making one for her. She loves trees and leaves so I hope I can incorporate foliage into the design. 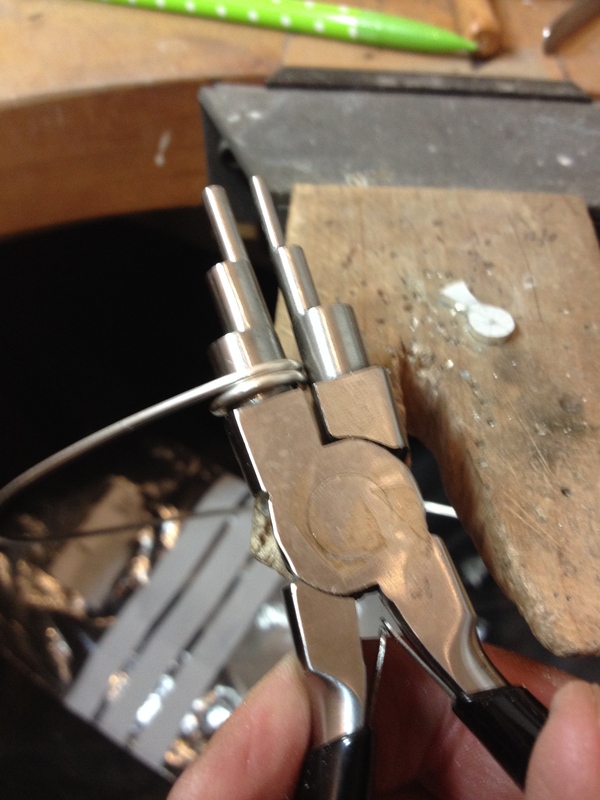 Start with the 2.00mm round wire loop that forms the base of the cuff. Next step is to start on the letters. 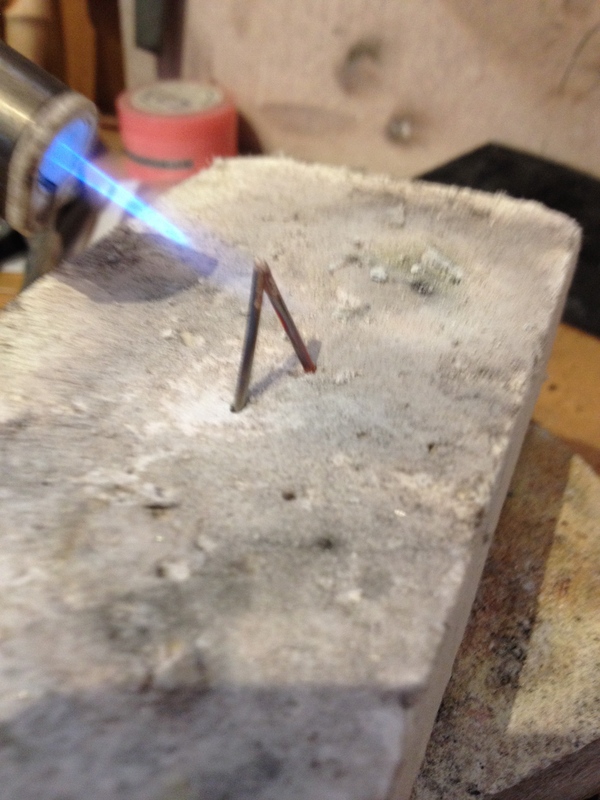 ‘A’ seems the most logical start so I cut a length of 1.5mm wire and filed the end off at an acute angle. I made another one to match and the after several attempts managed to find a successful soldering technique. 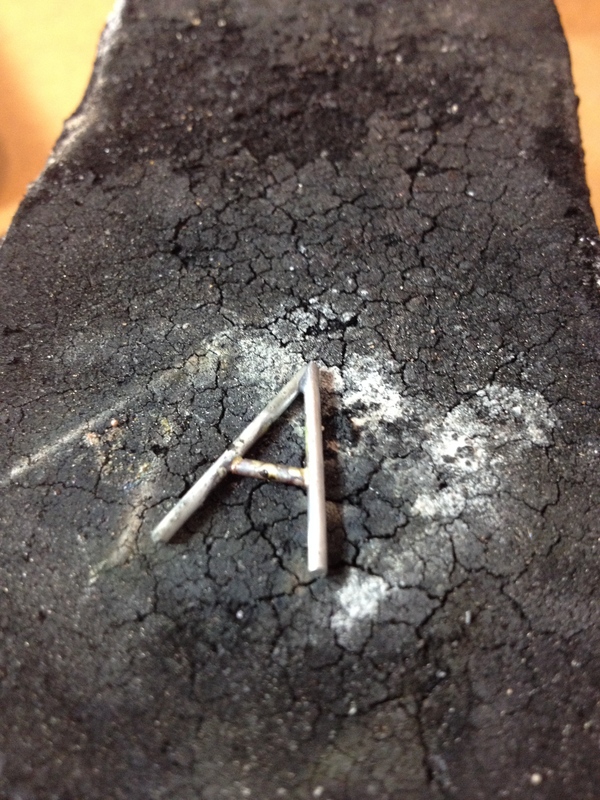 I used a fibre soldering block and pushed the two legs of the ‘A’ in so that they joined at the top. 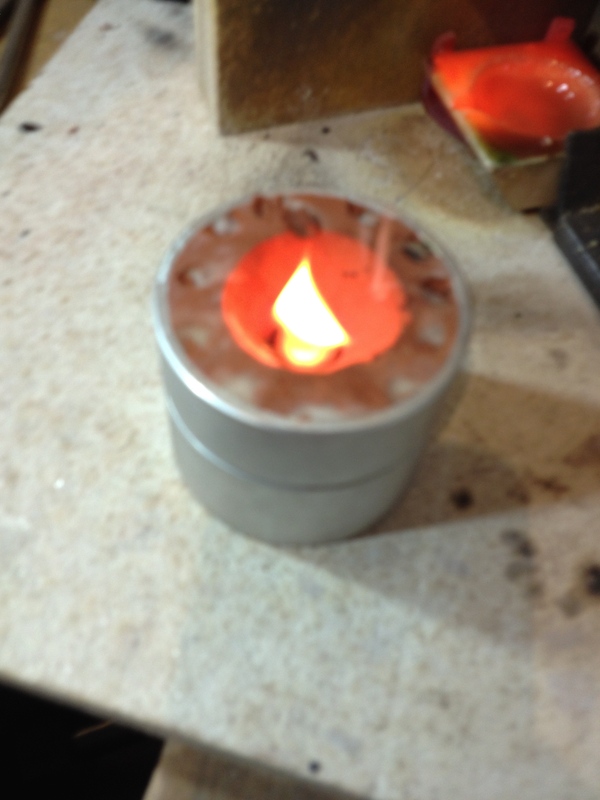 I fluxed the join and put a snip of solder on, then used a small flame to bring the two parts to temperature and, as soon as the solder flowers, took the flame away. 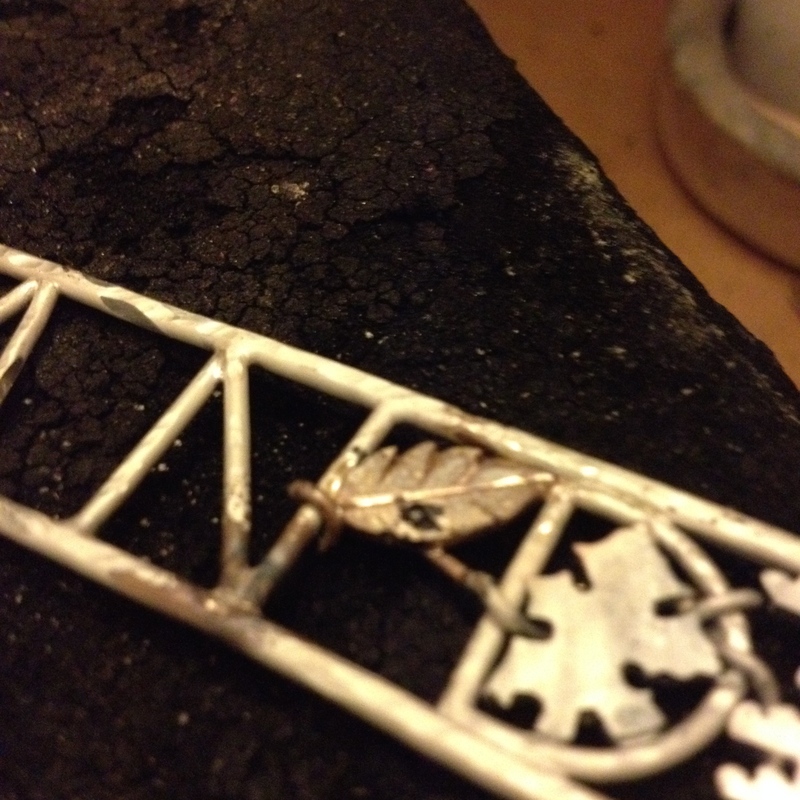 I then added the central bar and soldered that in place. Now to start building it. 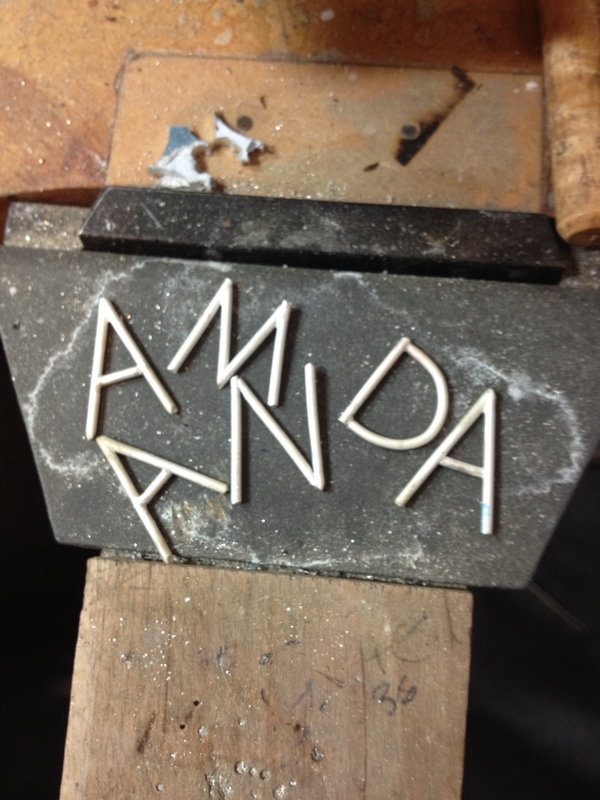 It takes the big torch to solder the letters to the frame because the longer length of wire soaks up the heat. 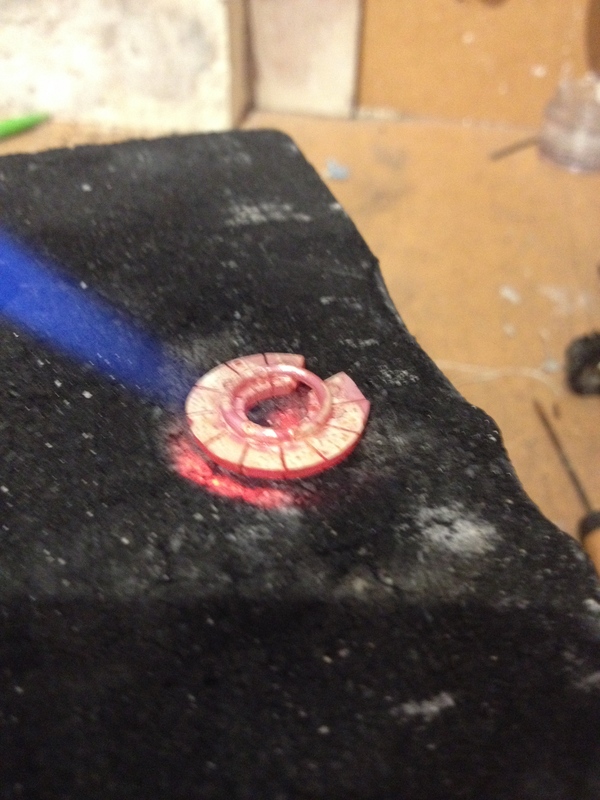 I need to be really careful not to play the flame over parts of the cuff that I don’t want soldered as they may melt! All done. Yup still looks like a boring ladder. so better add some texture. I used hammers, sandpaper, files and rotary tools to get the finish I wanted. 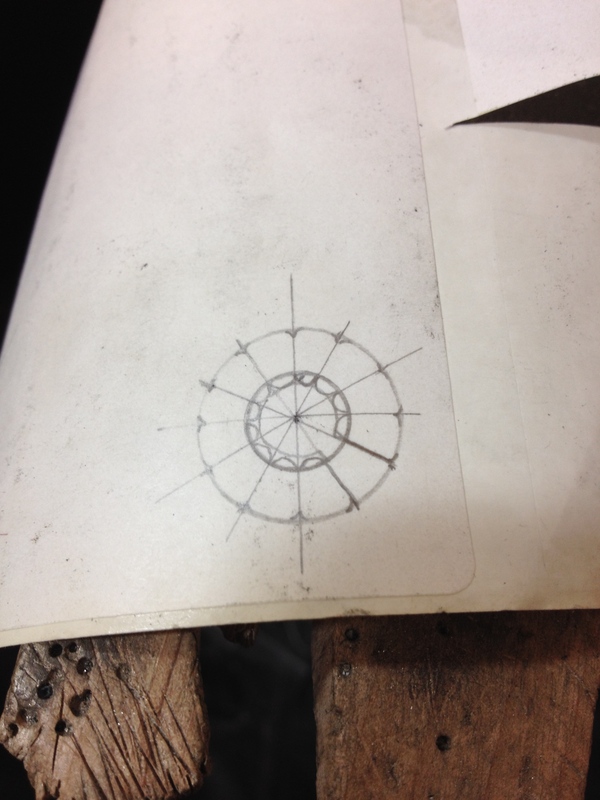 To work out the design I photocopied the frame and then used the copy to draw out designs. Using 1.5mm sheet I started cutting out the motifs for the cuff. 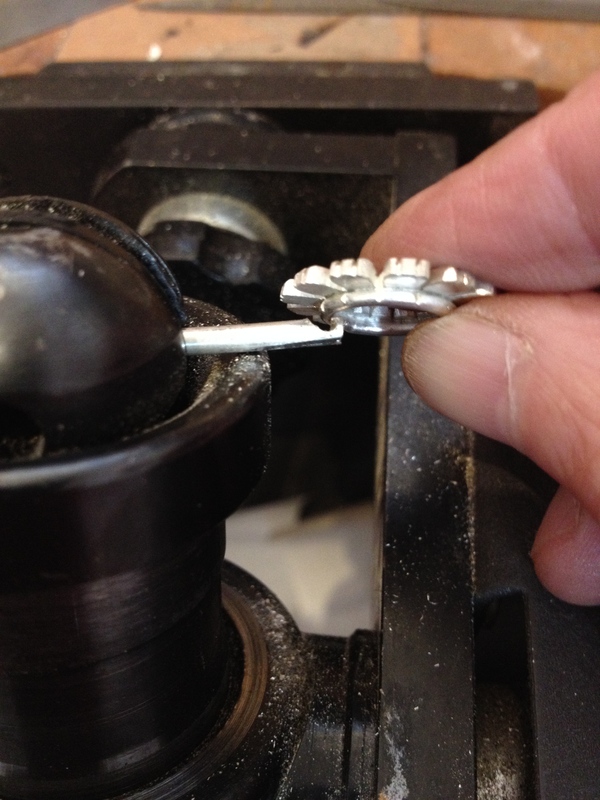 This is really quite tricky as they have to fit exactly and stay in place long enough to be soldered without wiggling free. They are also tiny and play havoc with any fingernails I may have left. 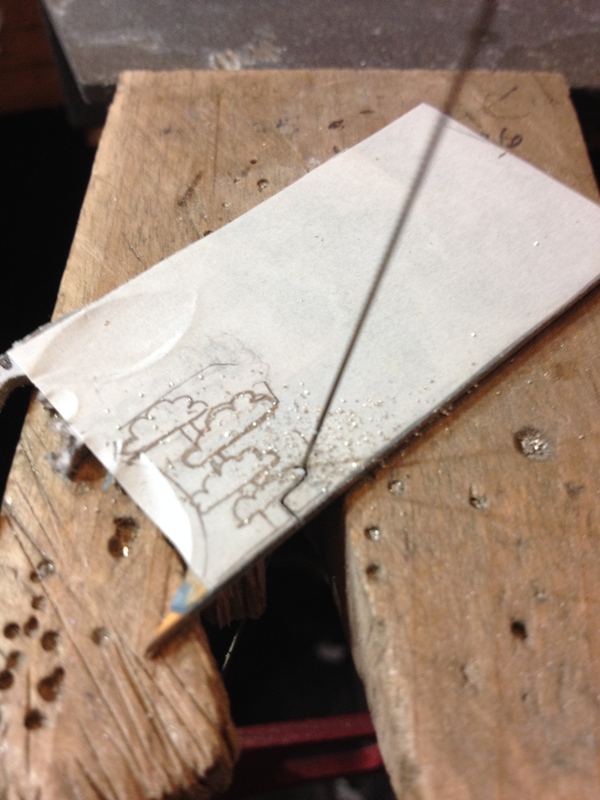 I drew the shape of a tree onto 1.5mm sheet and, very carefully, pierced it out using the piercing saw. 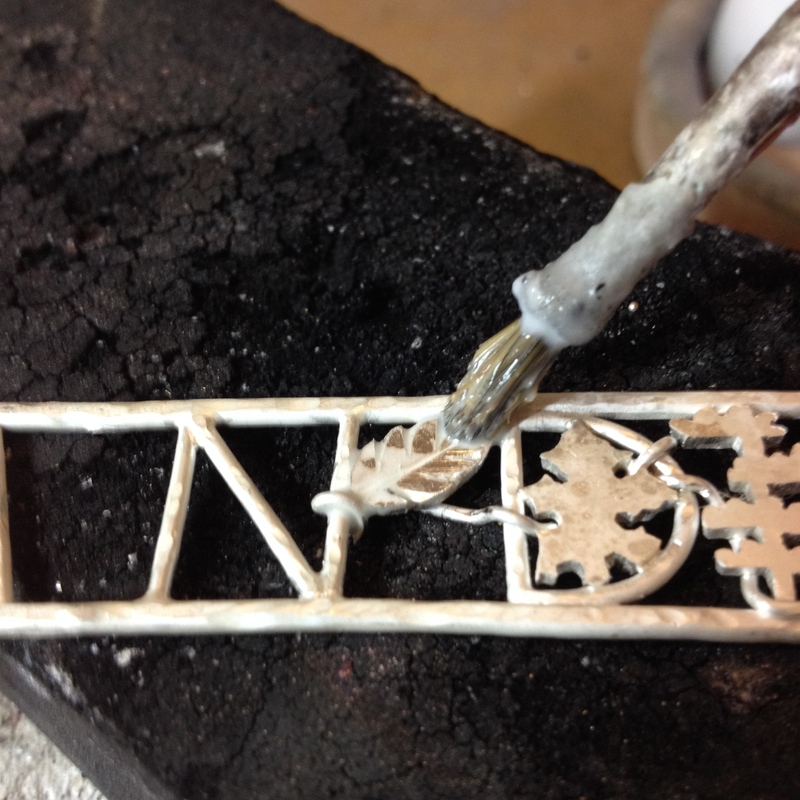 I then added the looping wire around the motifs as I went along. 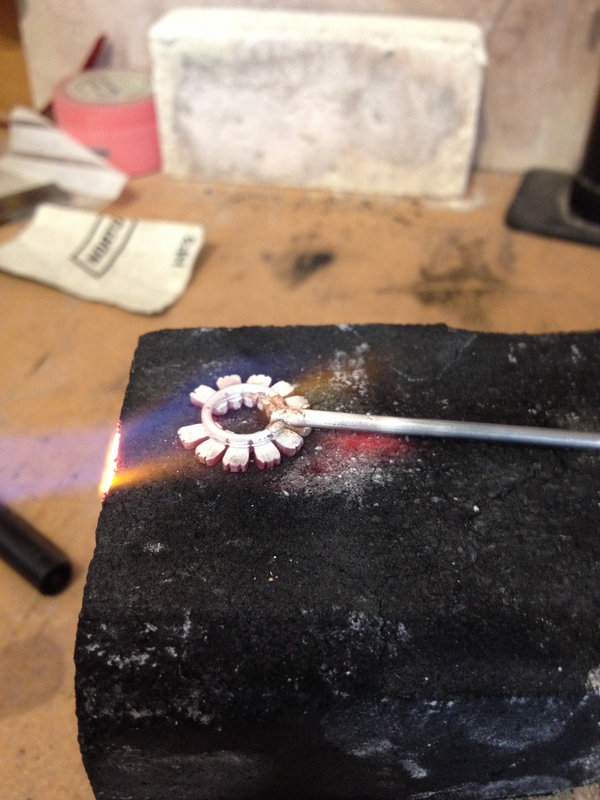 I needed to be careful that the big blowtorch didn’t melt the wire when I was soldering! 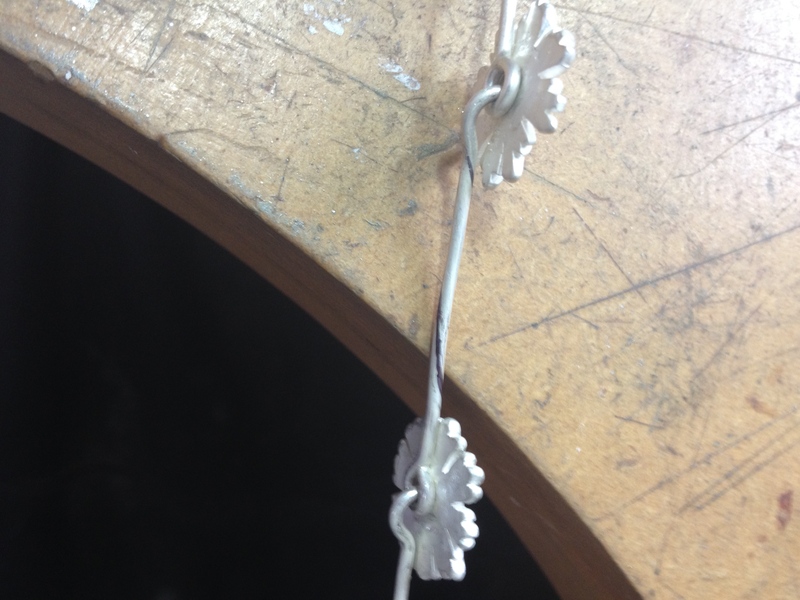 The next motif is a little leaf. 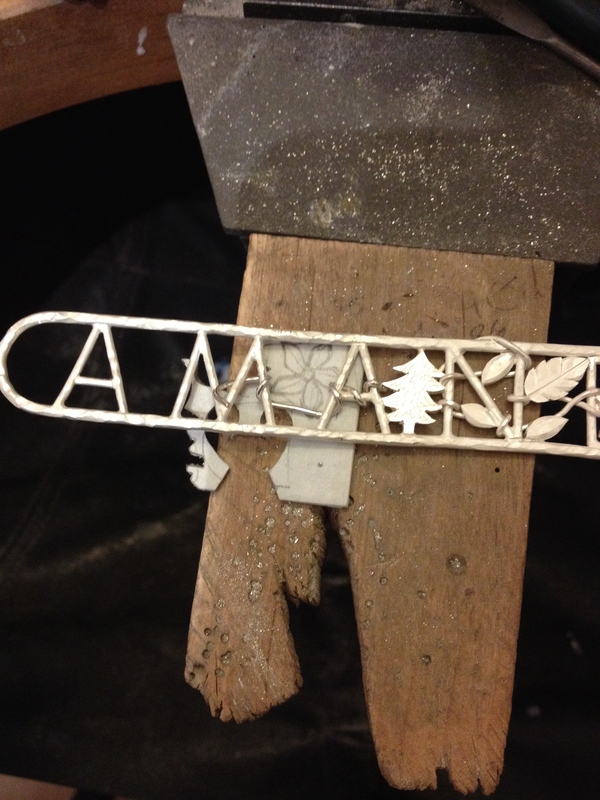 I’m going to carve it from 1.5mm sheet silver. Cut out the shape first. Using the saw, saw a line from tip to base, going about as deep ad the saw blade. 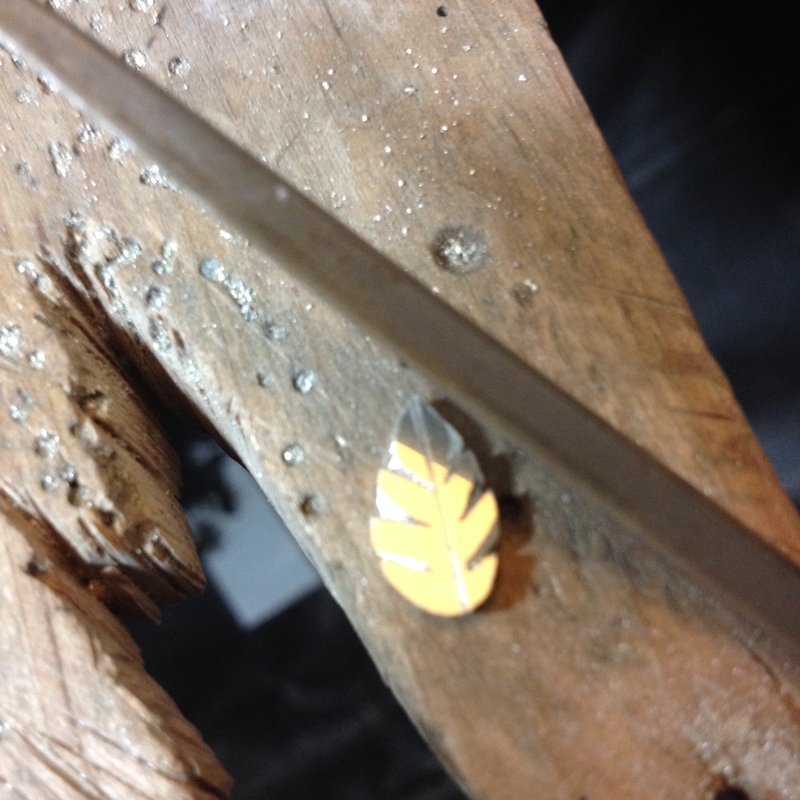 Still using the saw, cut slots for the serrations of the leaf. 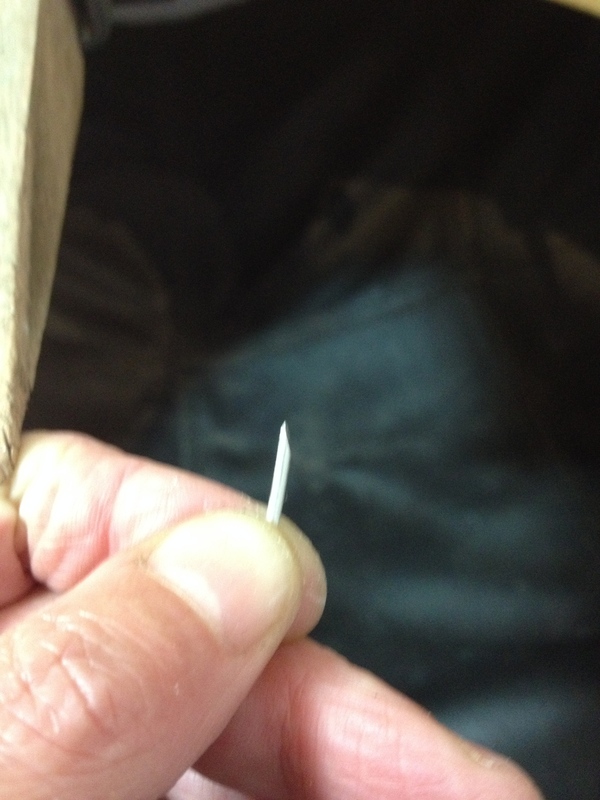 This is the bit that shreds the nails as I need to hold the leaf so my fingers are very close to the saw blade. 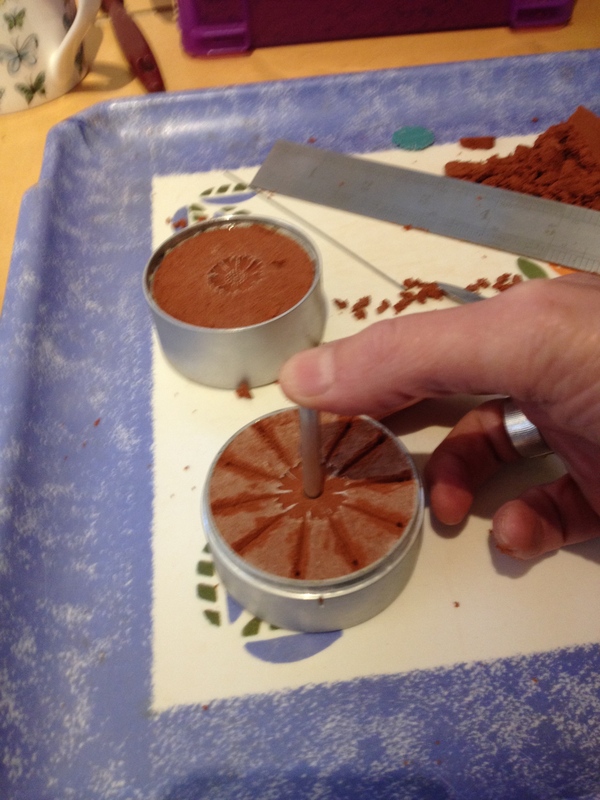 Once the veins are cut use a fine barrette file to round off the edges. This picture shows it half filed. 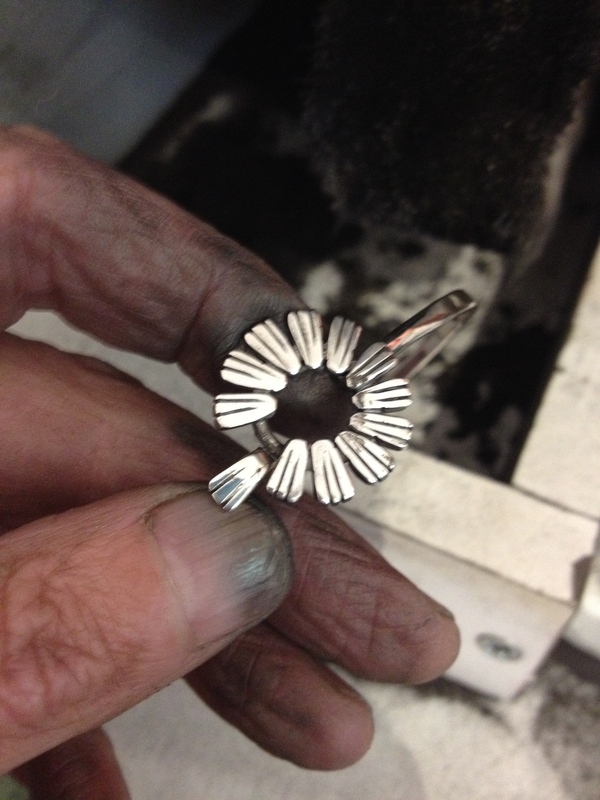 Once it’s finished it needs to be fitted to the cuff, it’s going between the ‘N’ and the ‘A’. Brushe the whole leaf and the adjacent wire with flux. 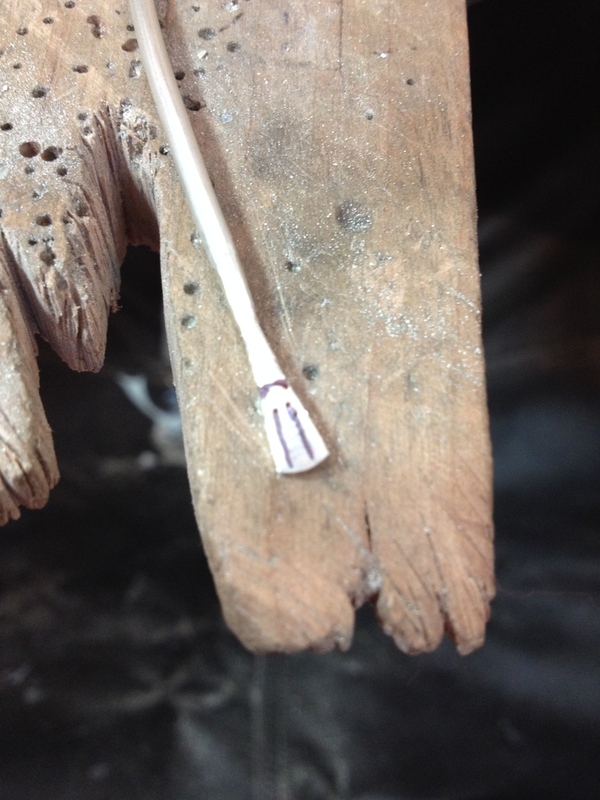 This allows the solder to flow and also protects the surface of the leaf from the dreaded fire stain. The second picture show it after soldering is done. 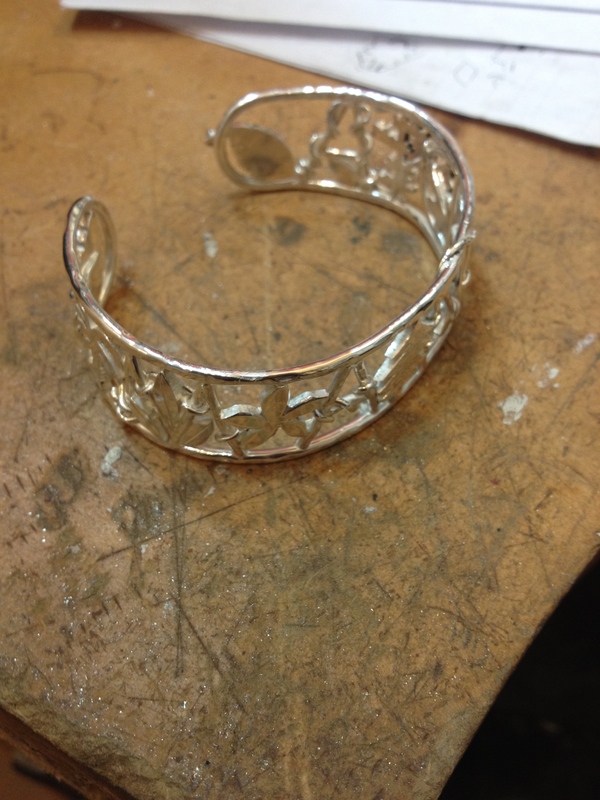 Continue working along the cuff adding motifs and wire. 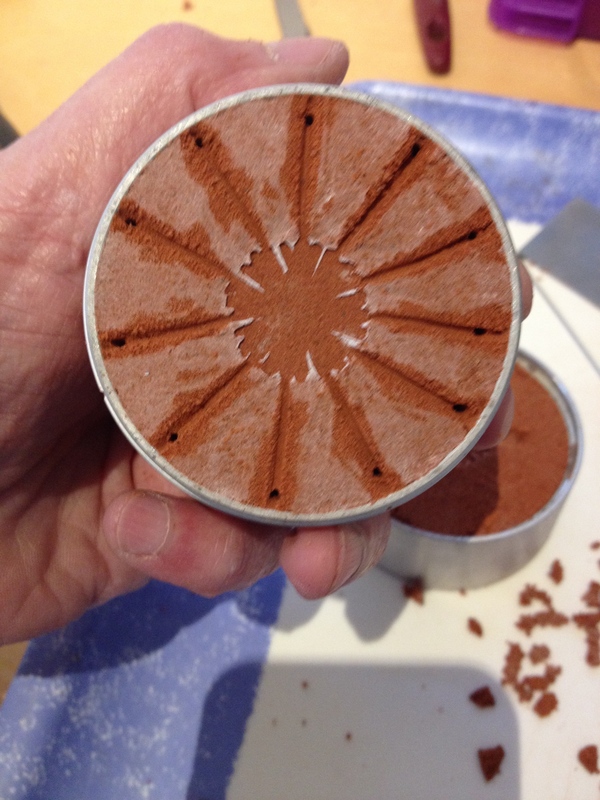 This picture shows a lily flower about to be cut out. There we are, all done. 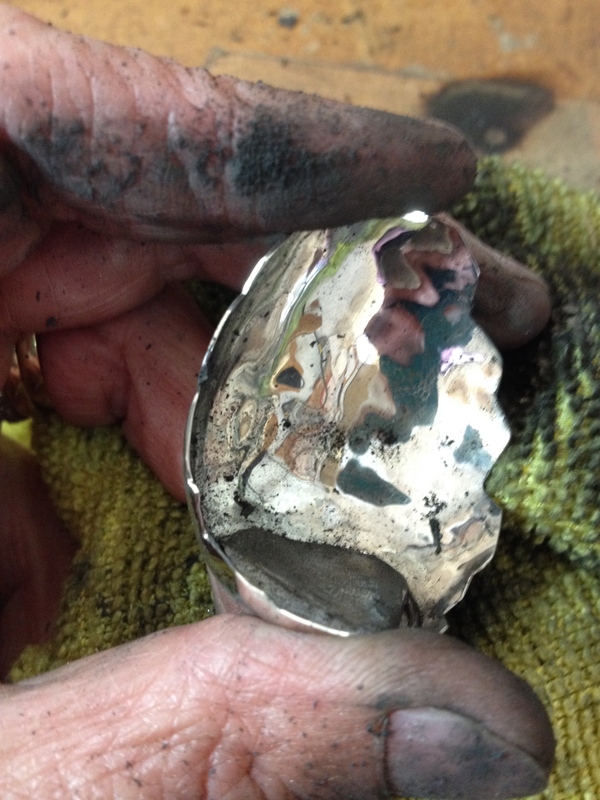 Now is the time to polish it up before bending it into shape. 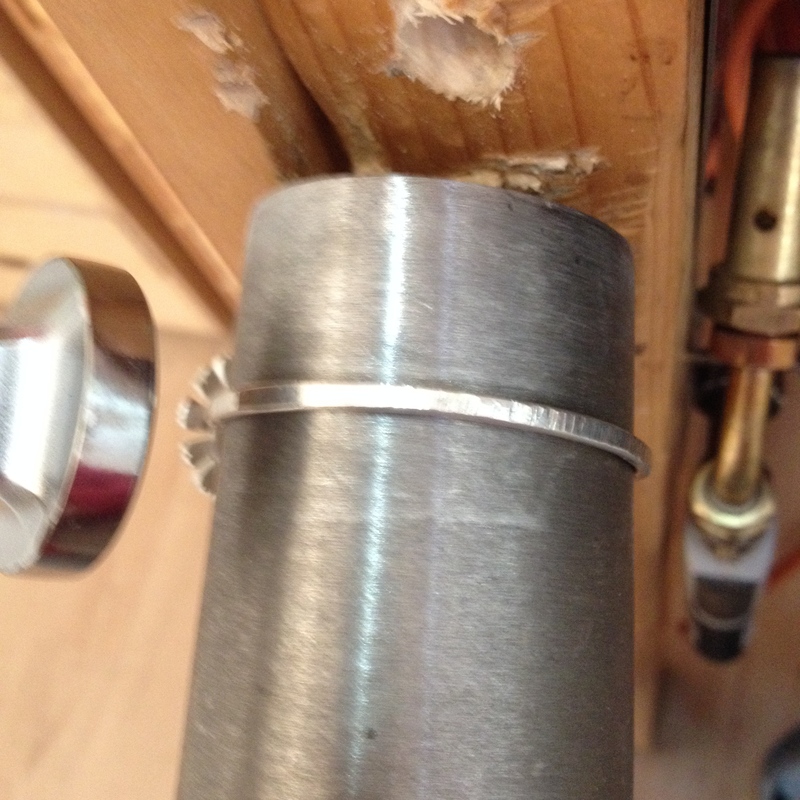 This is where I panic slightly that my solder joints aren’t up to scratch and will come apart with the pressure. Phew! That bent ok and I think it looks lovely. 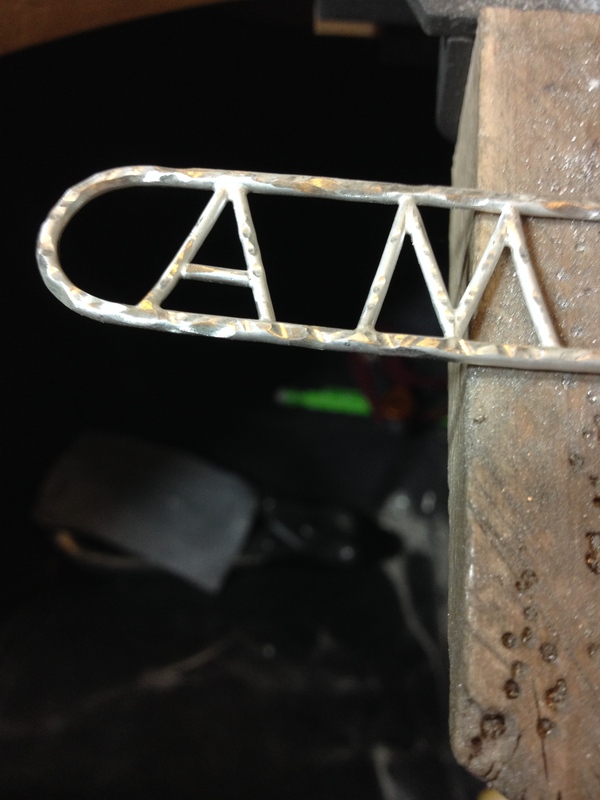 This entry was posted in bracelets, work in progress and tagged 2mm wire. 1.5mm wire., Bracelet. Forming. 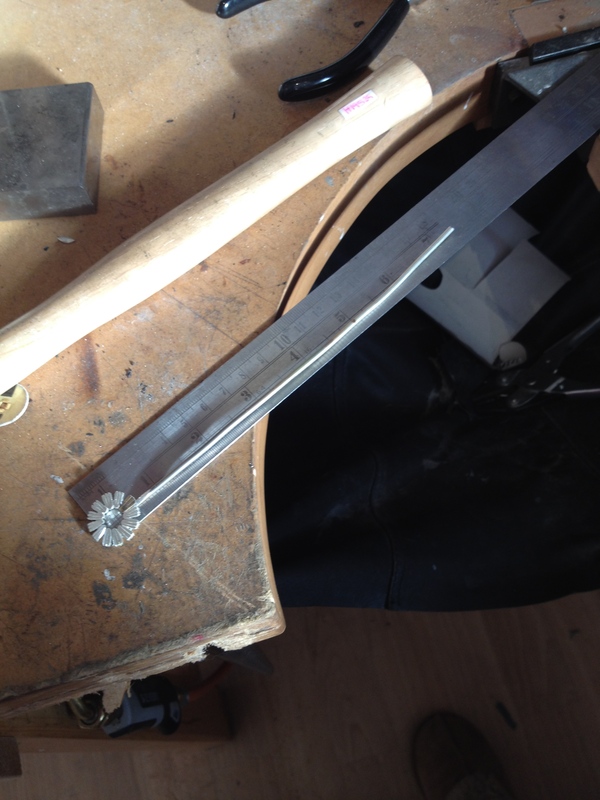 Bangle mandrel, Cuff, filing, hand made, jewellery, leaves, making, piercing saw, polishing, trees on October 28, 2014 by deecraven.